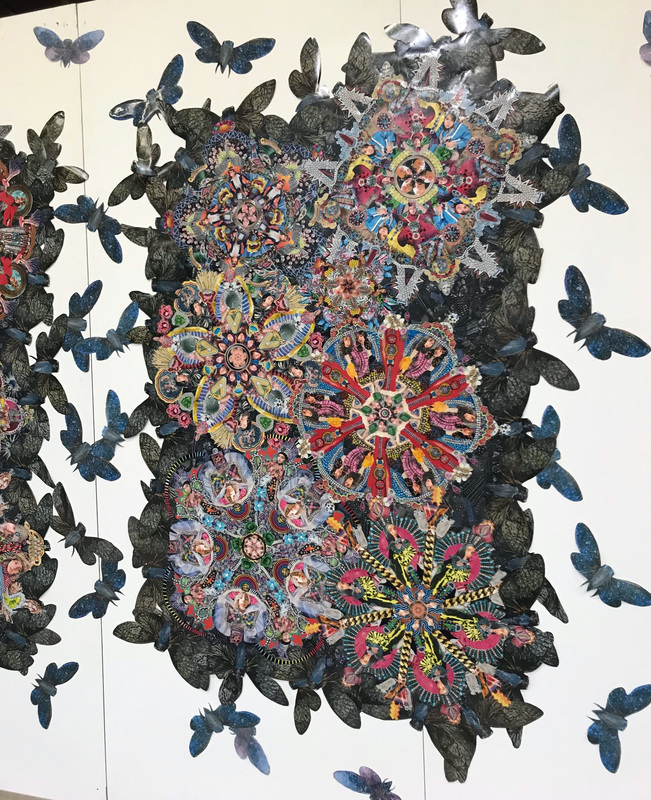 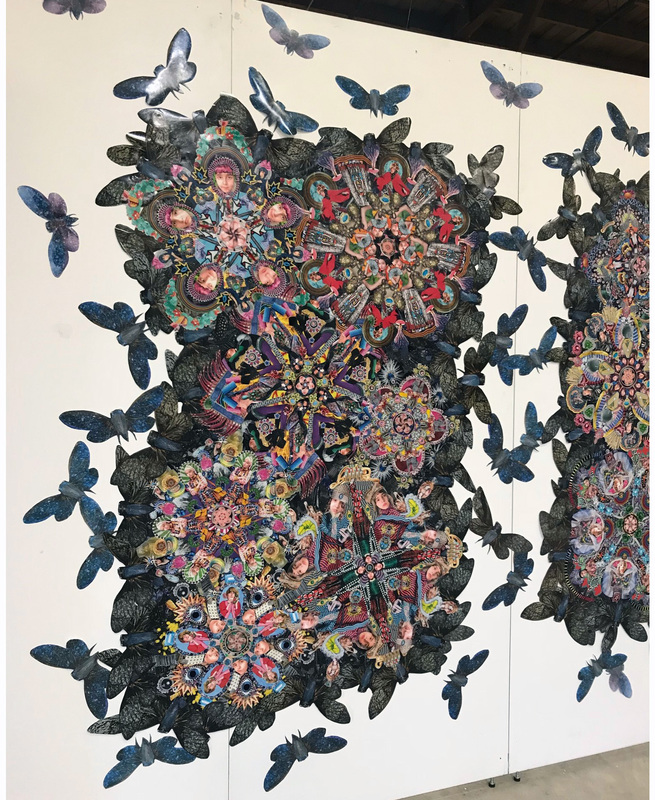 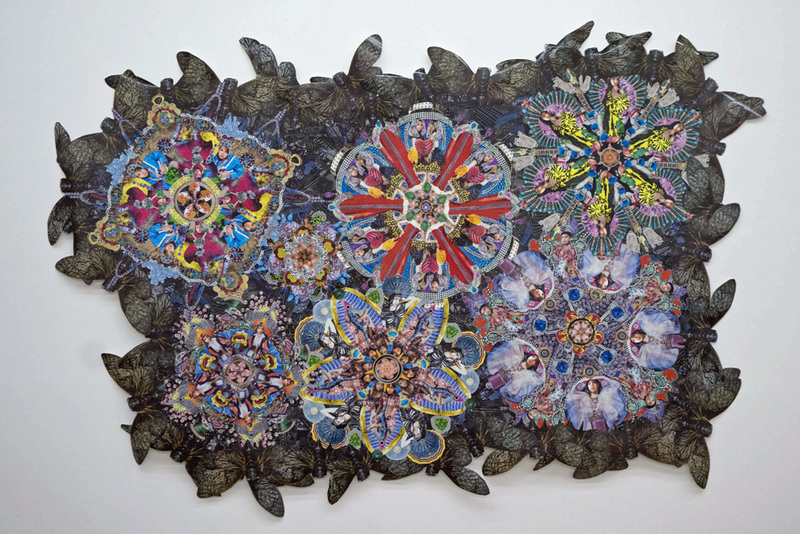 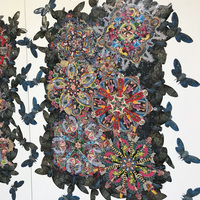 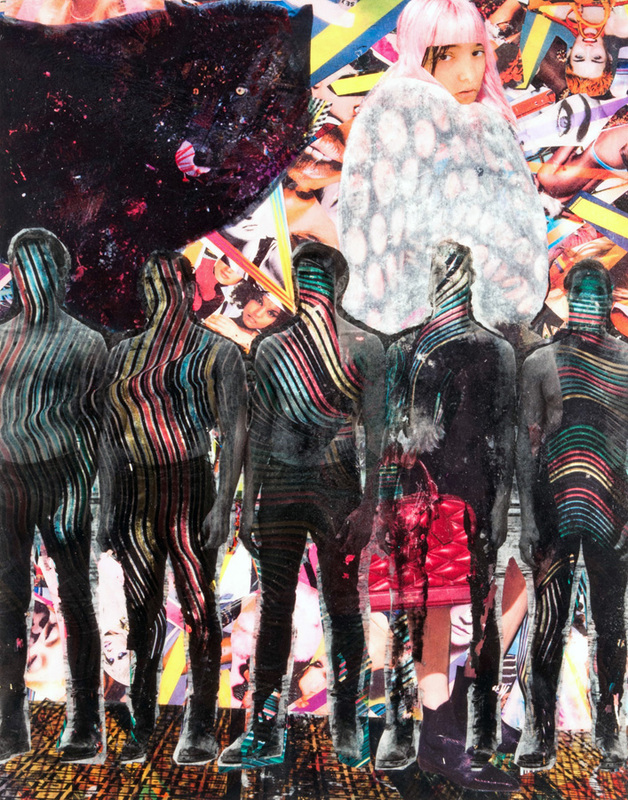 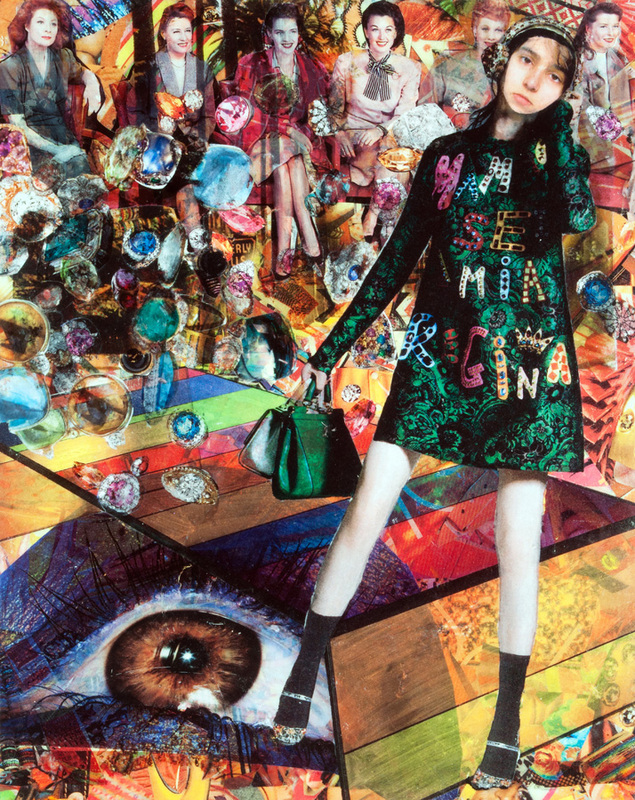 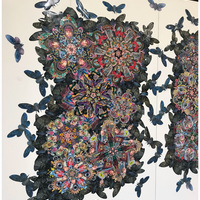 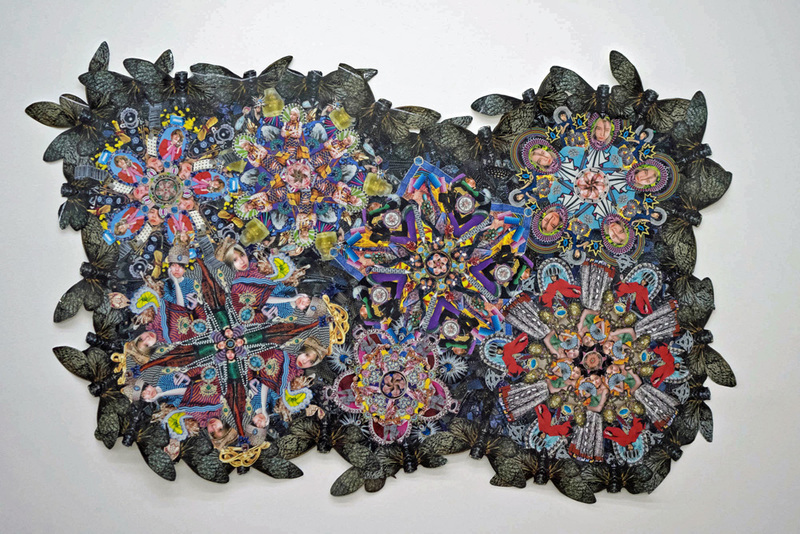 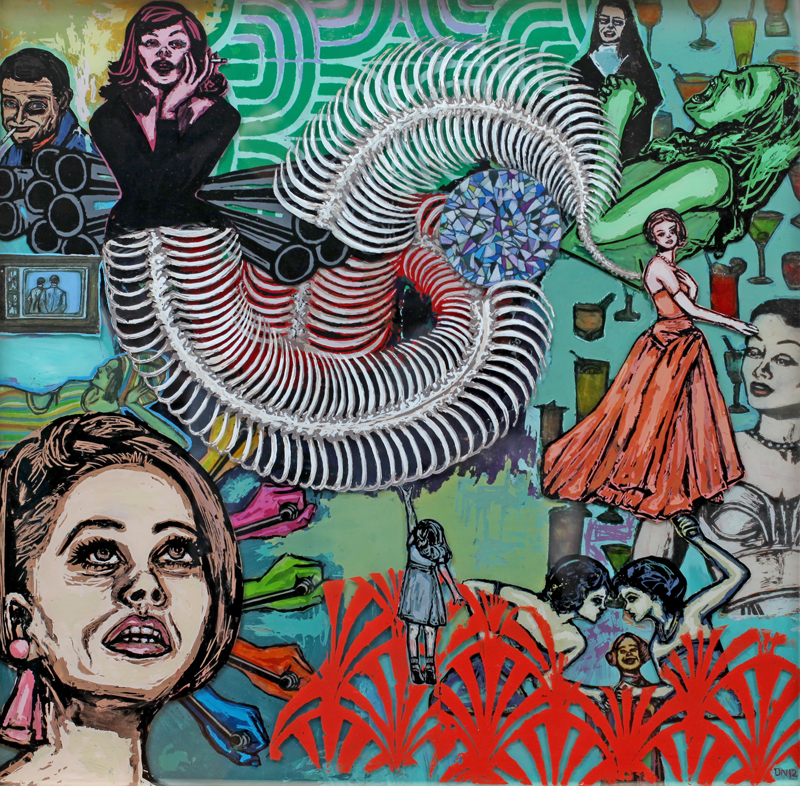 Installation view, If You Can't See Me I Can't See You, 2018, 90"x145", collage, transfer and acrylic under and over mylar. 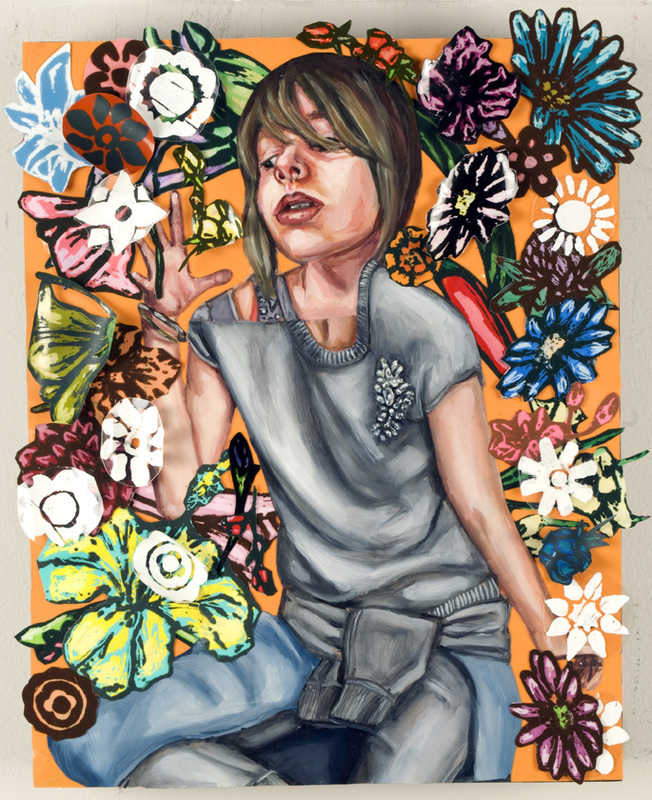 I Can't See You, 2017, approx. 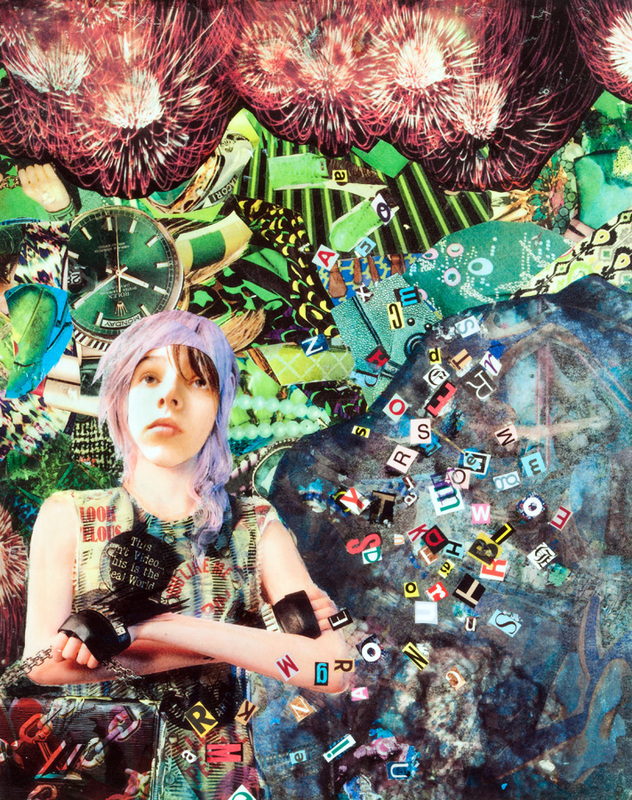 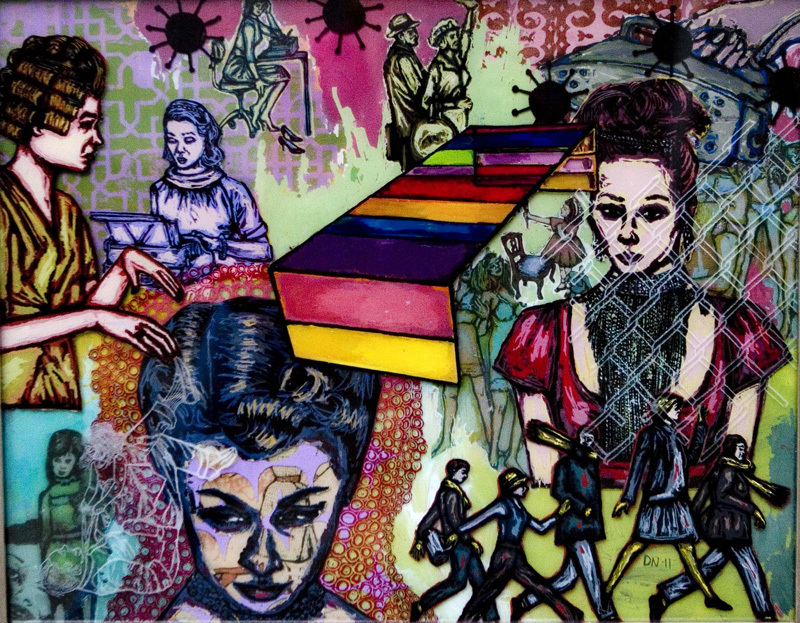 45"x70", collage, transfer and acrylic over and under Mylar sheet. 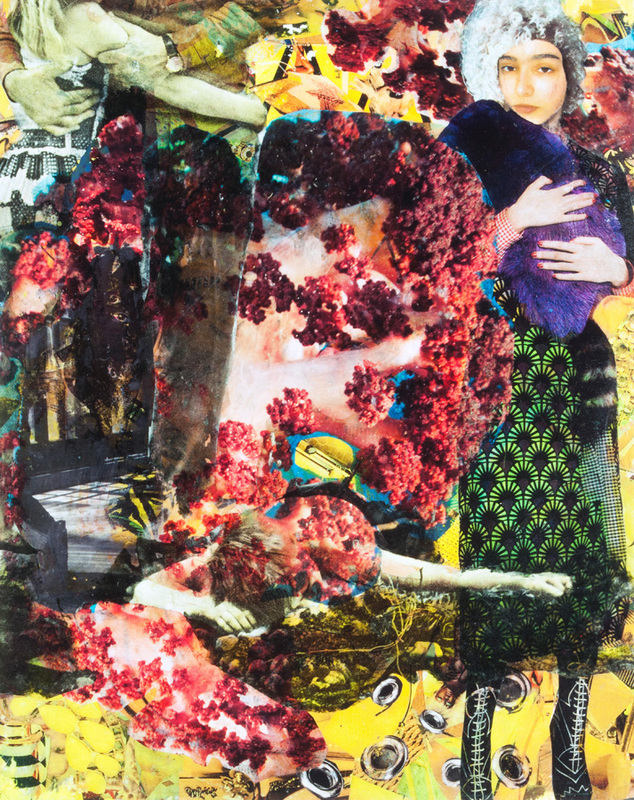 Detail, I Can't See You, 2017, collage, transfer and acrylic over and under Mylar sheet. 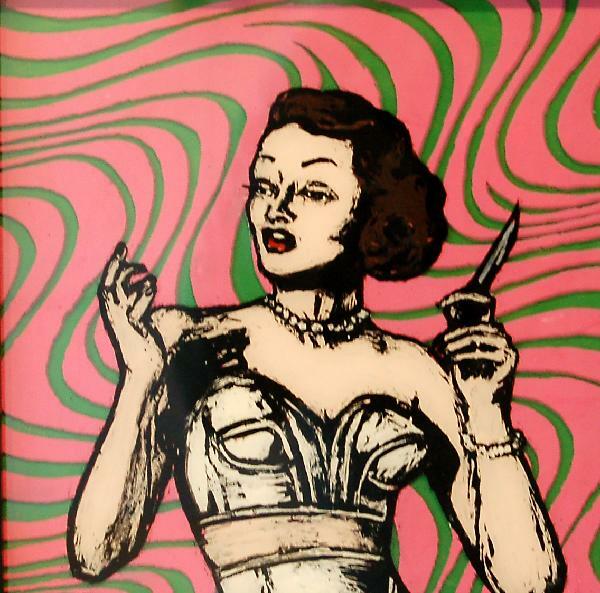 She Knows, 2017, approx. 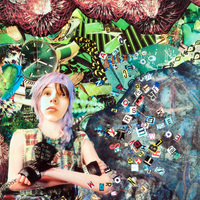 63"at highest x70", collage, transfer and acrylic over and under Mylar sheet. 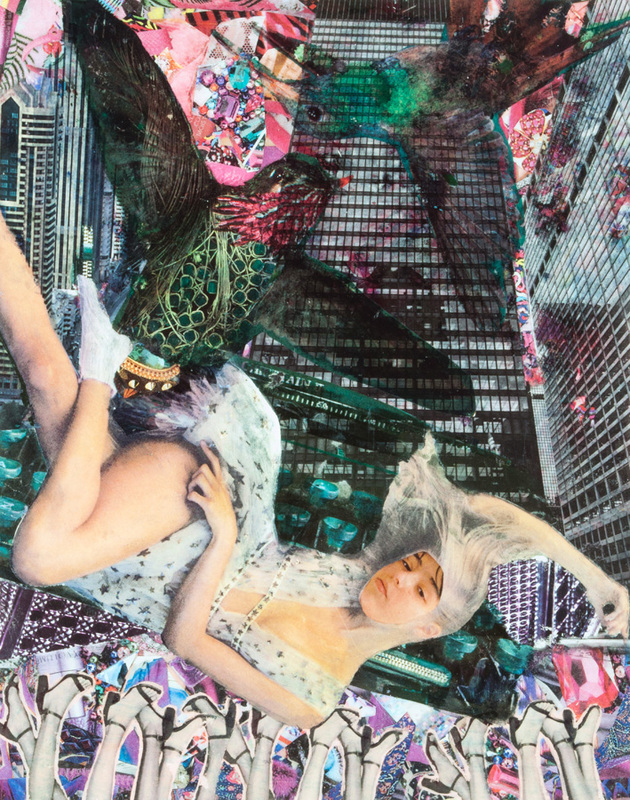 Detail, She Knows, 2017, collage, transfer and acrylic over and under Mylar sheet. 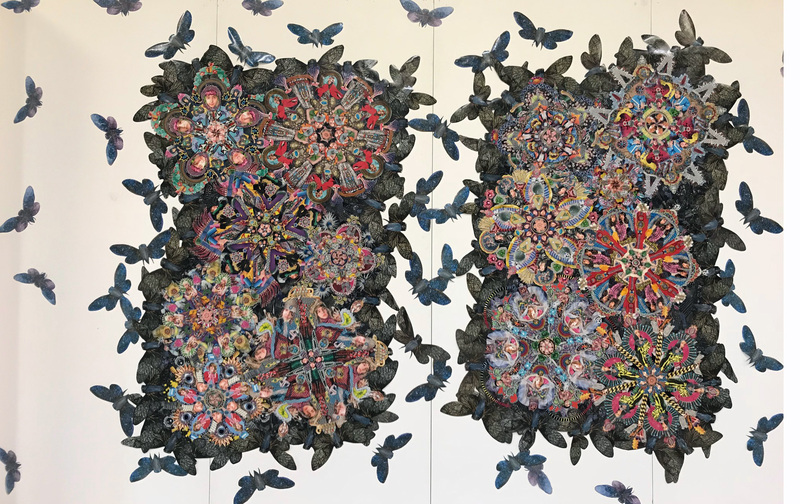 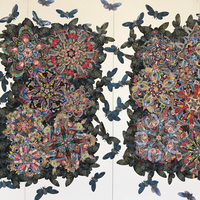 Mirror Beasts1, 2015 and 2017, approx. 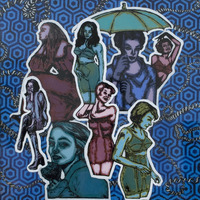 25"x25", screenprint, acrylic, mirror, and Mylar on wood panel. Mirror Beasts2, 2017, approx. 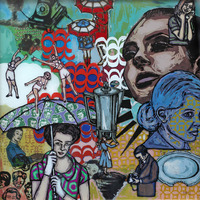 25"x25", screenprint, acrylic, mirror, transfer and Mylar mounted on wood panel. 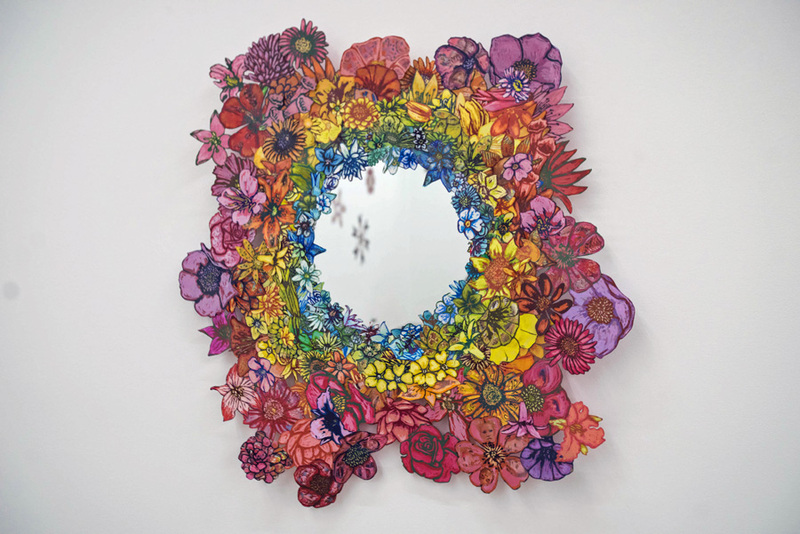 Mirror Beasts3, 2017, approx. 25"x25", screenprint, acrylic, mirror, transfer, Mylar mounted on wood panel. 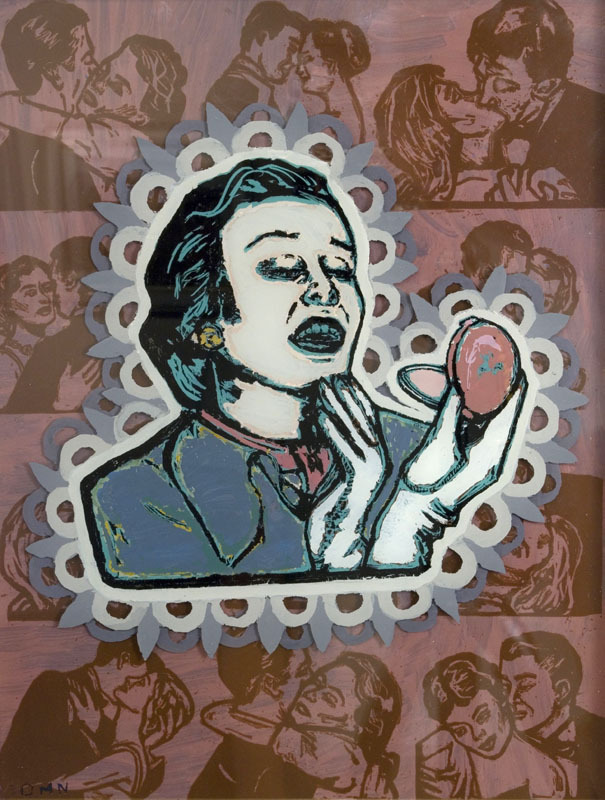 Not The Face1, 2017, 15"x12", ink, acrylic, transfer, and Mylar on wood panel. 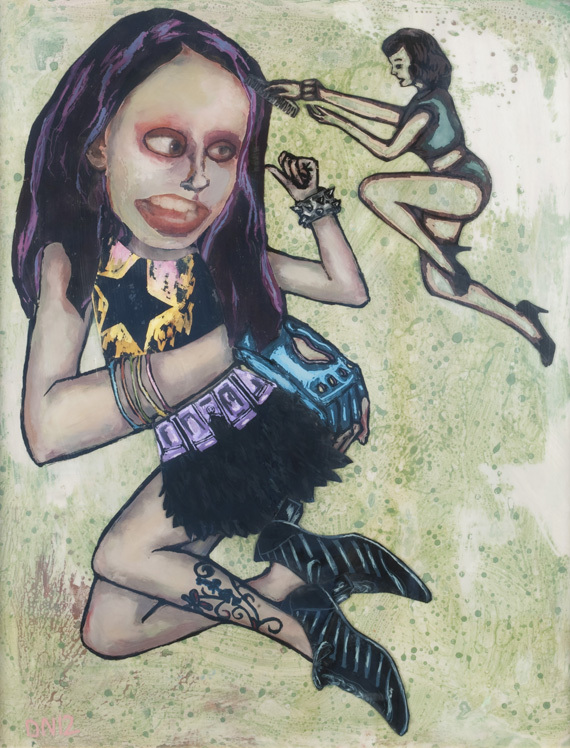 Not The Face2, 2017, 15"x12", ink, acrylic, transfer and Mylar on wood panel. 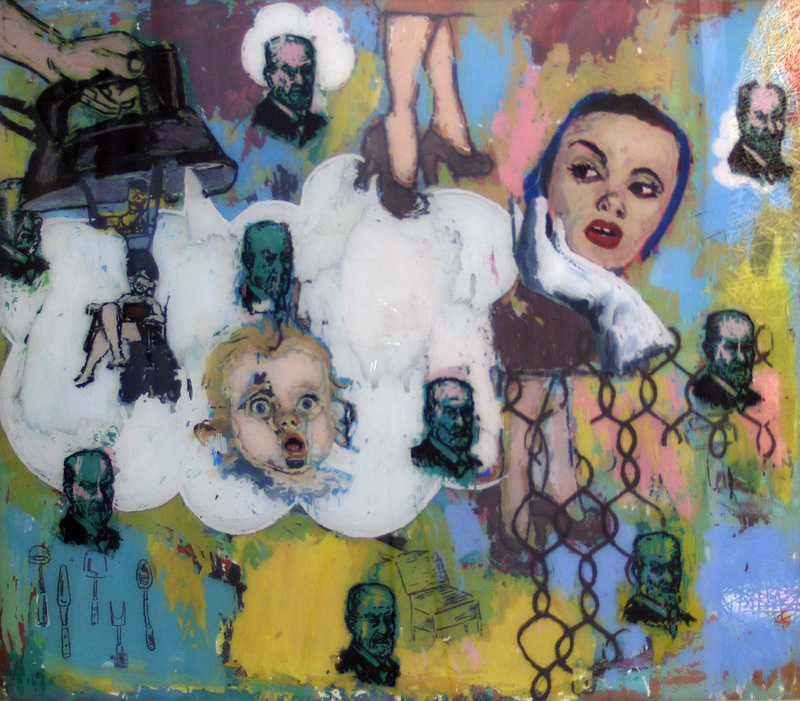 Not The Face5, 2017, 15"x12", ink, acrylic, transfer and Mylar on wood panel. 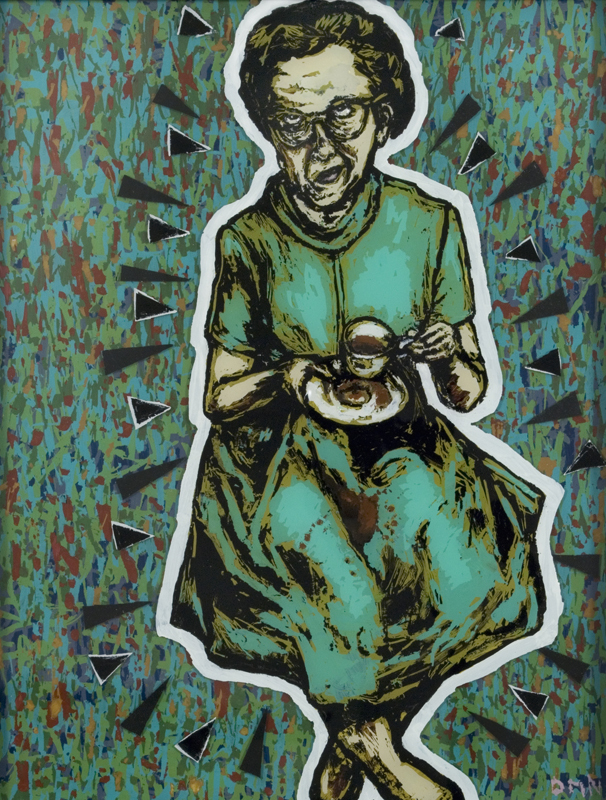 Not The Face3, 2017, 15"x12", ink, acrylic, transfer and Mylar on wood panel. 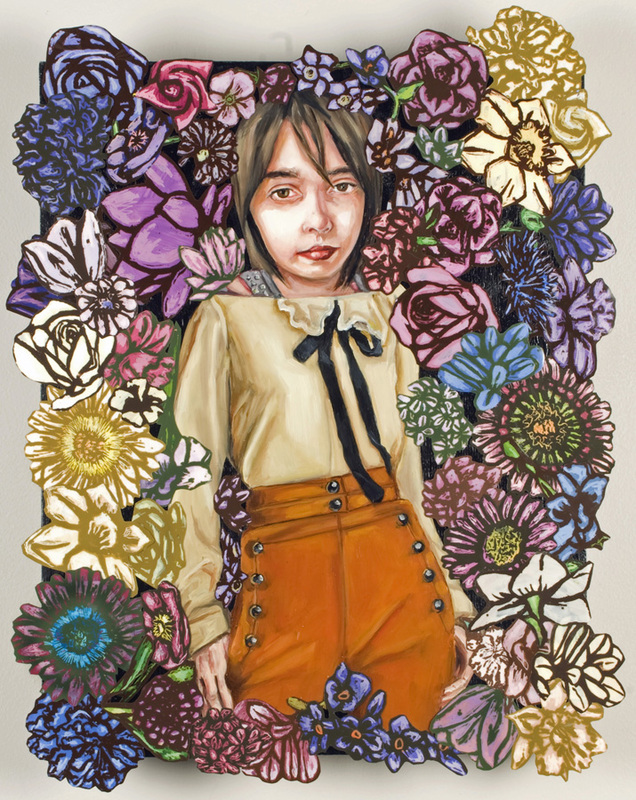 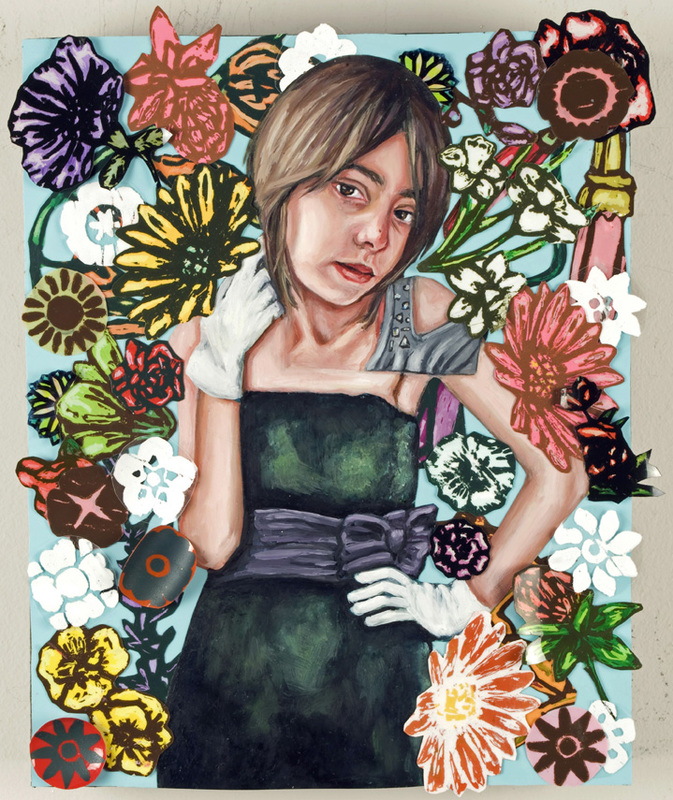 Flower/Shop1, 2015, 14"x11", Mylar, oil, acrylic, and screenprint on wood panel. 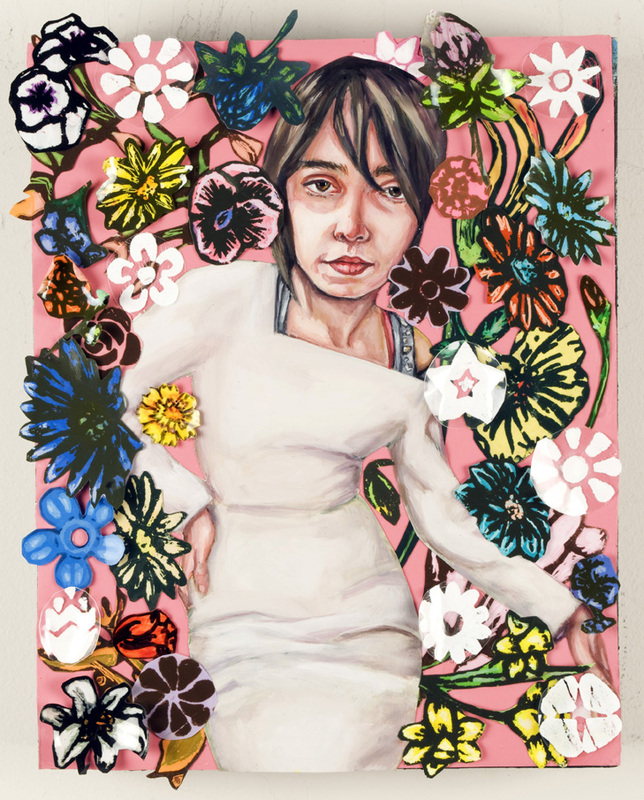 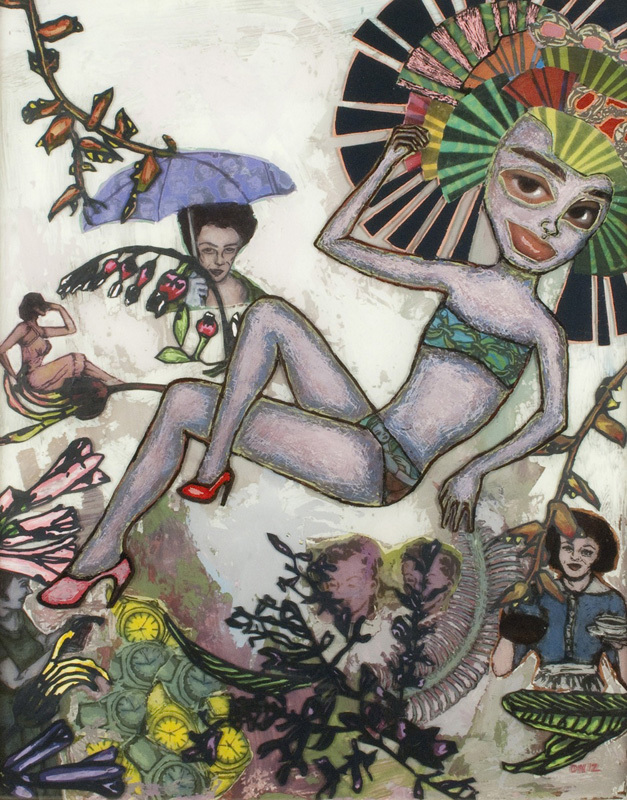 Flower/Shop2, 2015, 14"x11", Mylar, oil, acrylic and screenprint on wood panel. 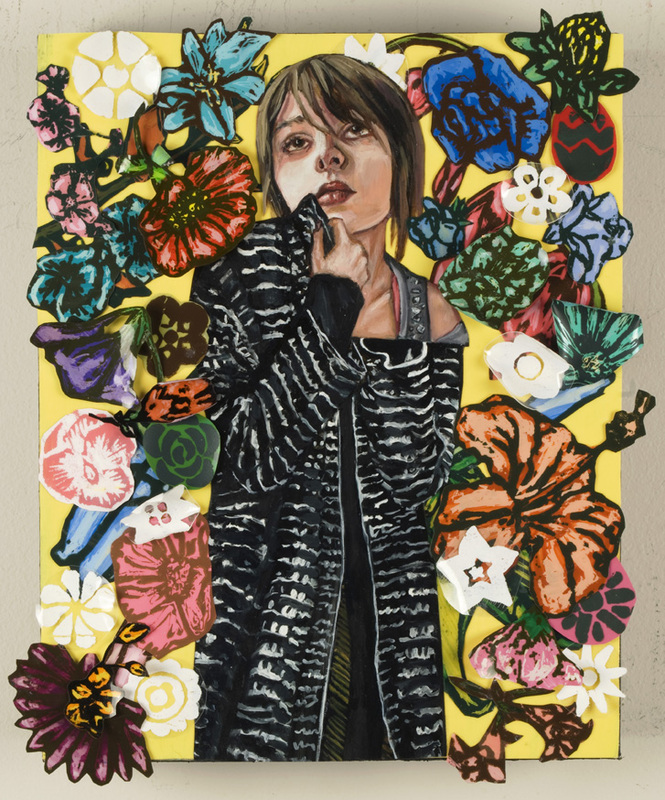 Flower/Shop3, 2015, 14"x11", Mylar, oil, acrylic and screenprint on wood panel. 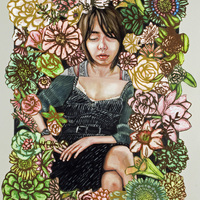 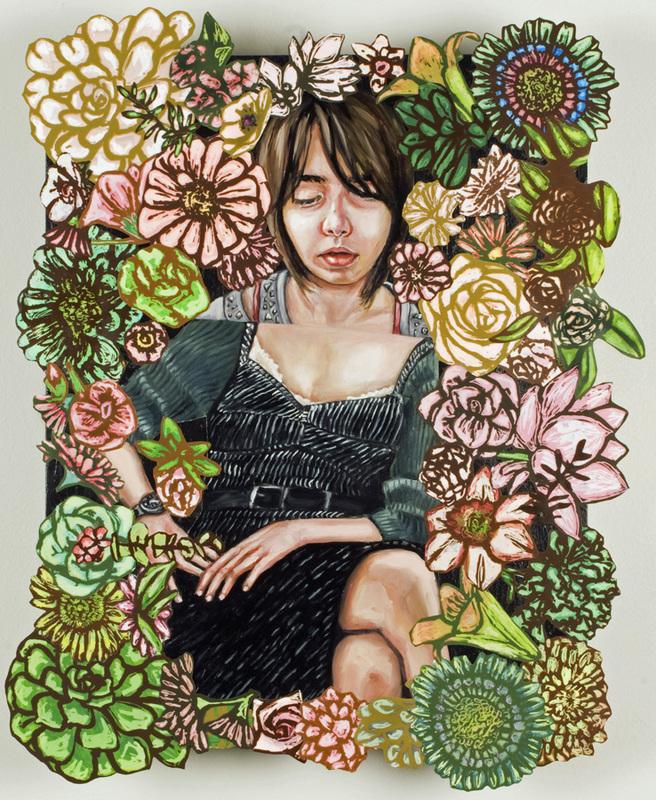 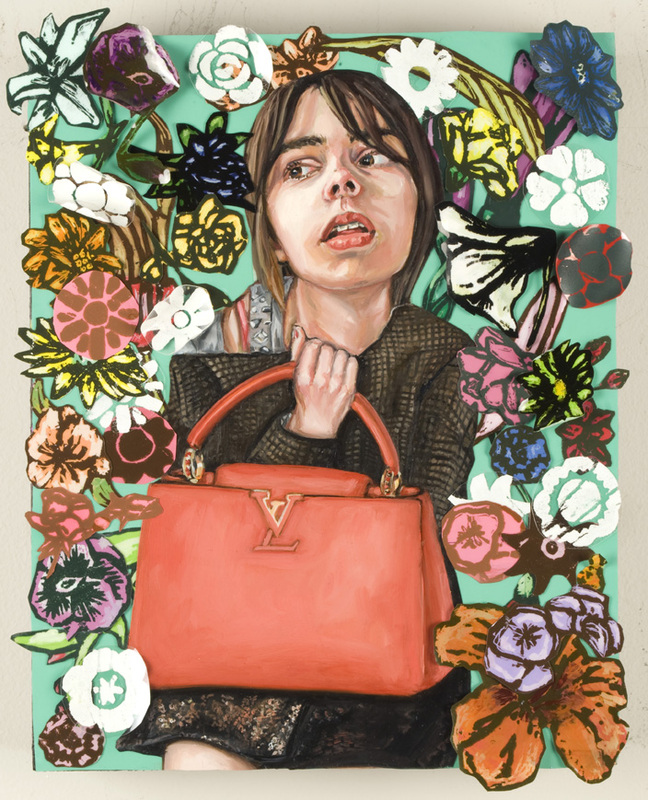 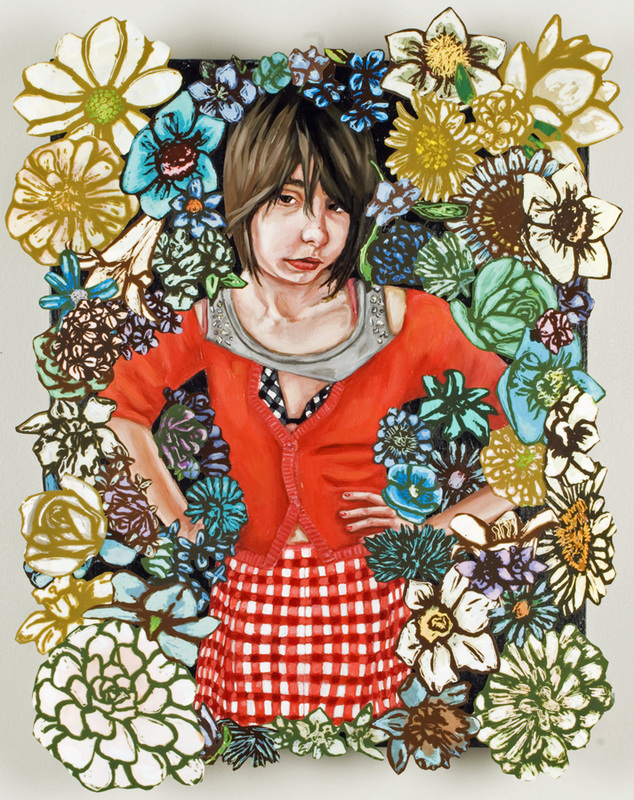 Flower/Shop4, 2015, 14"x11", Mylar, oil, acrylic and screenprint on wood panel. 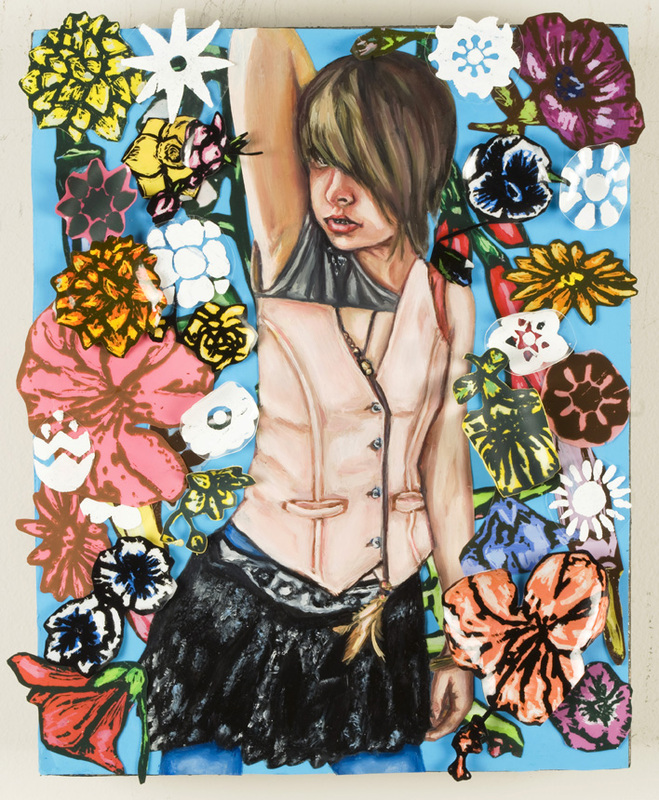 Flower/Shop5, 2015, 14"x11", Mylar, oil, acrylic and screenprint on wood panel. 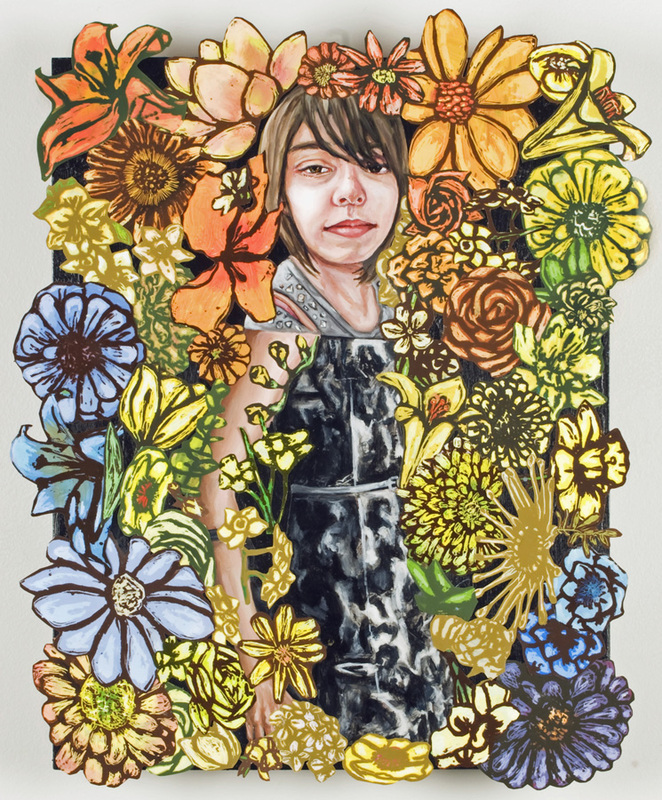 Flower/Shop6, 2015, 14"x11", Mylar, oil, acrylic and screenprint on wood panel. 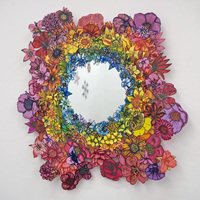 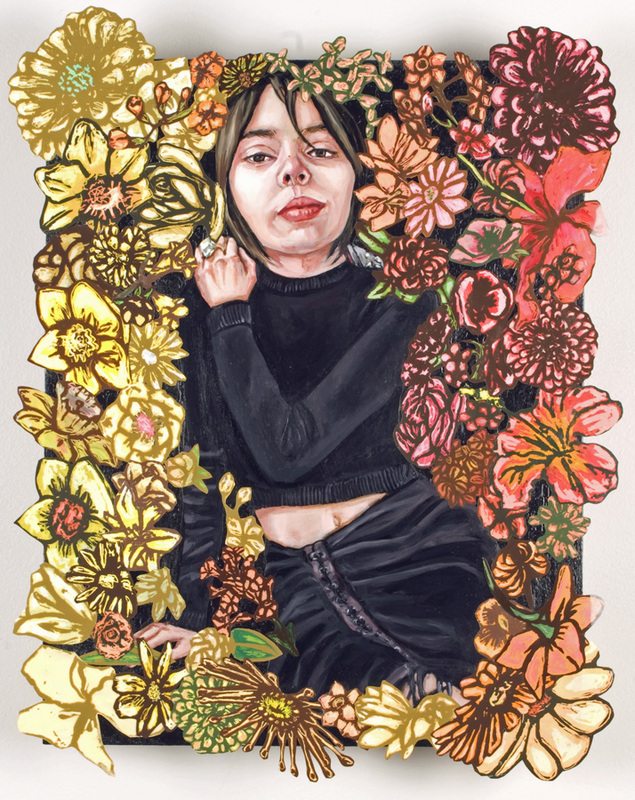 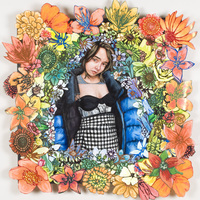 Flower/Shop7, 2015, 14"x11", Mylar, oil, acrylic and screenprint on wood panel. 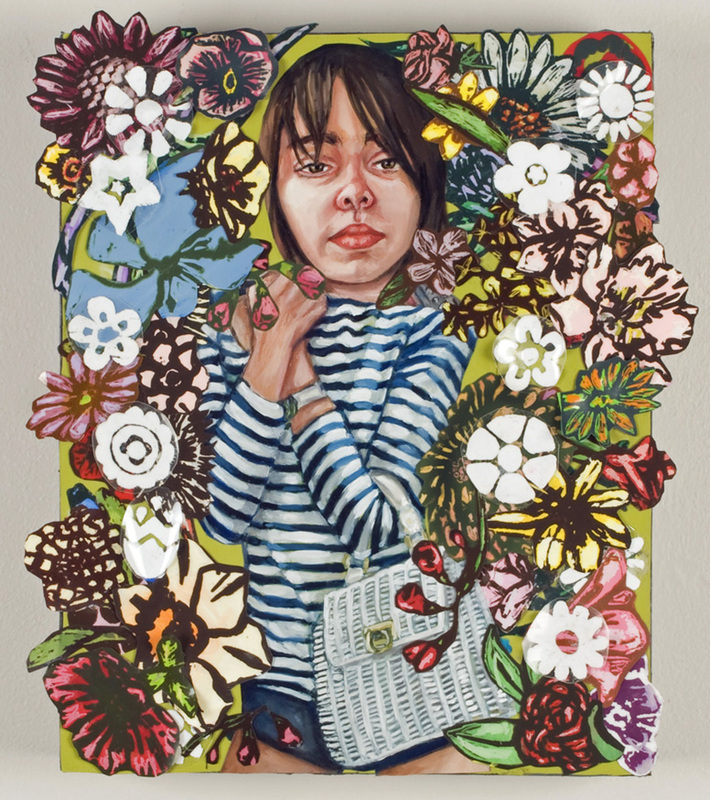 Flower/Shop8, 2015, 14"x11", Mylar, oil, acrylic and screenprint on wood panel. 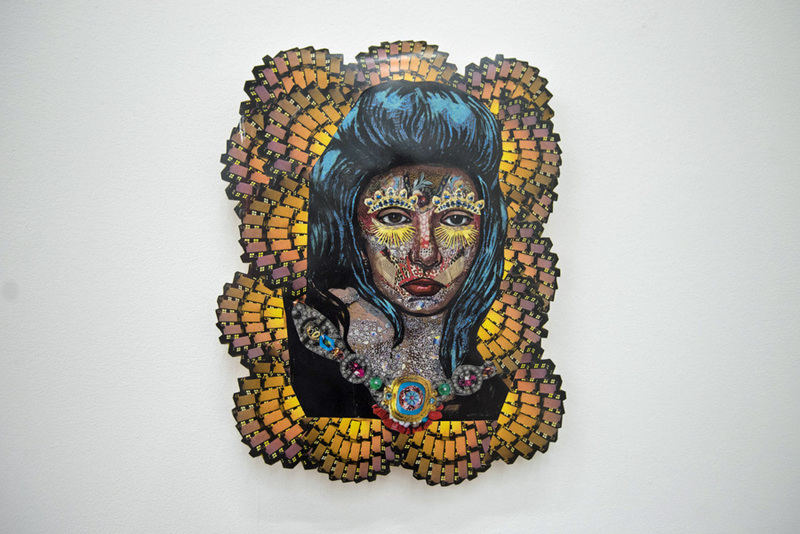 Cellophane1, 2015, 10"x8", Mylar, oil, acrylic and screenprint on wood panel. 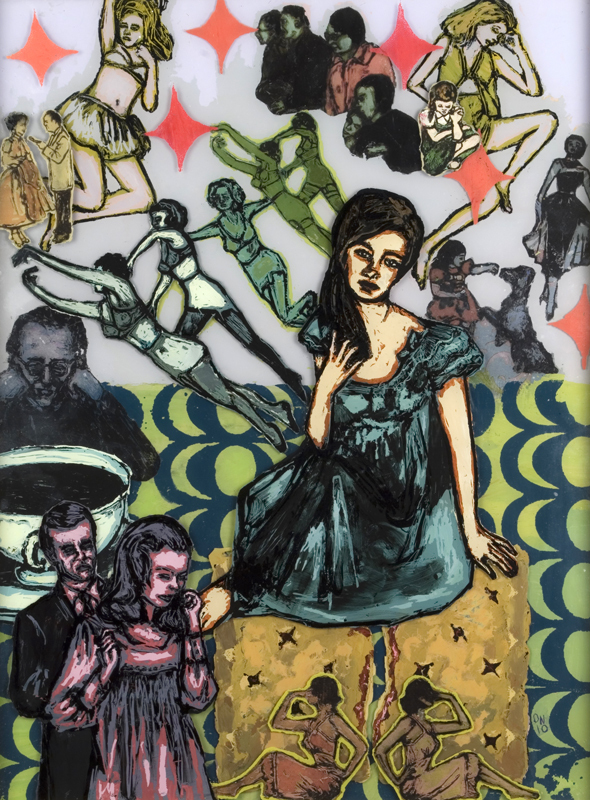 Cellophane2, 2015, 10"x8", Mylar, oil, acrylic and screenprint on wood panel. 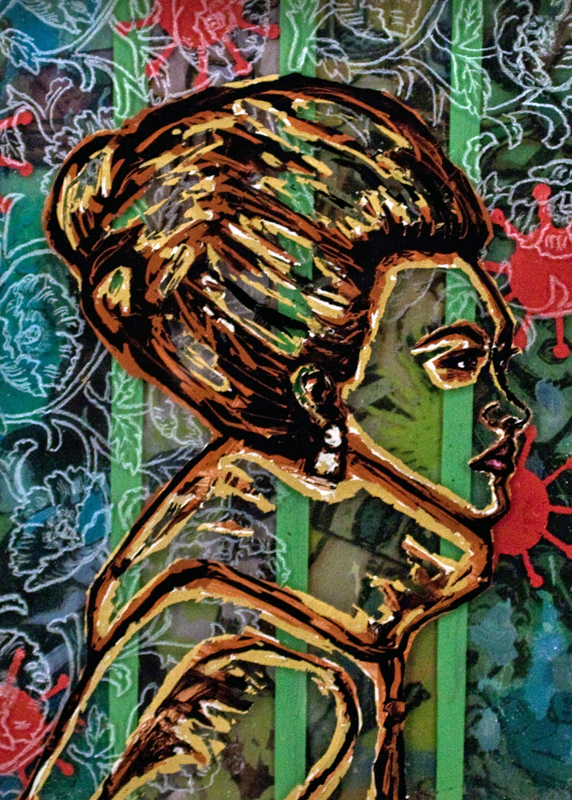 Cellophane3, 2015, 10"x8", Mylar, oil, acrylic and screenprint on wood panel. 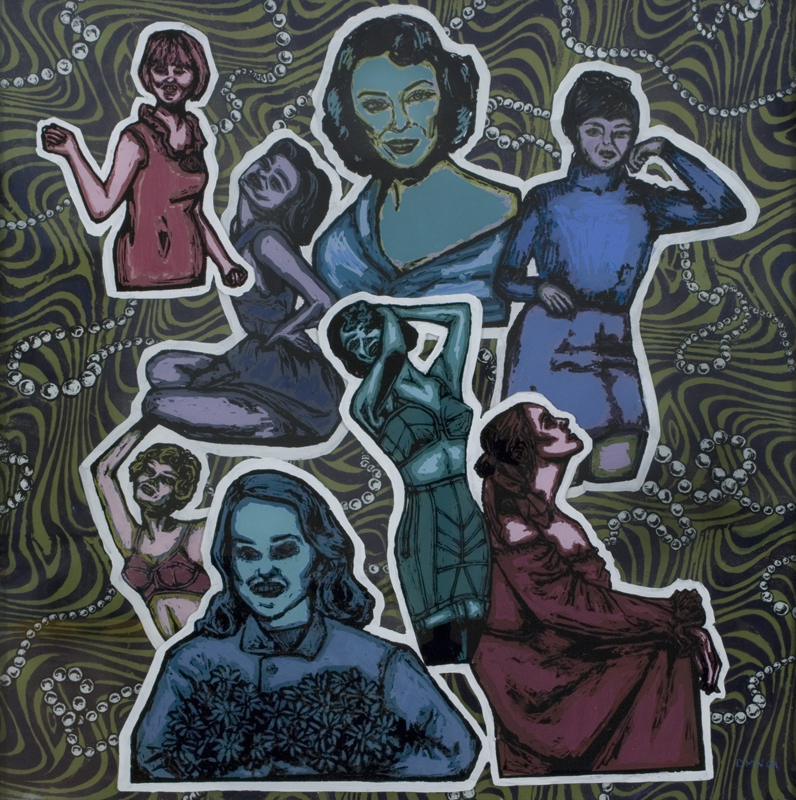 Cellophane4, 2015, 10"x8", Mylar, oil, acrylic and screenprint on wood panel. Cellophane5, 2015, 10"x8", Mylar, oil, acrylic and screenprint on wood panel. 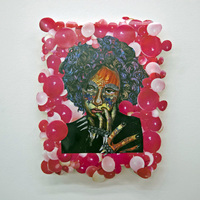 Cellophane6, 2015, 10"x8", Mylar, oil, acrylic and screenprint on wood panel. 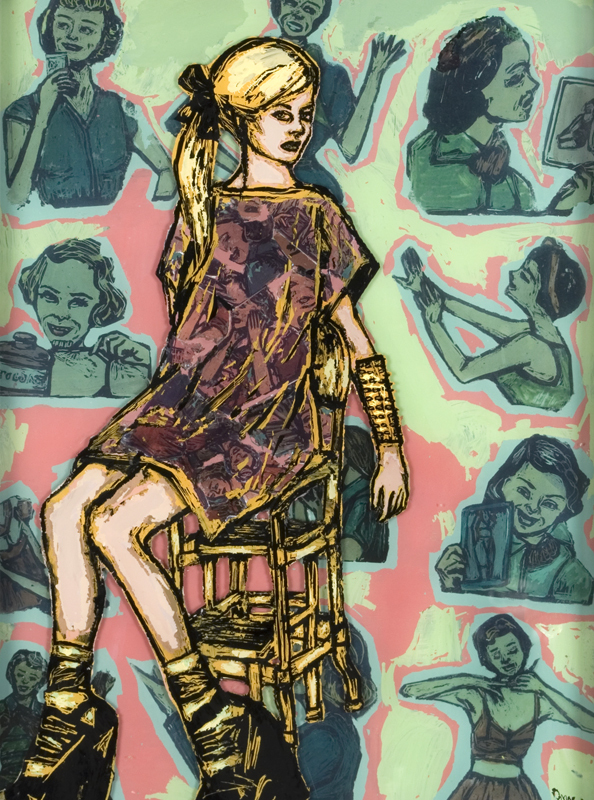 Cellophane7, 2015, 10"x8", Mylar, oil, acrylic and screenprint wood panel. 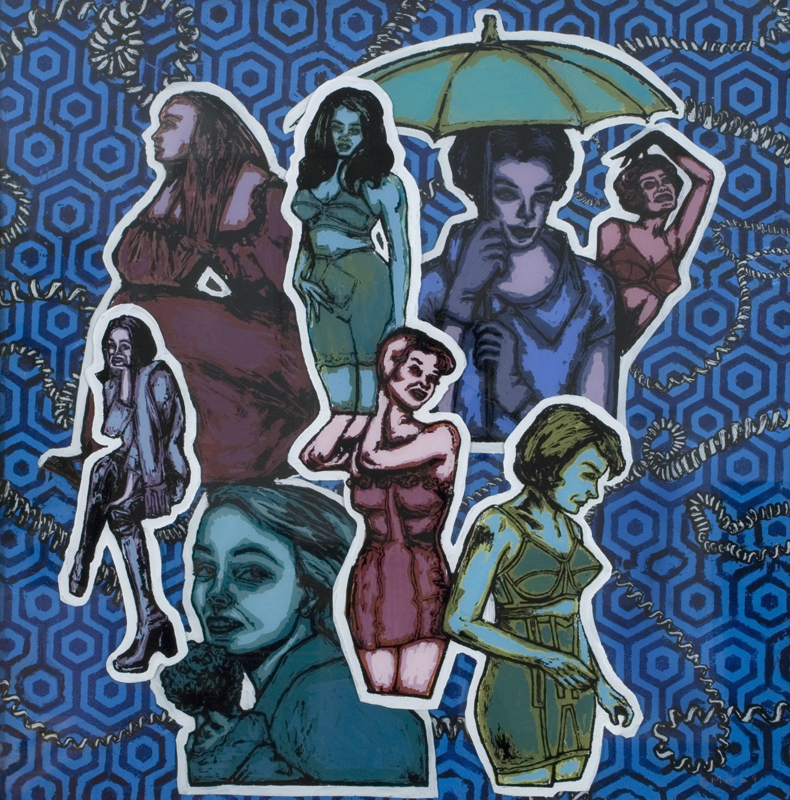 Cellophane8, 2015, 10"x8", Mylar, oil, acrylic and screenprint on wood panel. 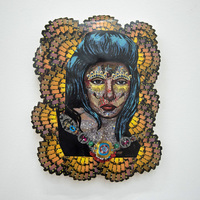 Cellophane9, 2015, 10"x8", Mylar, oil, acrylic and screenprint on wood panel. 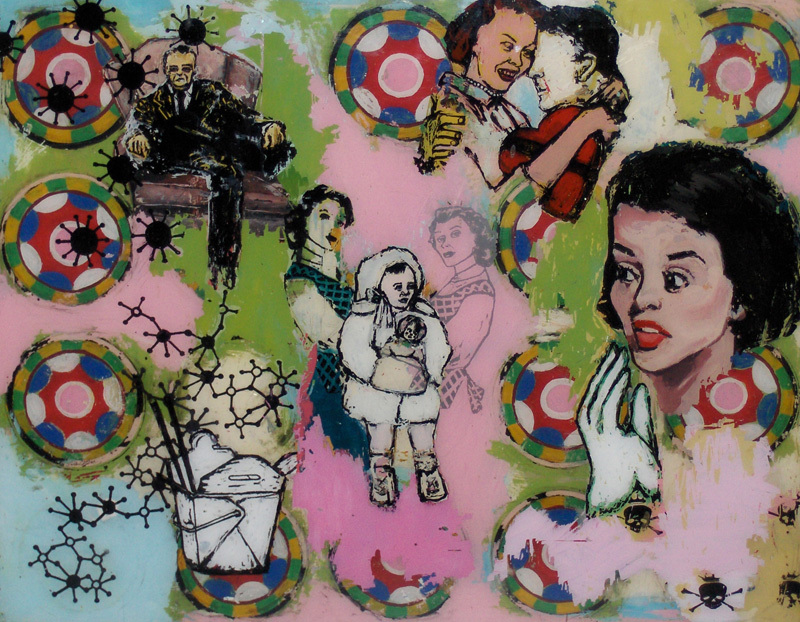 Cellophane10, 2015, 10"x8", Mylar, oil, acrylic and screenprint on wood panel. 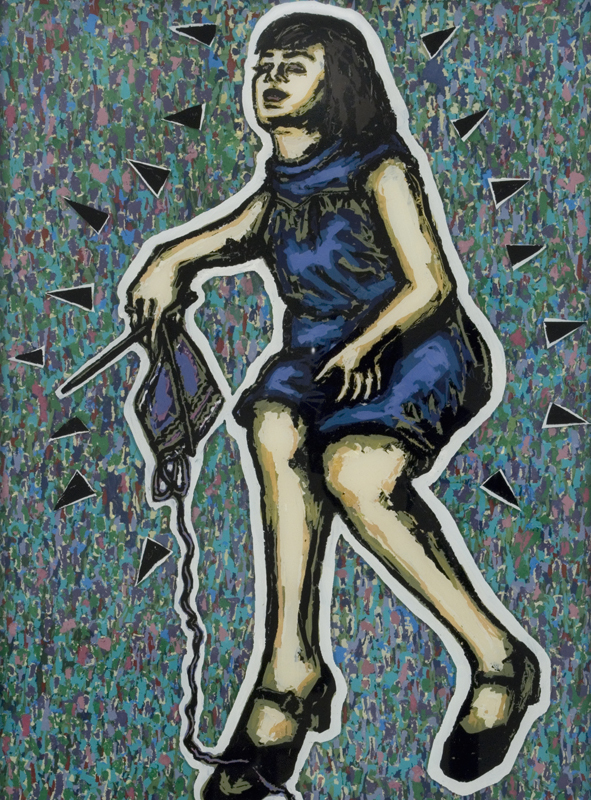 Drama Llama 1, 2014, 10"x8" Oil, Mylar, transfer, screenprint and plastic gems on metallic-foiled wood panel. Drama Llama 5, 2014, 10"x8", Oil, Mylar, transfer, screenprint and plastic gem on metallic-foiled wood panel. 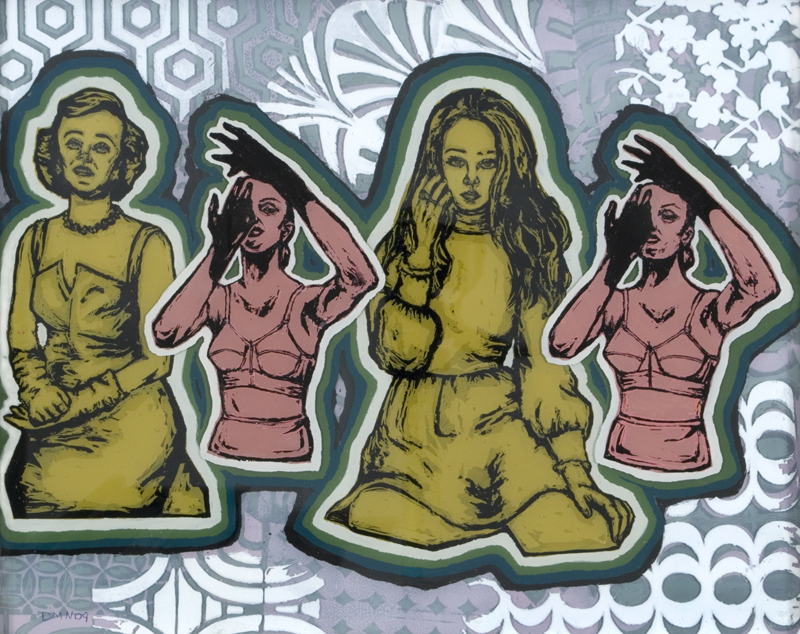 Drama Llama 6, 2014, 10"x8", Oil, Mylar, transfer, screenprint and plastic gems on metallic-foiled wood panel. 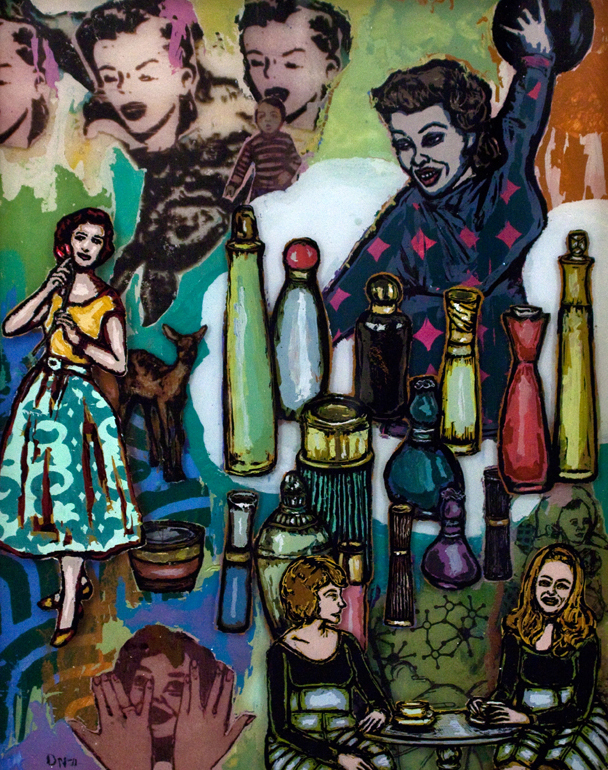 Drama Llama 9, 2014, 10"x8", Oil, Mylar, transfer, screenprint and plastic gems on metallic-foiled wood panel. 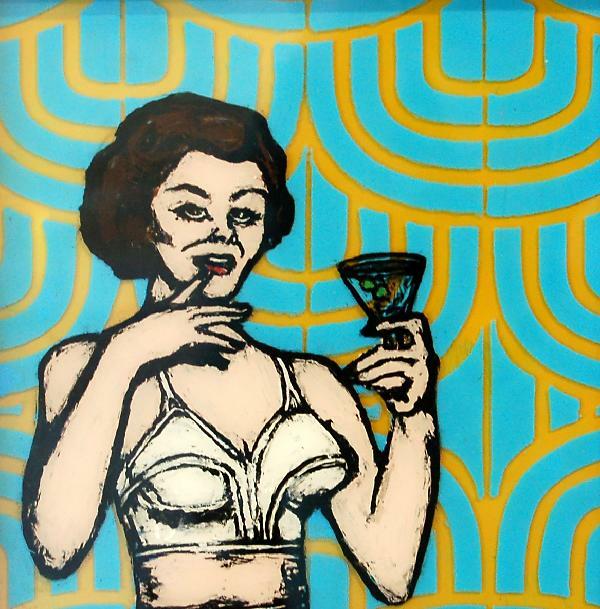 Drama Llama 10, 2014, 10"x8", Oil, Mylar, transfer and screenprint on metallic-foiled wood panel. 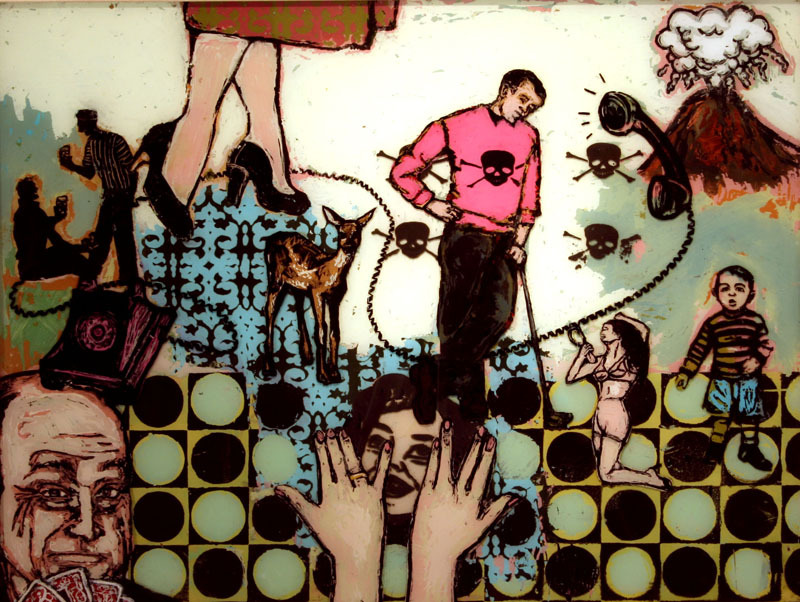 Mouse Trap Whatever, 2013, 30"x30", Ink, acrylic, screenprint, ink and photo transfer, spray paint, glitter, metallic foil and mylar on two sheets of plexiglass. 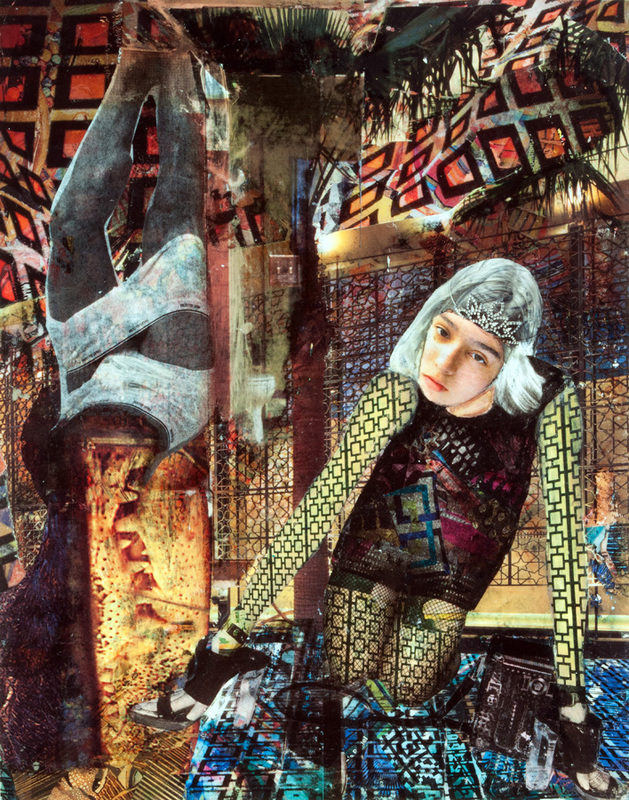 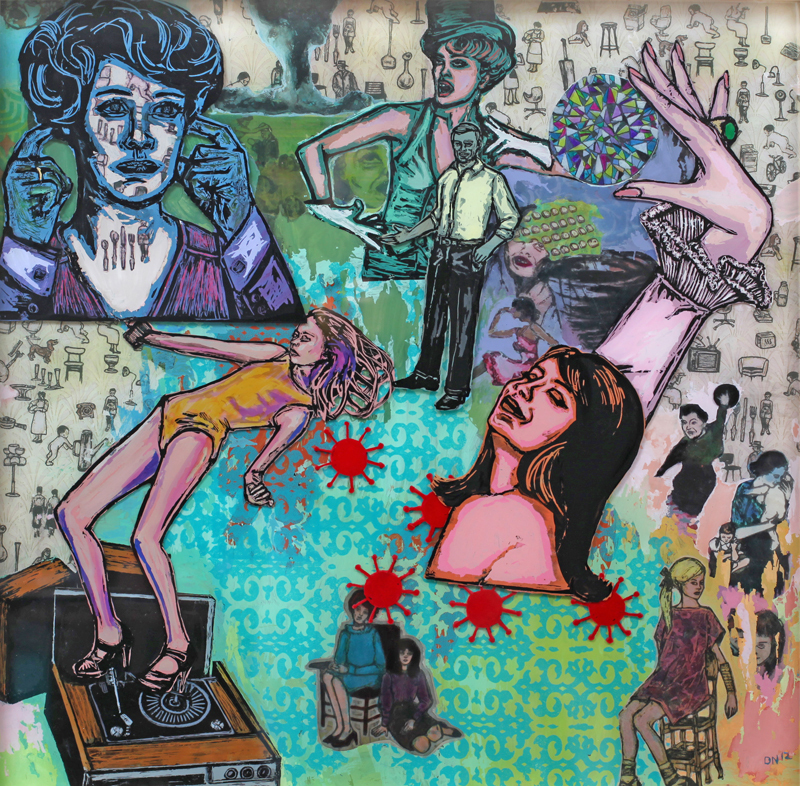 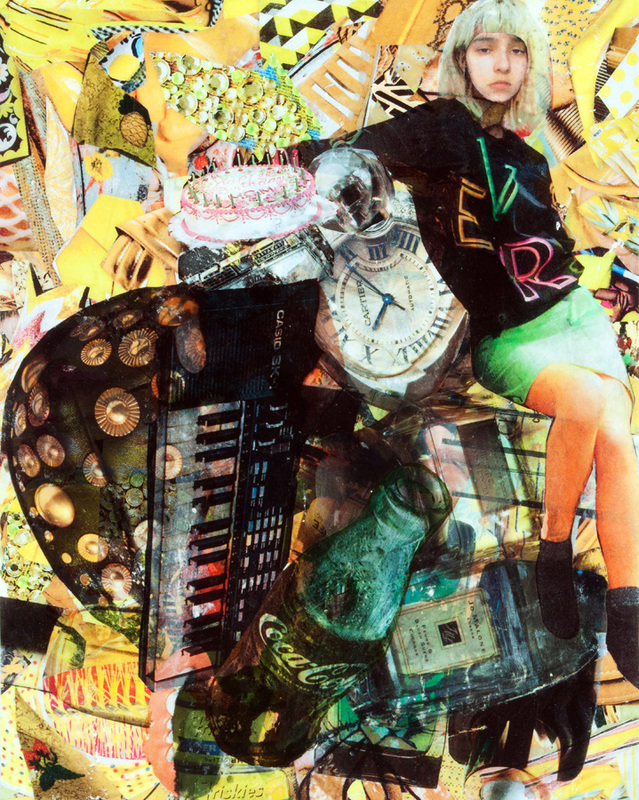 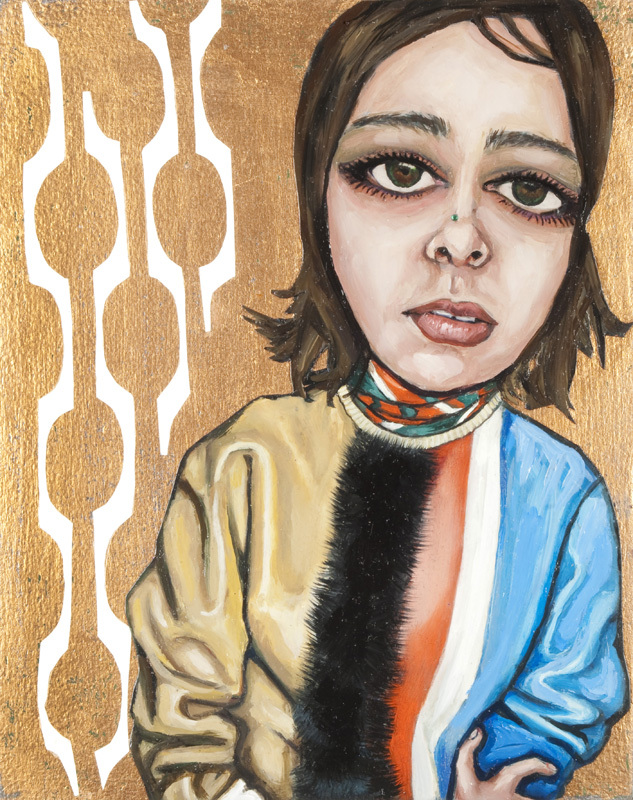 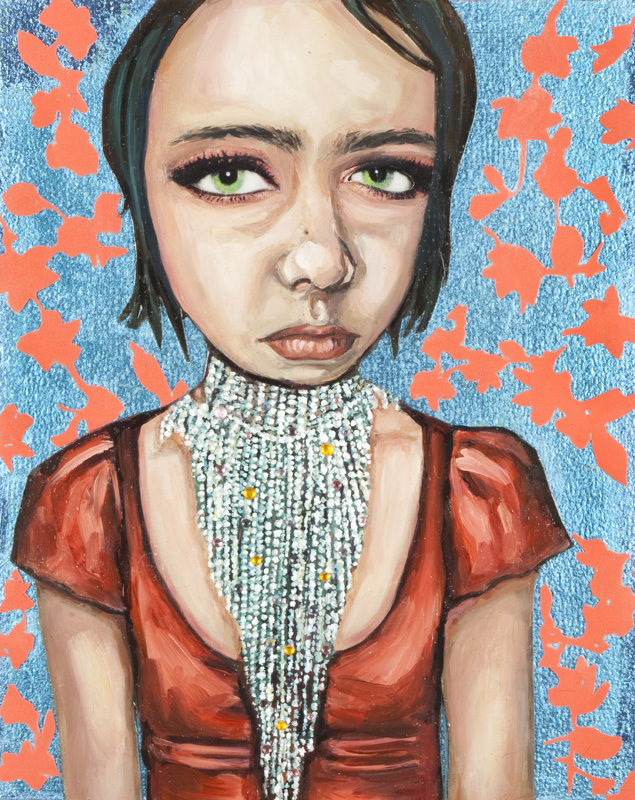 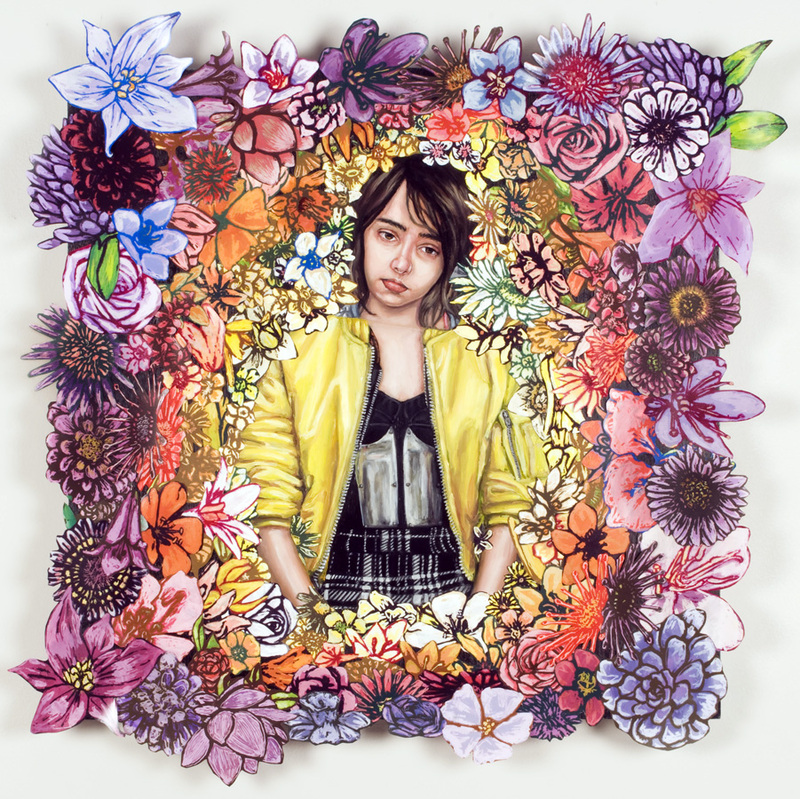 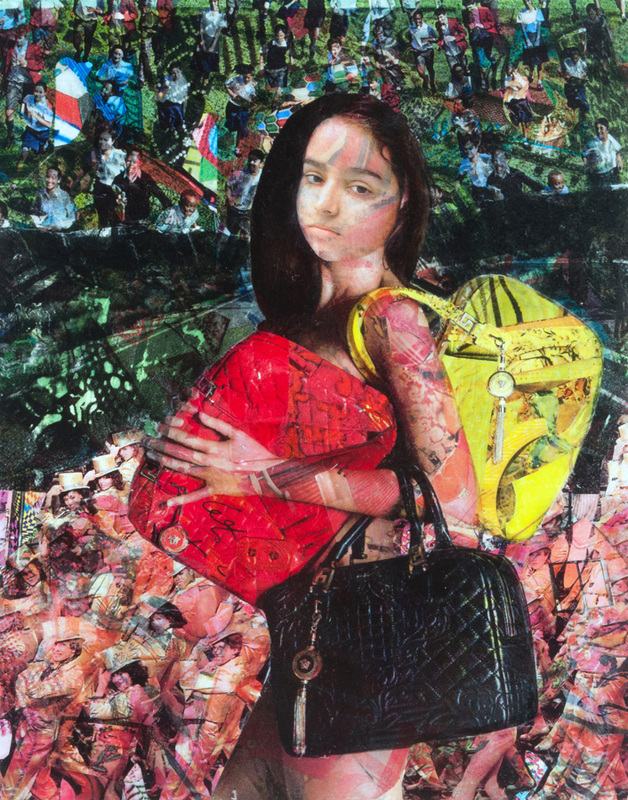 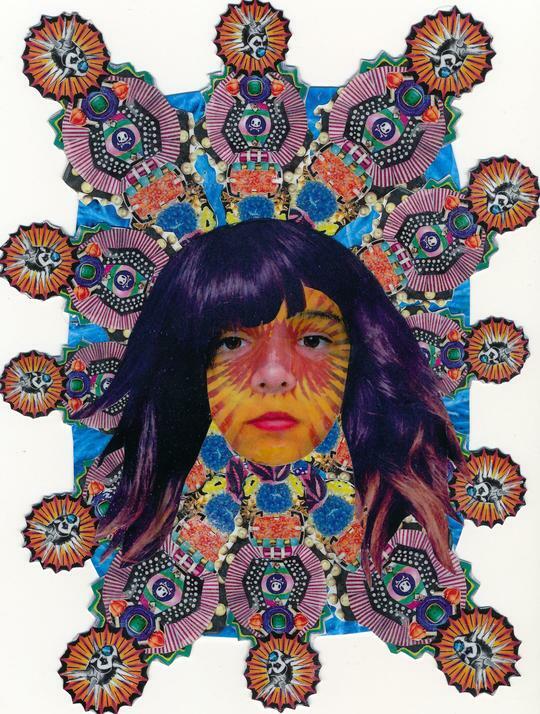 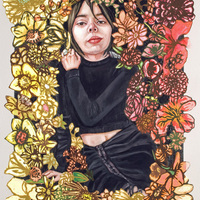 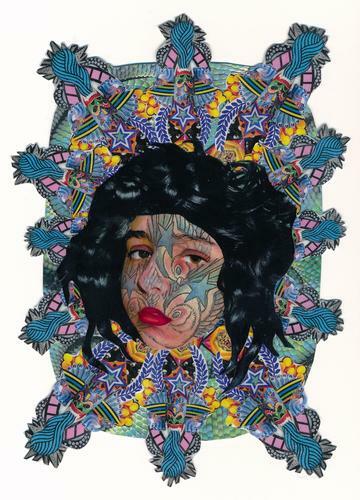 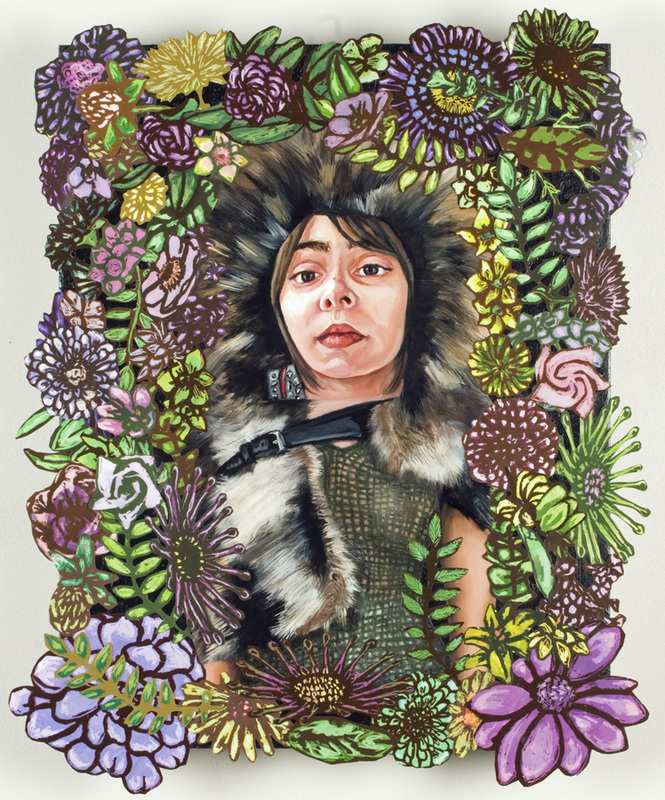 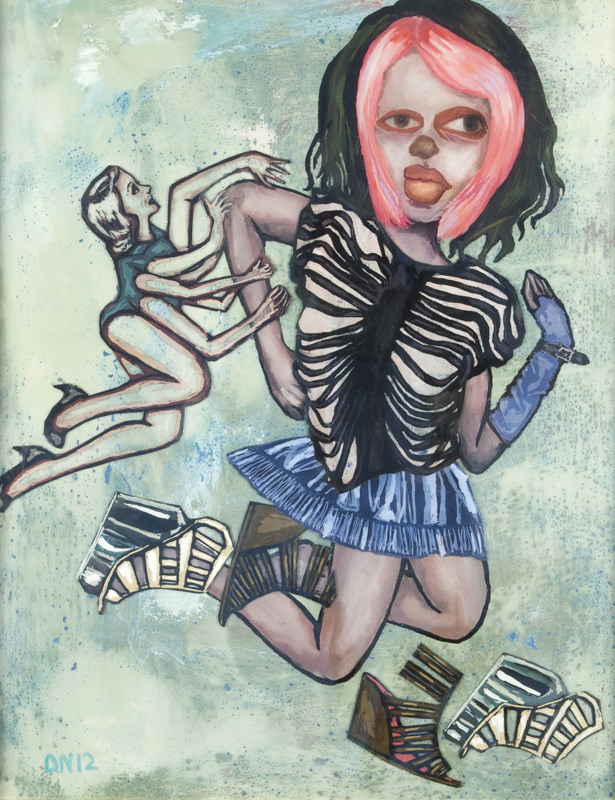 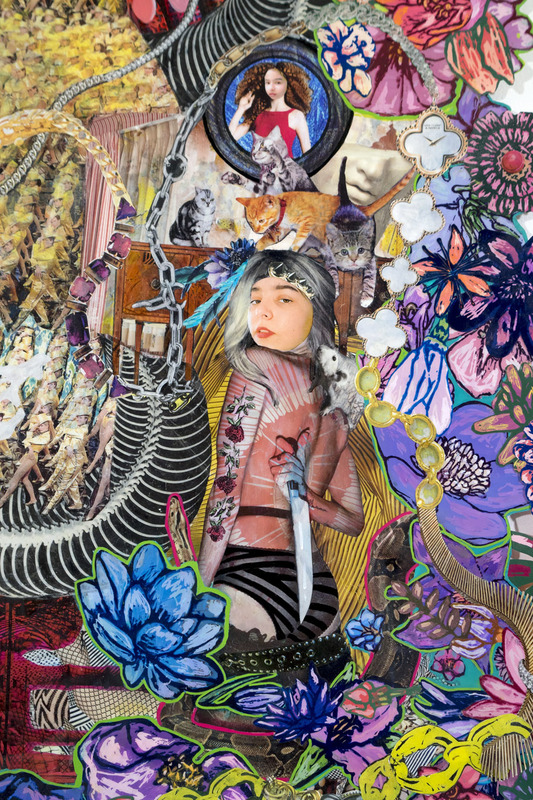 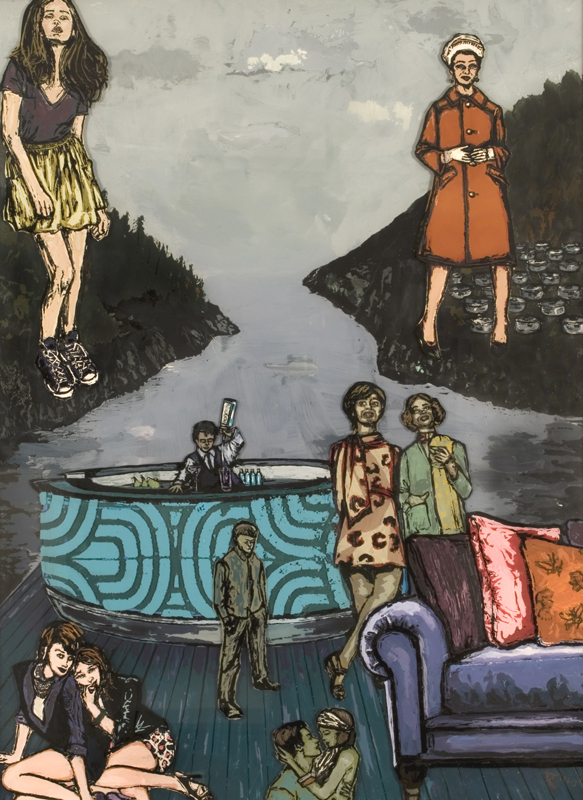 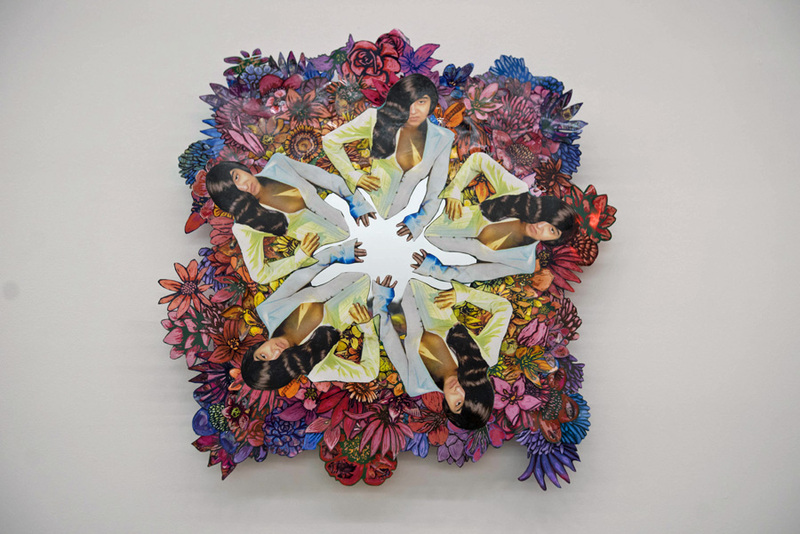 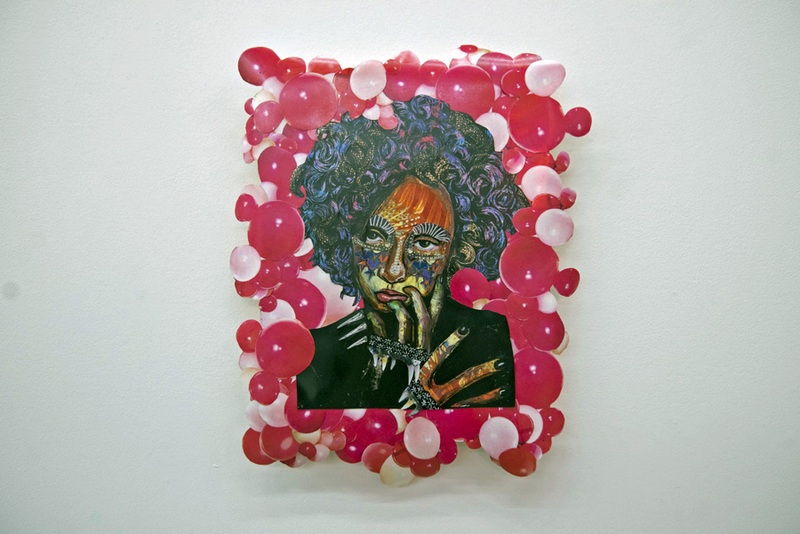 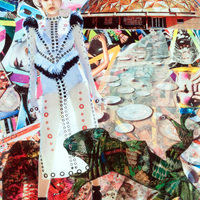 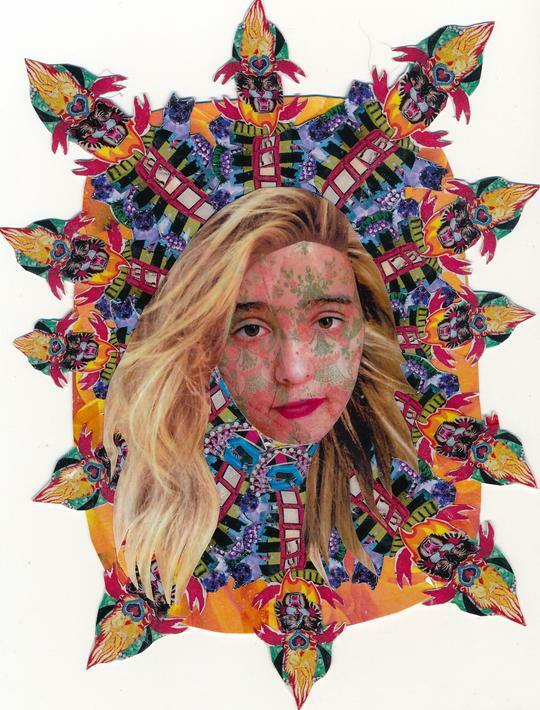 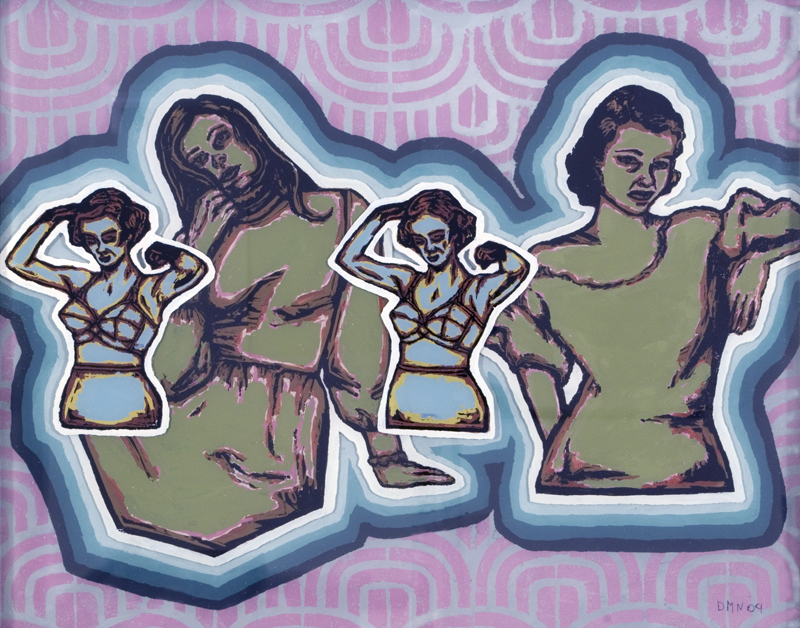 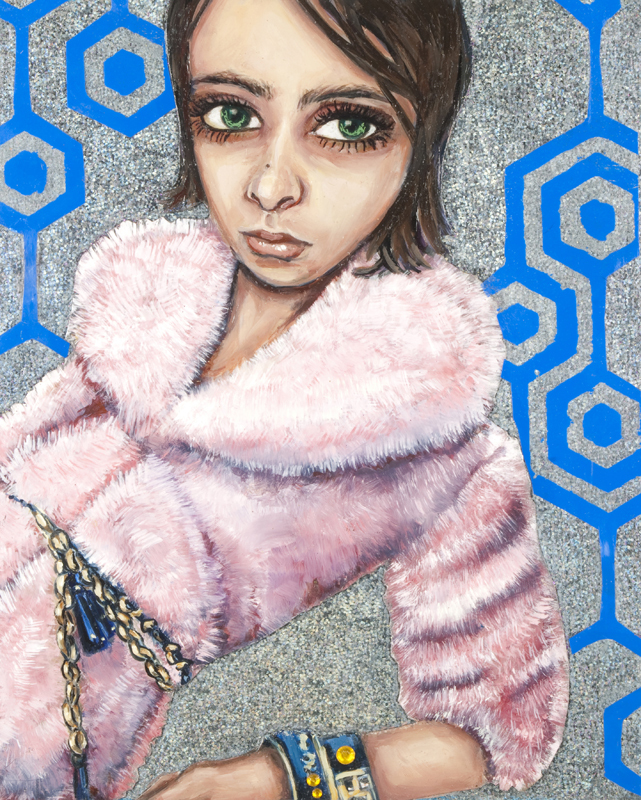 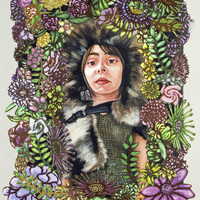 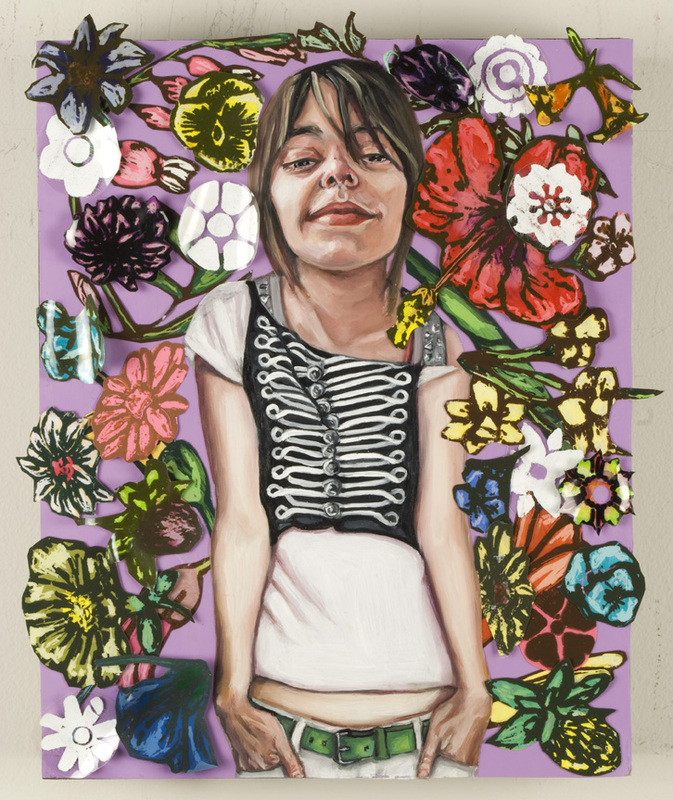 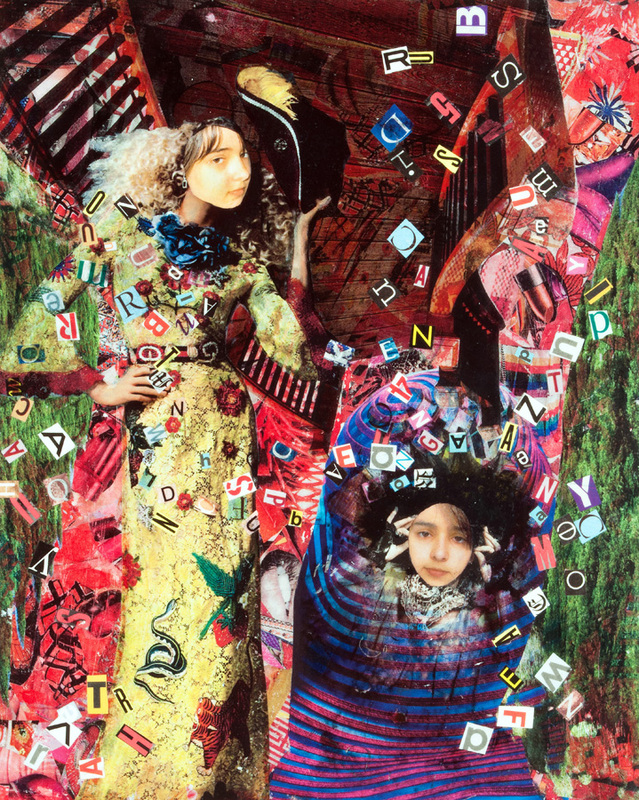 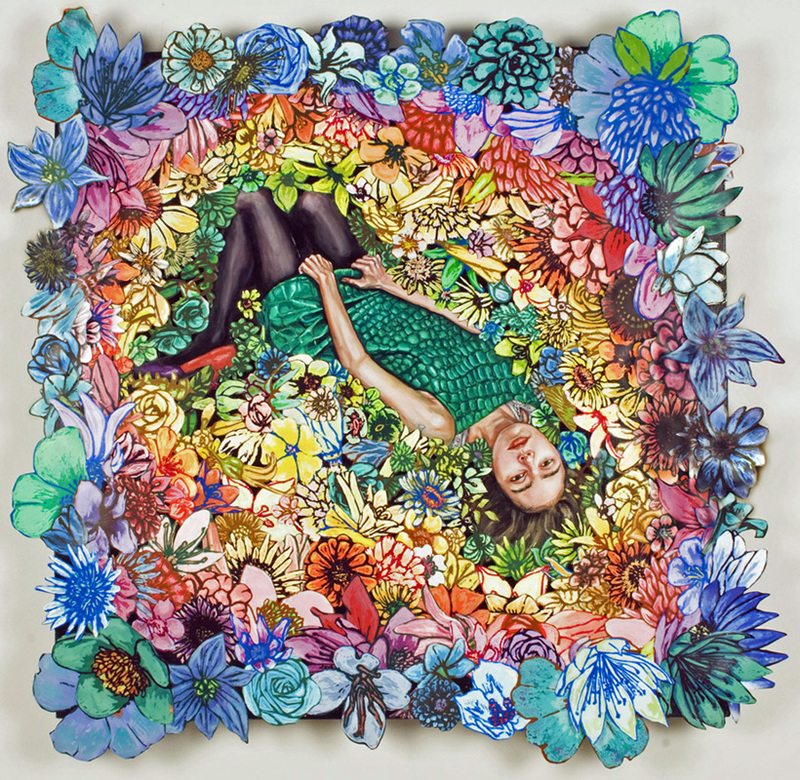 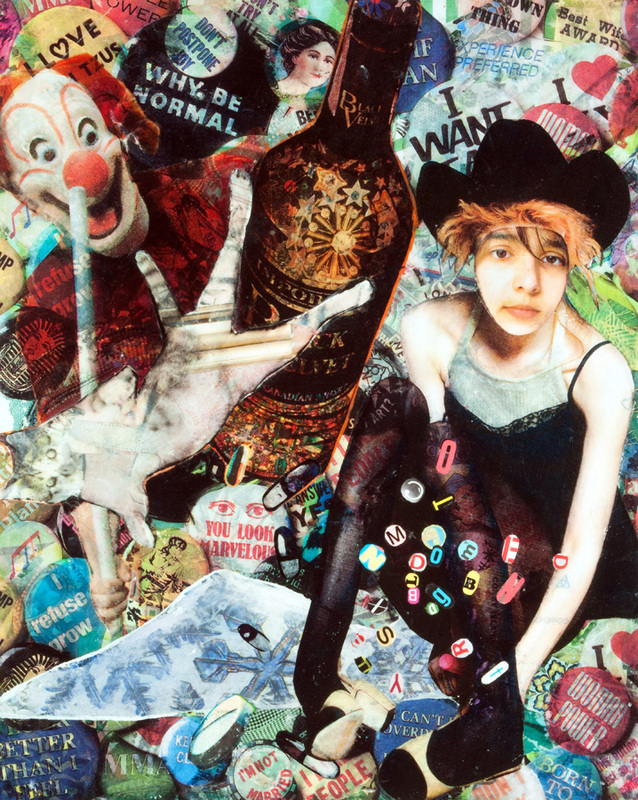 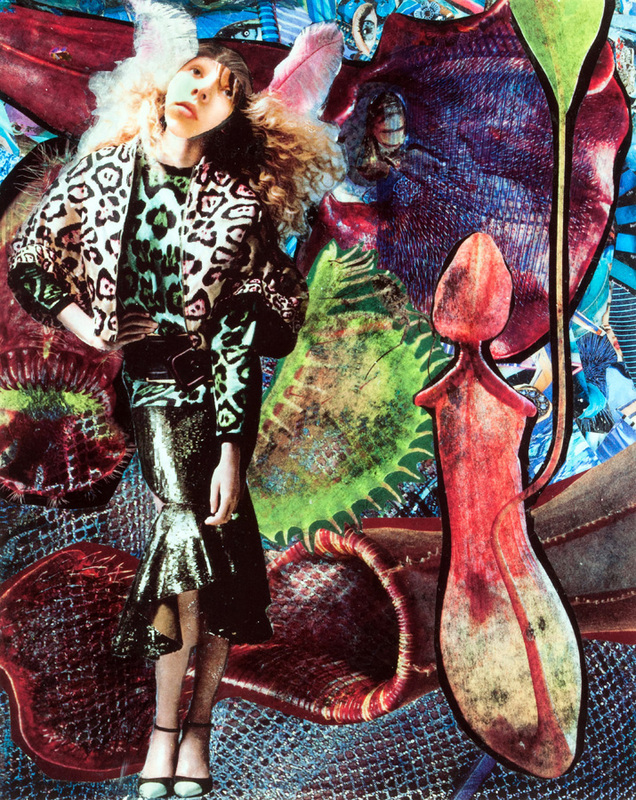 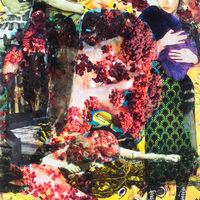 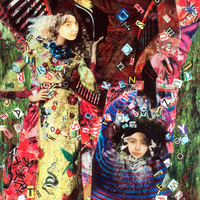 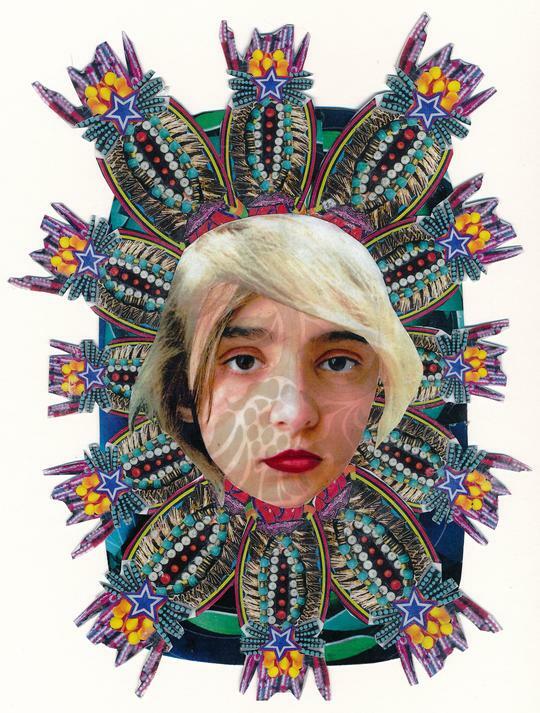 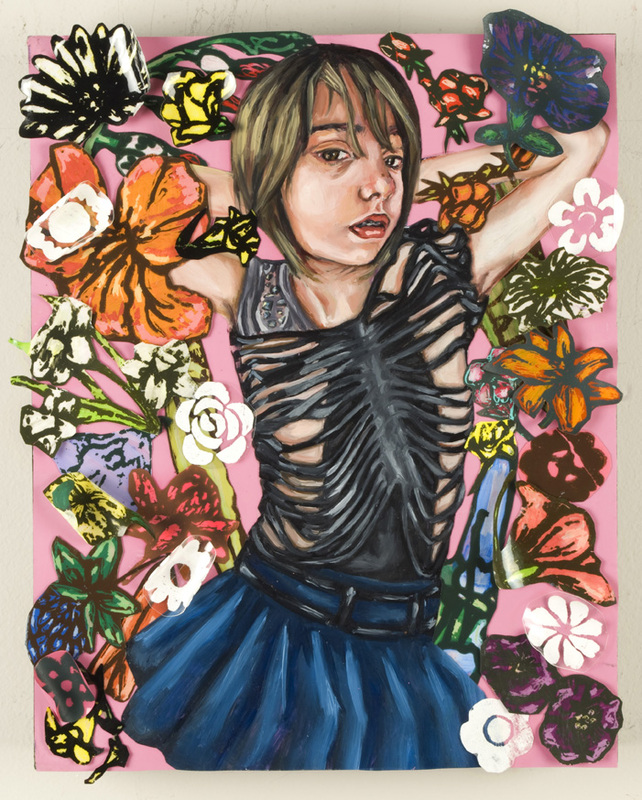 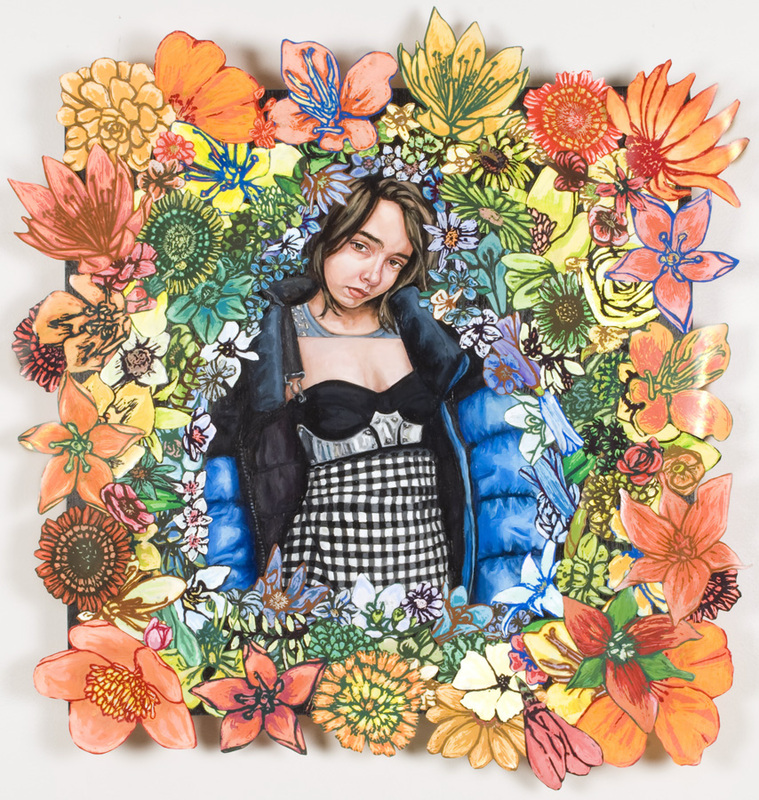 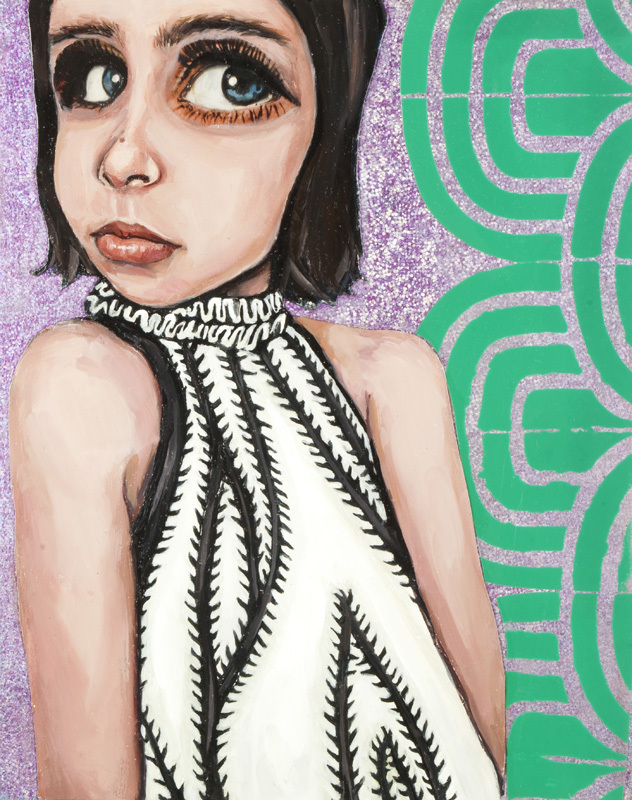 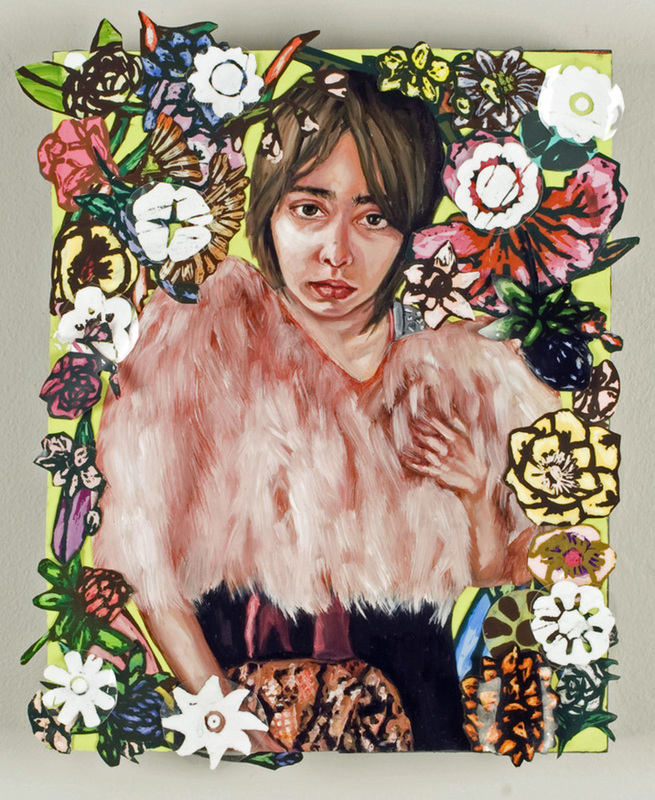 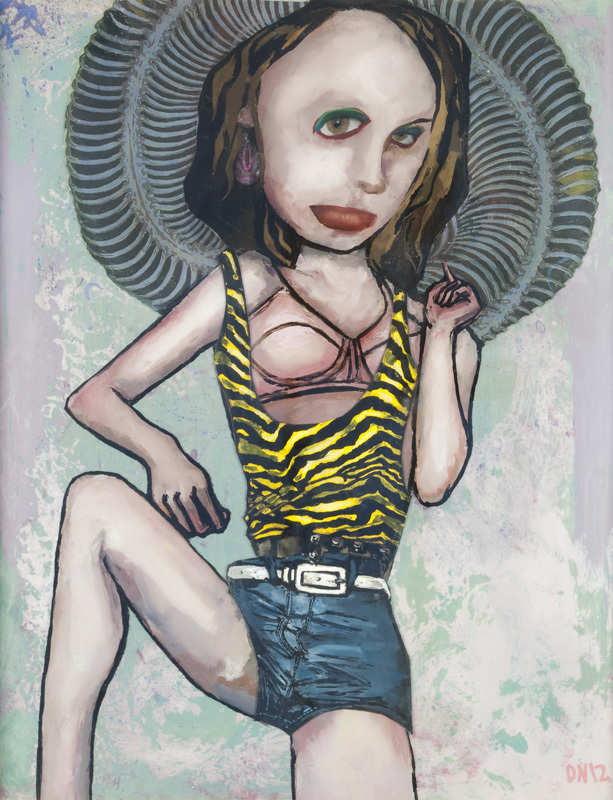 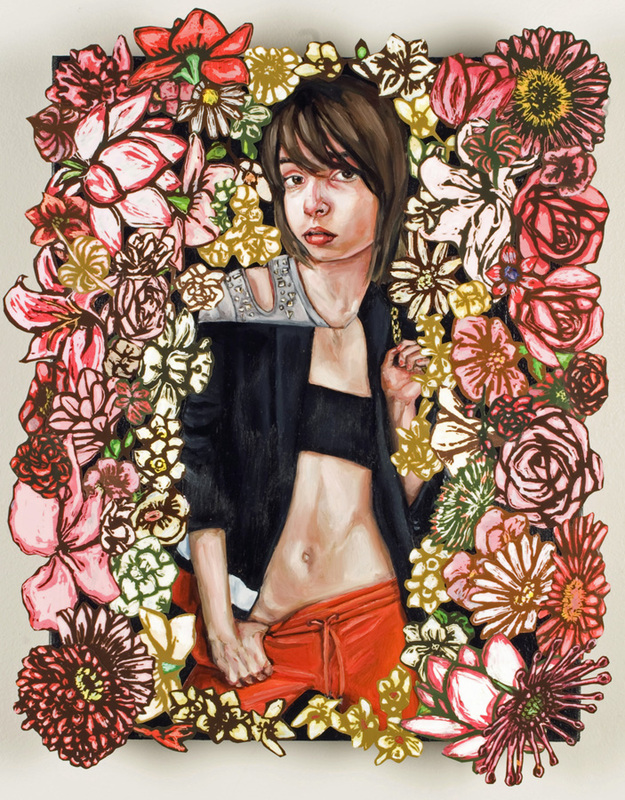 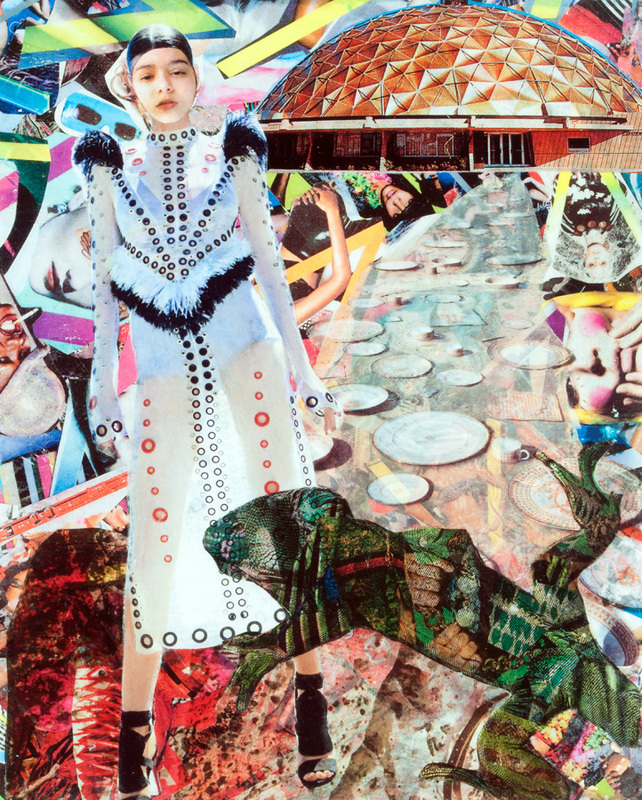 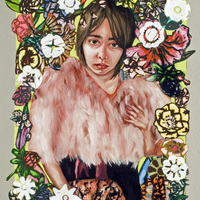 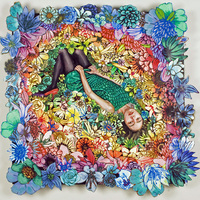 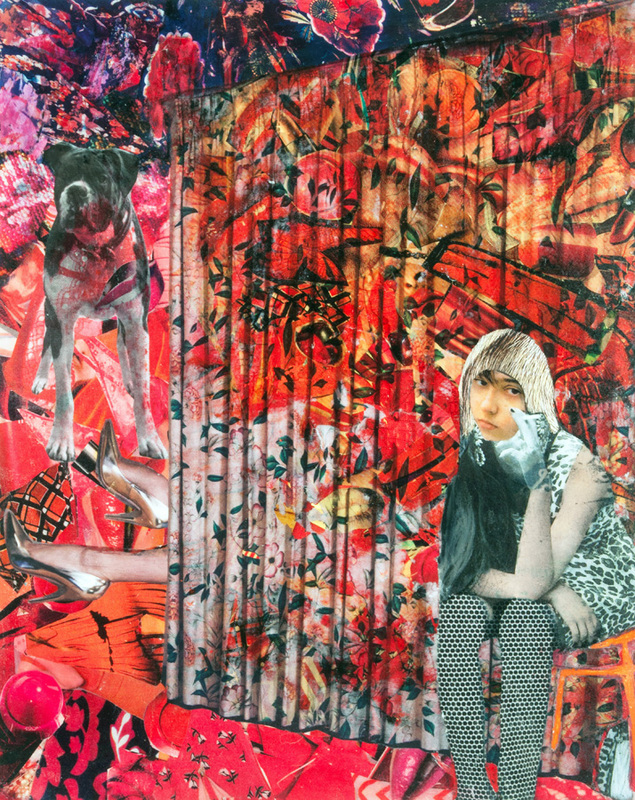 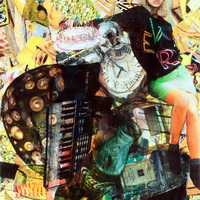 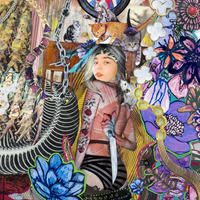 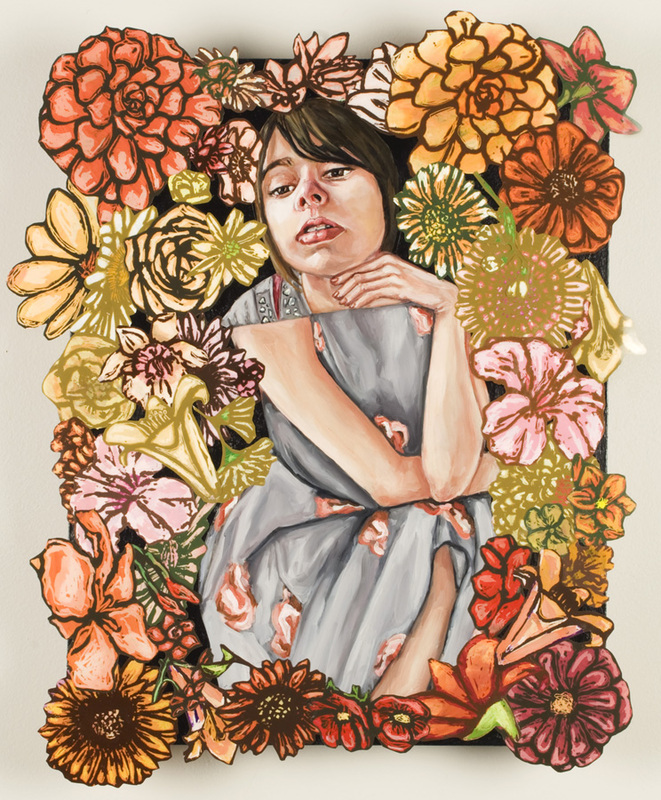 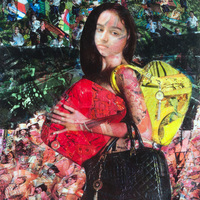 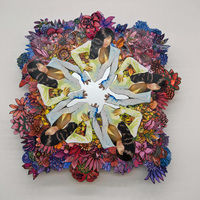 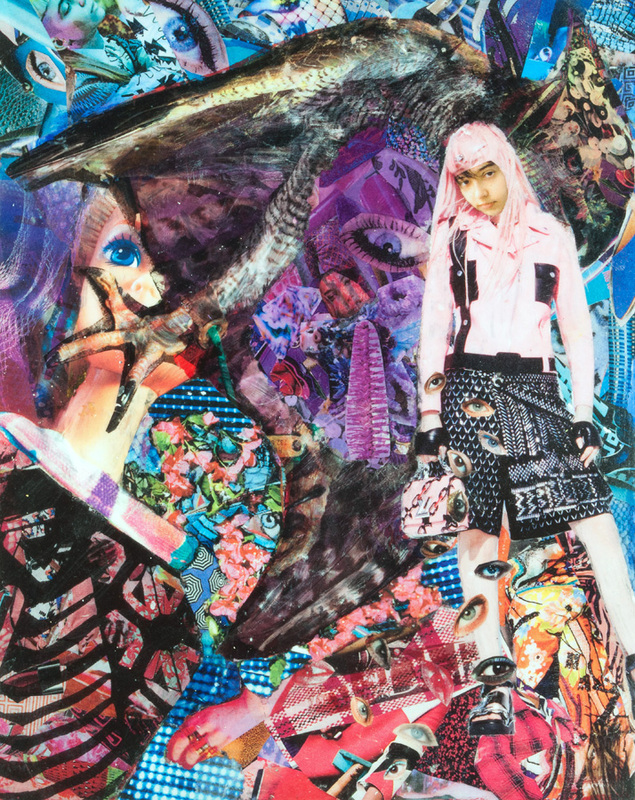 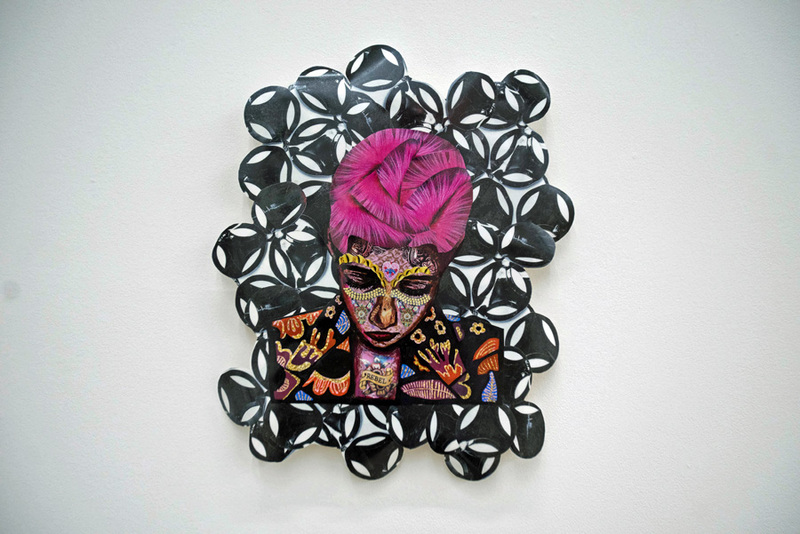 Girl, Constructed, 2013, 32"x32", Ink, acrylic, watercolor ink, screenprint, ink and photo transfer and mylar on two sheets of plexiglass. 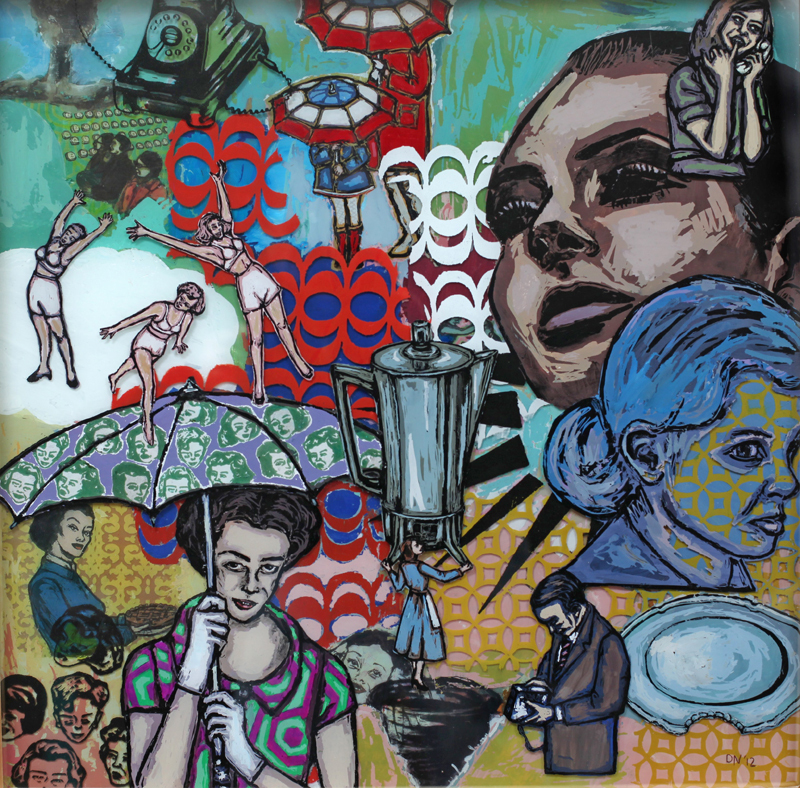 Super Slick, 2013, 24"x24", Ink, acrylic, paint pens, screenprint, ink and photo transfer and mylar on two sheets of plexiglass. 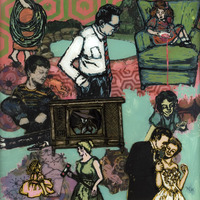 Velveteen 1, 2012, 20"x16", Ink, acrylic, watercolor, watercolor ink, oil, screenprint, ink and photo transfer, and mylar on glass. 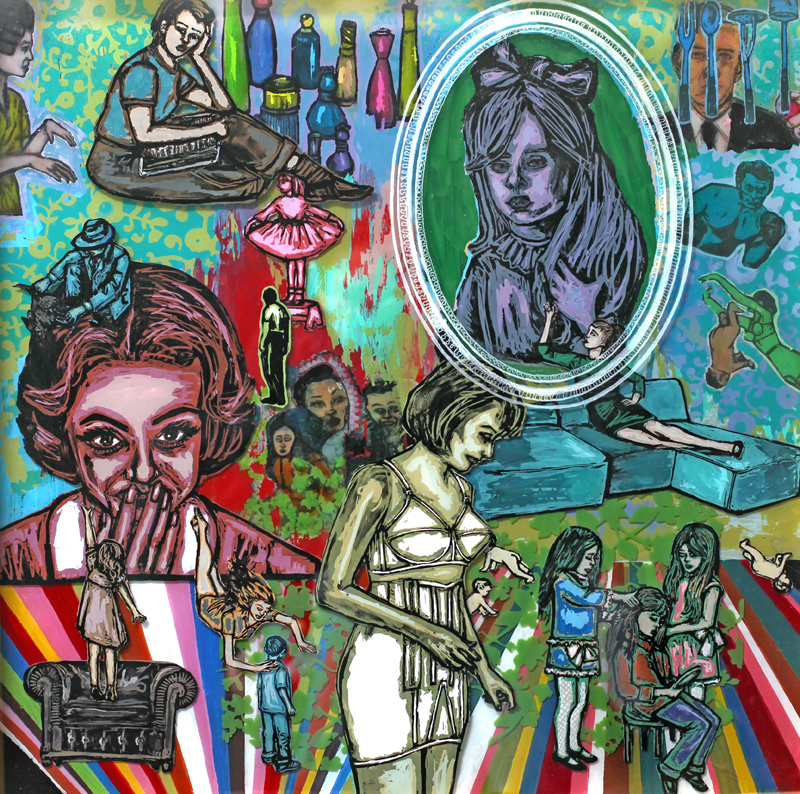 Velveteen 2, 2012, 20"x16", Ink, acrylic, watercolor, watercolor ink, oil, screenprint, ink and photo transfer, and mylar on glass. 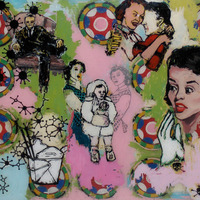 Velveteen 3, 2012, 20"x16", Ink, acrylic, watercolor, watercolor ink, oil, screenprint, ink and photo transfer and mylar on glass. 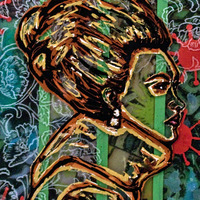 Velveteen 4, 2012, 20"x16", Ink, acrylic, watercolor, watercolor ink, oil, screenprint, ink and photo transfer and mylar on glass. 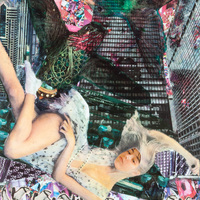 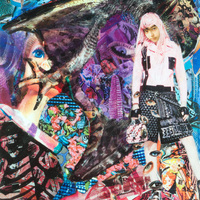 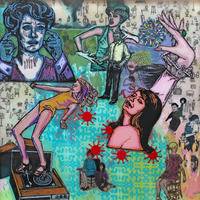 Violent Femme 1, 2012, 16"x12", Ink, acrylic, oil, watercolor, watercolor ink, photo transfer and dura-lar on glass. 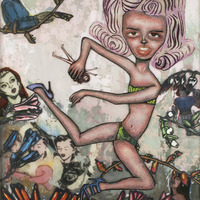 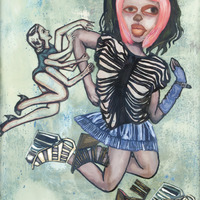 Violent Femme 2, 2012, 16"x12", Ink, acrylic, oil, watercolor, watercolor ink, photo transfer and dura-lar on glass. 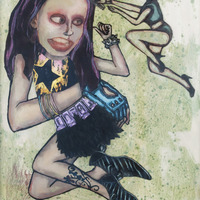 Violent Femme 3, 2012, 16"x12", Ink, acrylic, oil, watercolor, watercolor ink, photo transfer and dura-lar on glass. 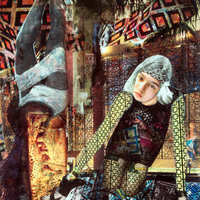 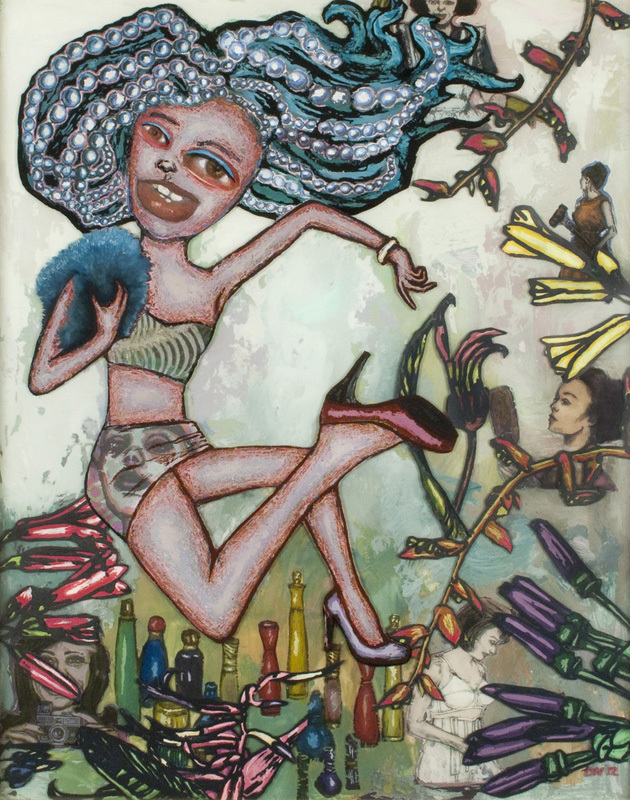 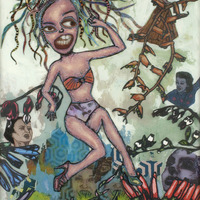 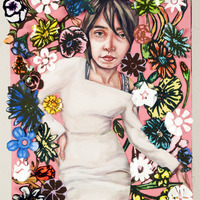 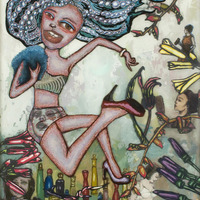 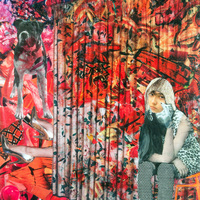 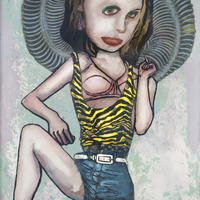 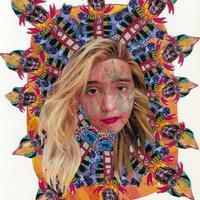 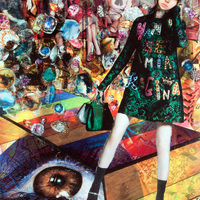 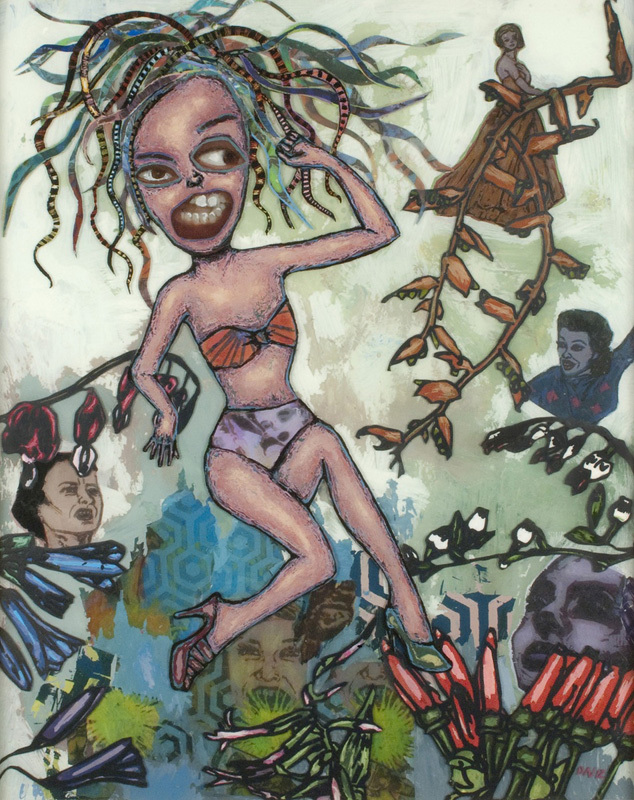 Violent Femme 4, 2012, 16"x12", Ink, acrylic, oil, watercolor, watercolor ink, photo transfer and dura-lar on glass. 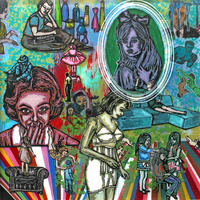 A Good Imitation, 2012, 22"x22", Ink, acrylic, screenprint, ink transfer, sharpie and paint pens on three panes of glass. 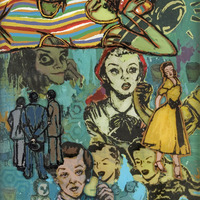 Bad Behavior, 2012, 22"x22", Ink, acrylic, screenprint, ink transfer, sharpie and paint pens on three panes of glass. 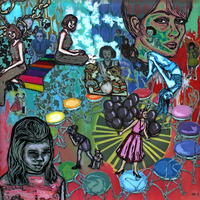 Musical Chairs, 2012, 22"x22", Ink, acrylic, screenprint, ink transfer, sharpie and paint pens on three panes of glass. 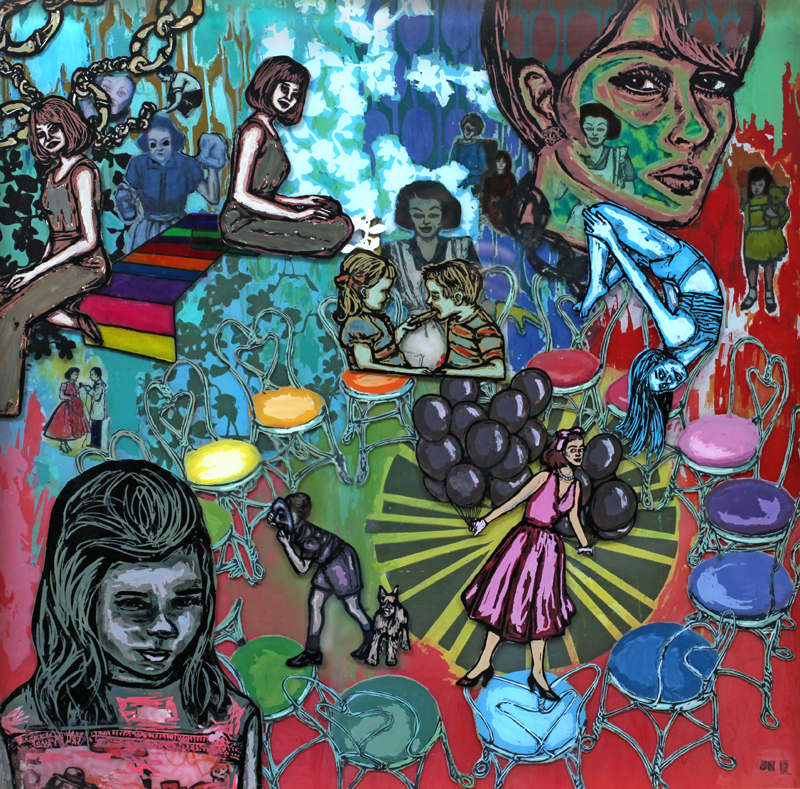 It Wouldn't Kill You, 2012, 22"x22", Ink, acrylic, screenprint, ink transfer, sharpie and paint pens on three panes of glass. 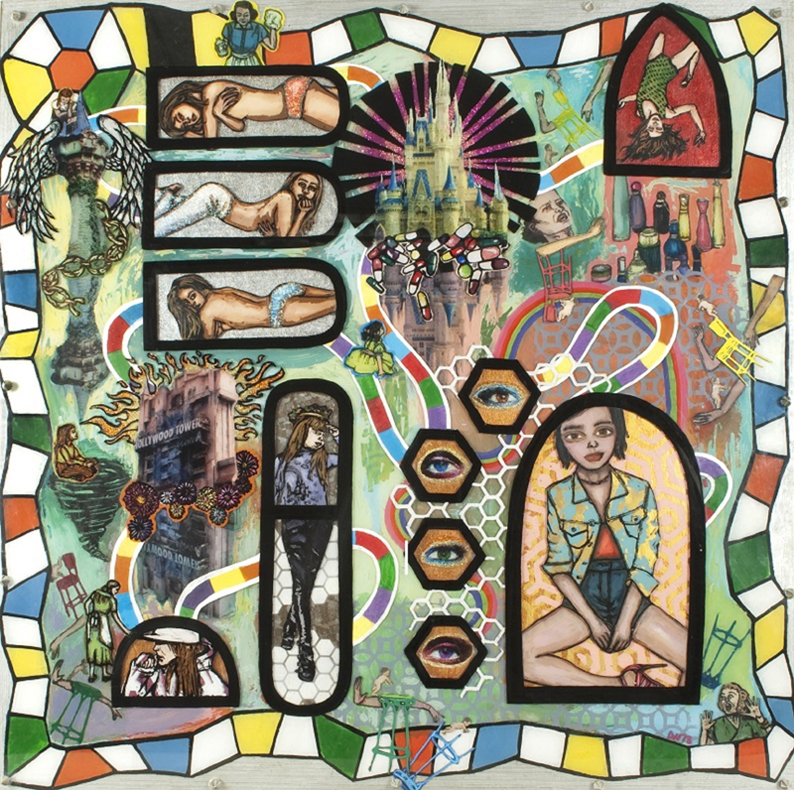 Goes Without Saying, 2012, 22"x22", Ink, acrylic, screenprint, ink transfer, sharpie and paint pens on three panes of glass. 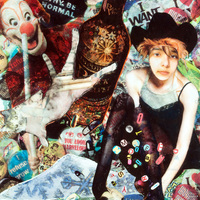 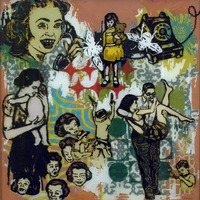 Cry Baby, 2012, 22"x22", Ink, acrylic, screenprint, ink transfer, sharpie and paint pens on three panes of glass. 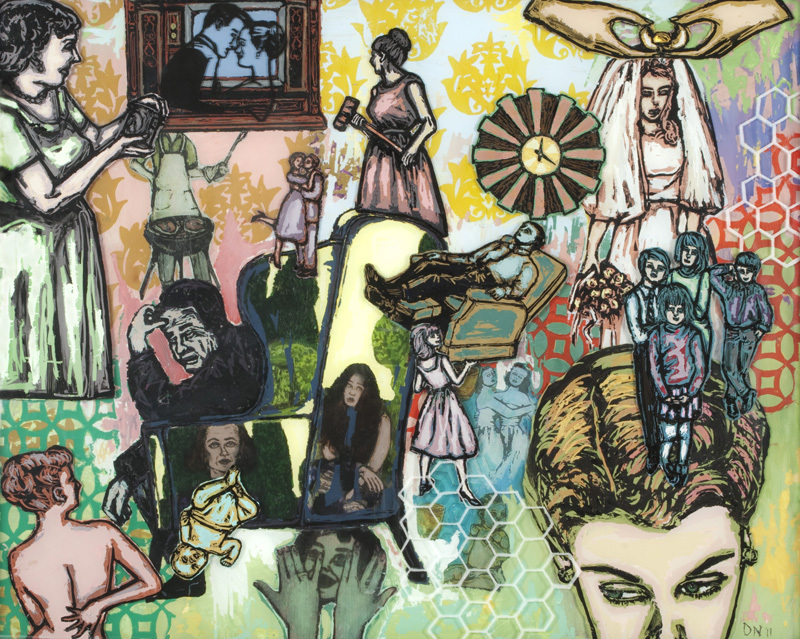 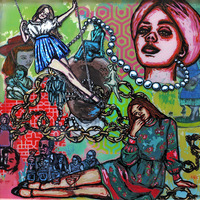 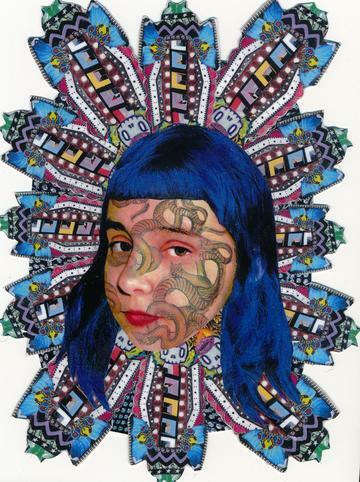 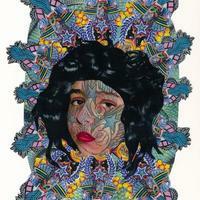 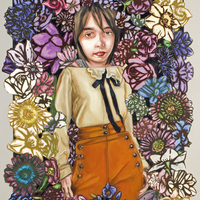 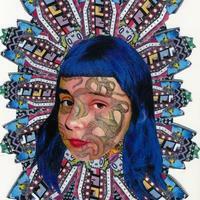 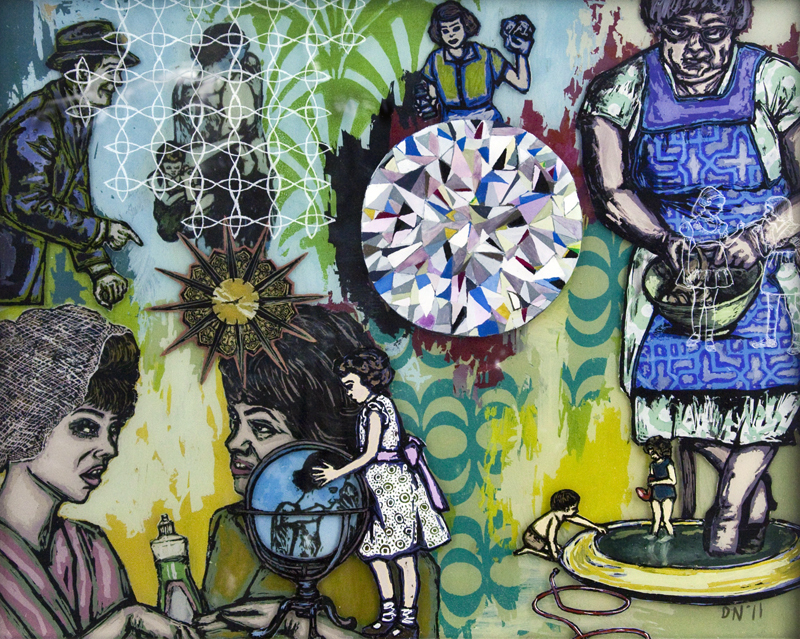 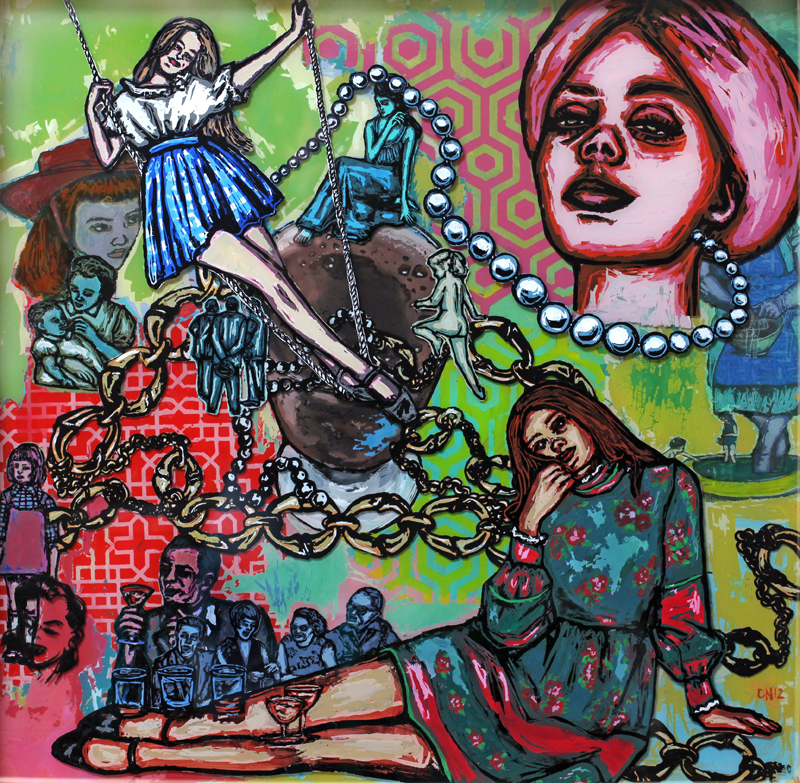 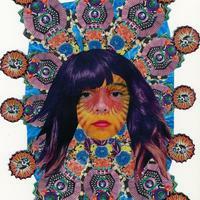 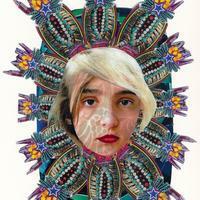 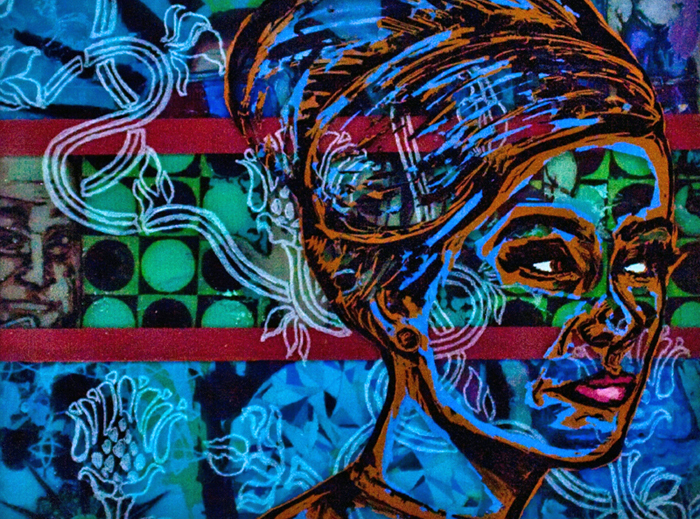 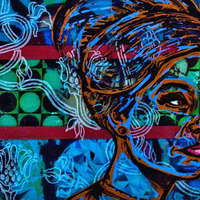 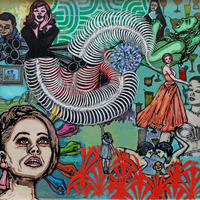 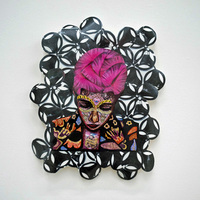 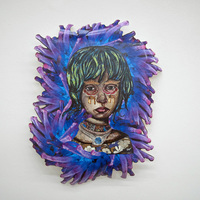 Girl/Power, 2012, 22"x22", Ink, acrylic, screenprint, ink transfer, sharpie and paint pens on three panes of glass. 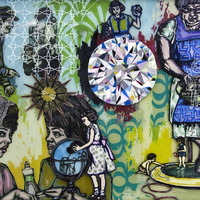 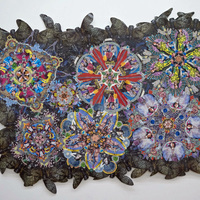 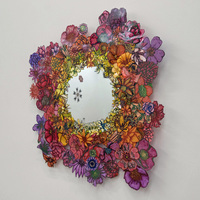 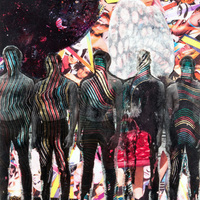 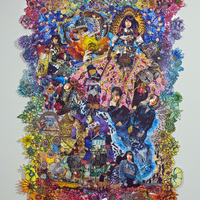 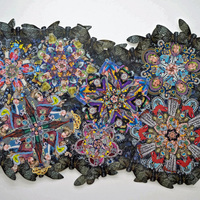 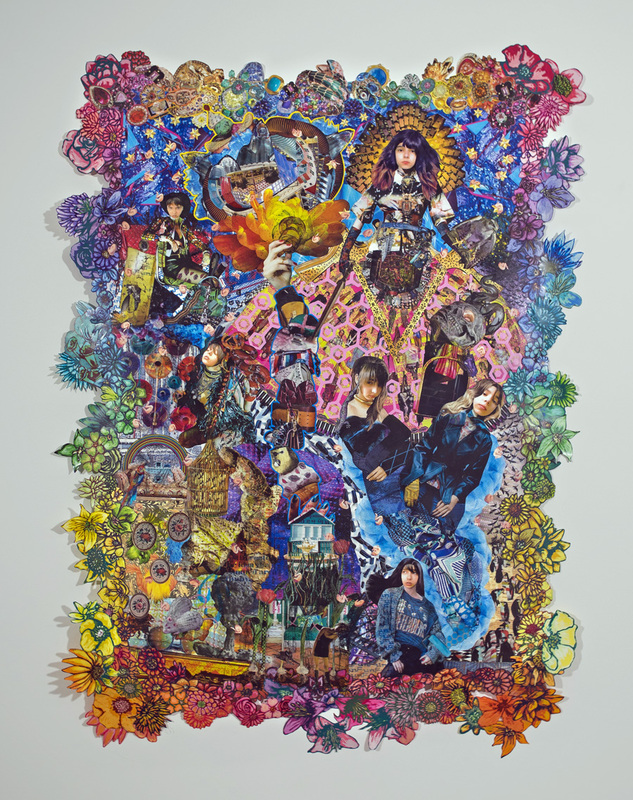 They Did 1, 2012, 16"x20", Ink, acrylic, screenprint, ink transfer and glass etching on three panes of glass. 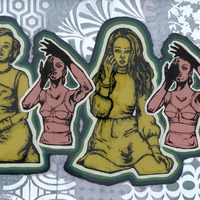 Devotion, 2011, 16"x20", Ink, acrylic, screenprint, ink transfer and glass etching on three panes of glass. 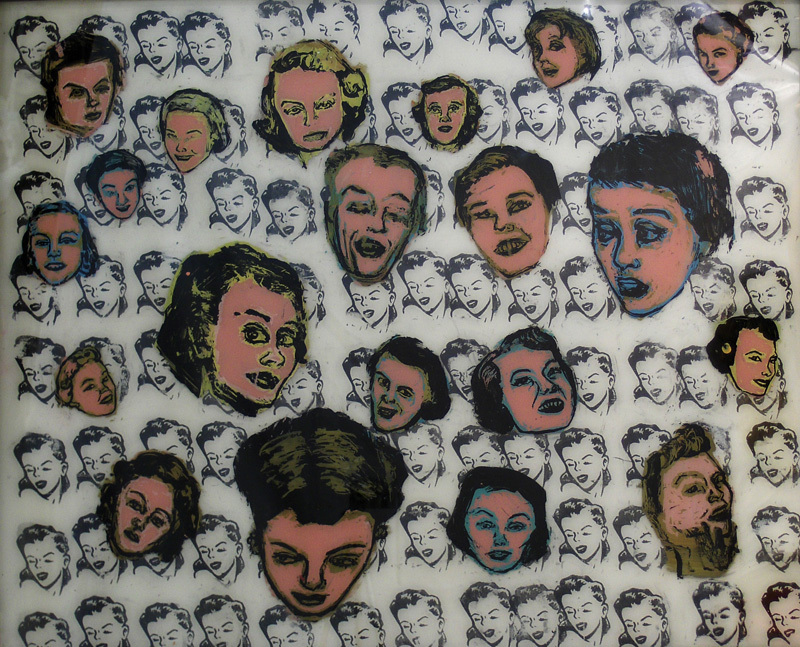 They Did 2, 2012, 16"x20", Ink, acrylic, screenprint, ink transfer and glass etching on three panes of glass. 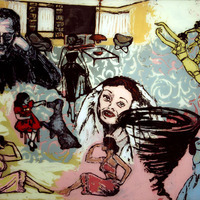 In The Moment, 2011, 16"x20", Ink, acrylic, screenprint, ink transfer and glass etching on three panes of glass. 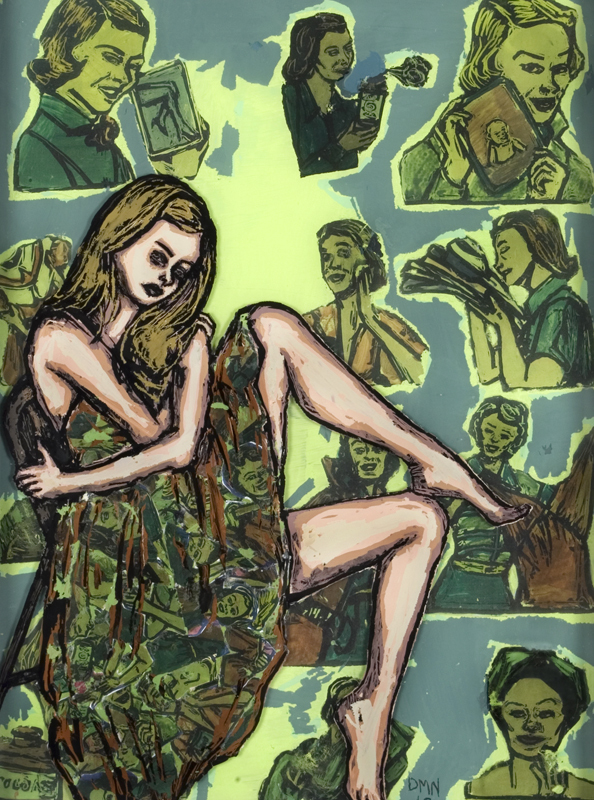 Look At Me, 2011, 16"x20", Ink, acrylic, screenprint, ink transfer and glass etching on three panes of glass. 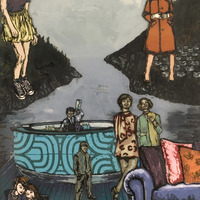 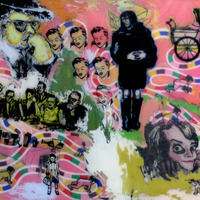 Going Places, 2011, 16"x20", Ink, acrylic, screenprint, ink transfer and glass etching on three panes of glass. 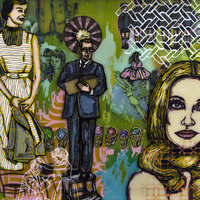 Spare Parts, 2011, 20"x16", Ink, acrylic, screenprint and ink transfer on three panes of glass. 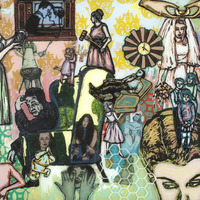 The Shift, 2011, 20"x16", Ink, acrylic, screenprint, and ink transfer on three panes of glass. 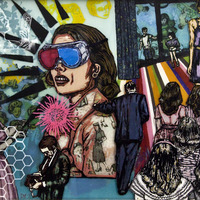 Inside Out 1, 2011, 10"x8", Ink, acrylic, screenprint, ink transfer and glass etching on three panes of glass. 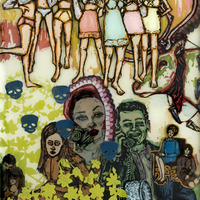 Inside Out 2, 2011, 8"x10", Ink, acrylic, screenprint, ink transfer, and glass etching on three panes of glass. 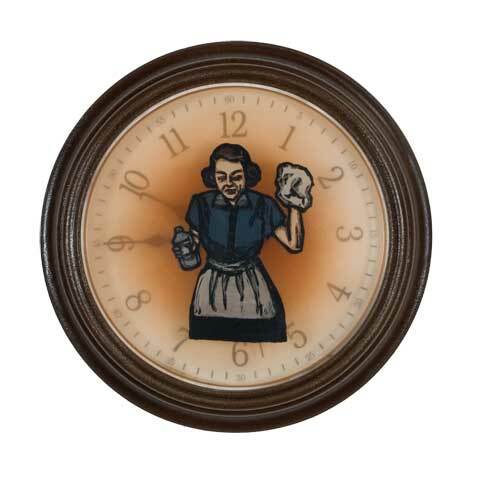 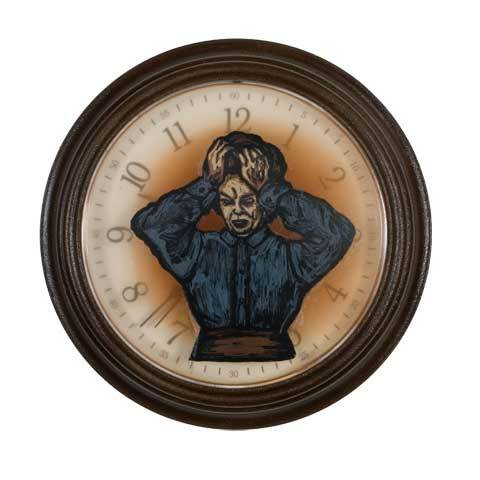 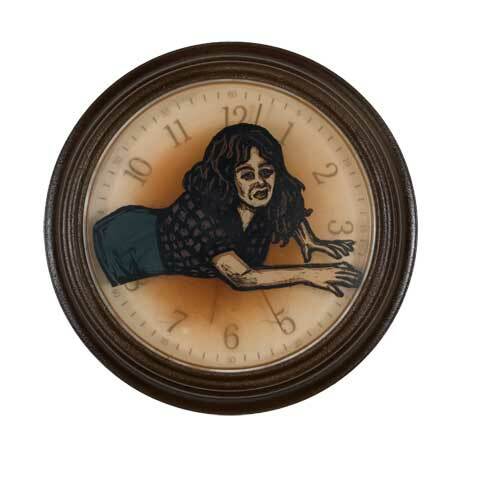 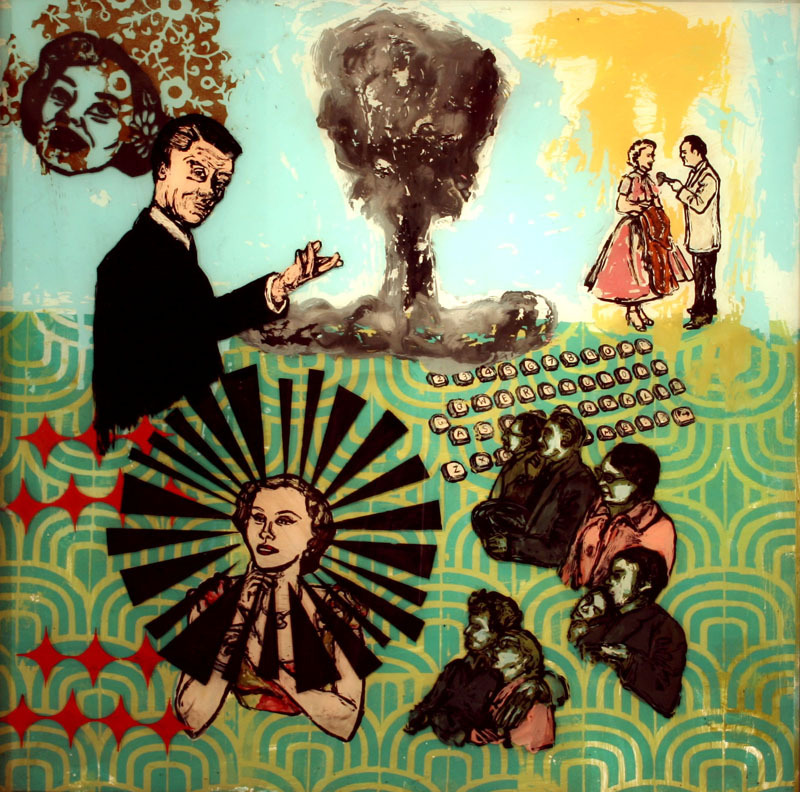 Time Bomb, 2010, 14"x11", Ink, acrylic, screenprint and ink transfer on three panes of glass. 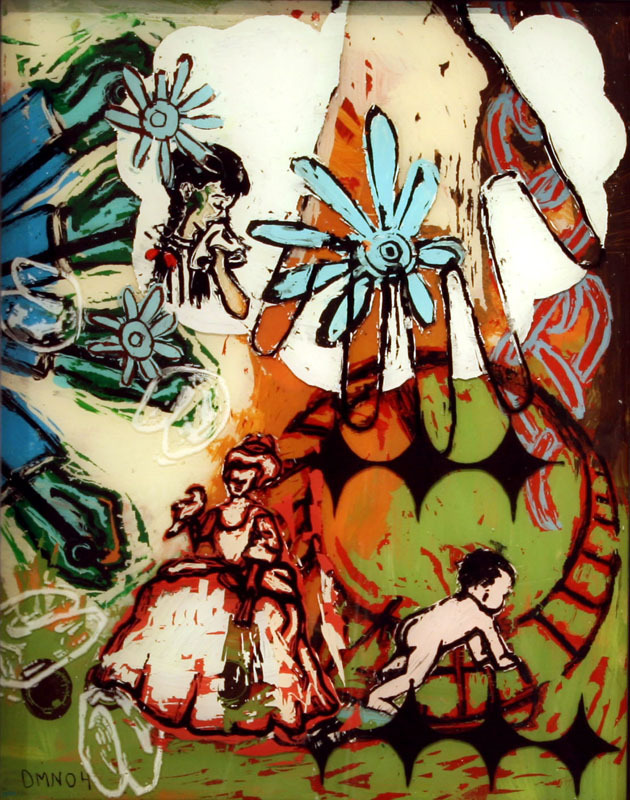 Kitten and Cat, 2010, 14"x11", Ink, acrylic, screenprint and ink transfer on three panes of glass. 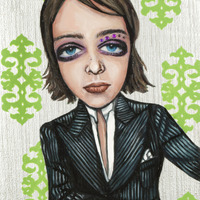 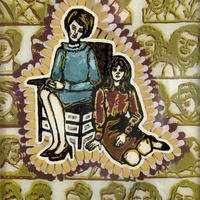 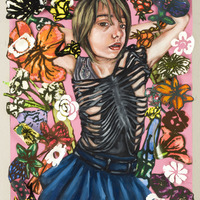 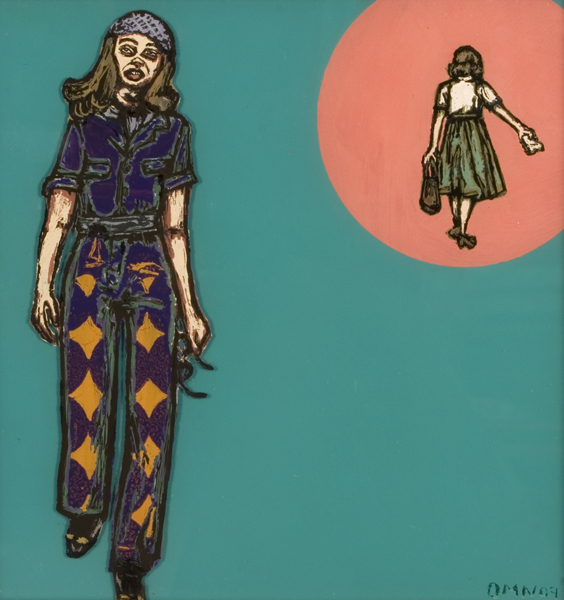 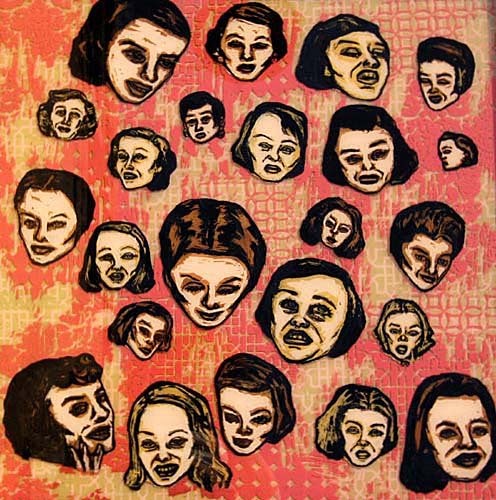 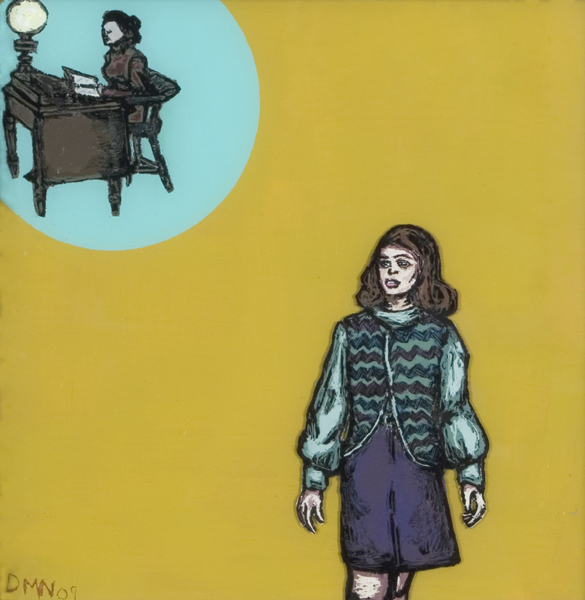 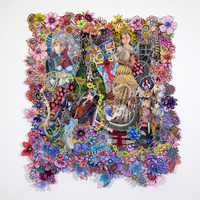 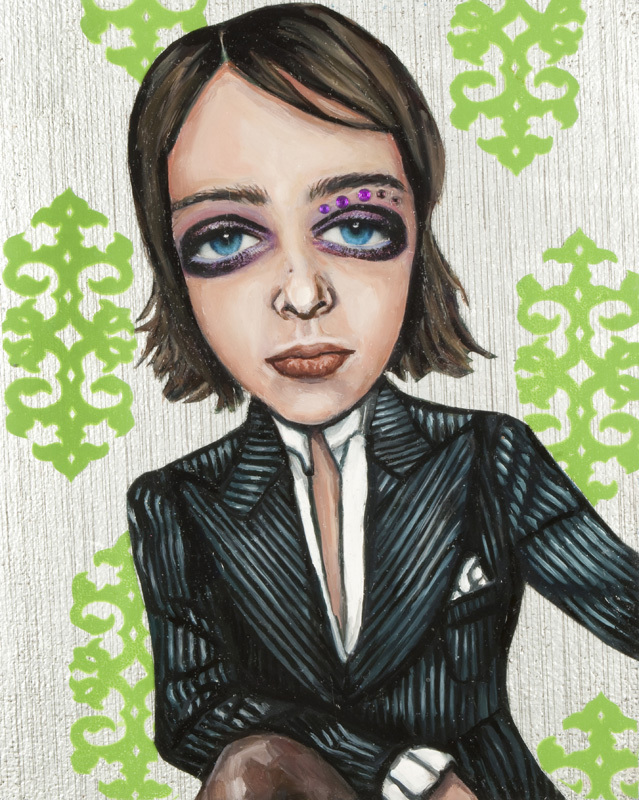 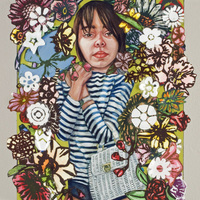 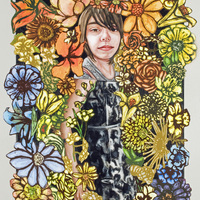 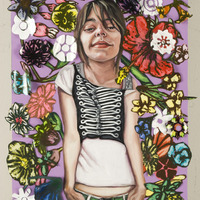 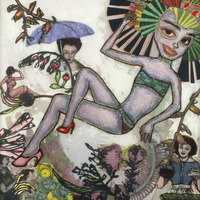 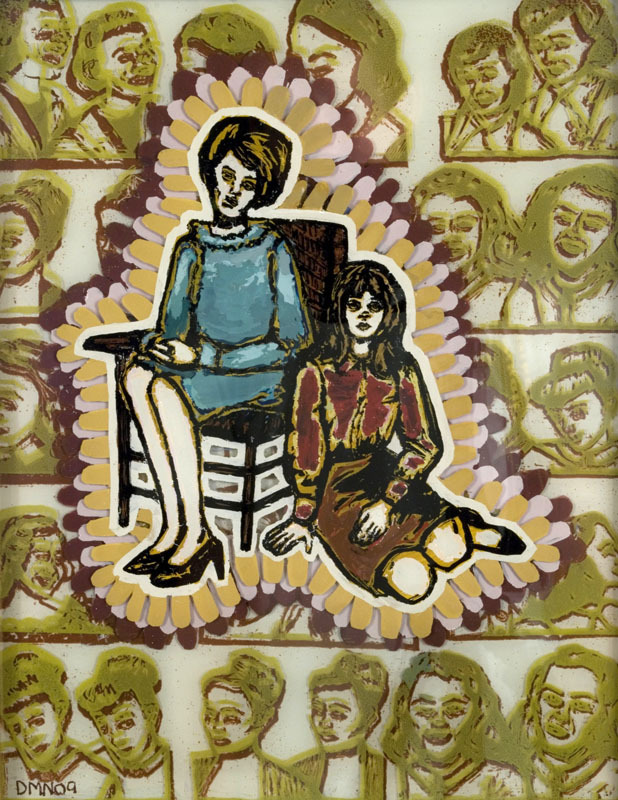 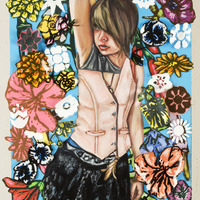 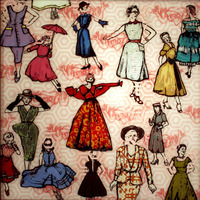 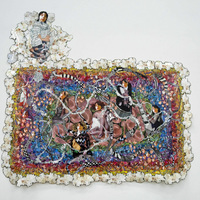 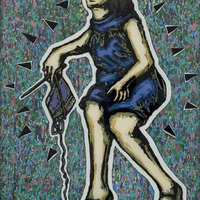 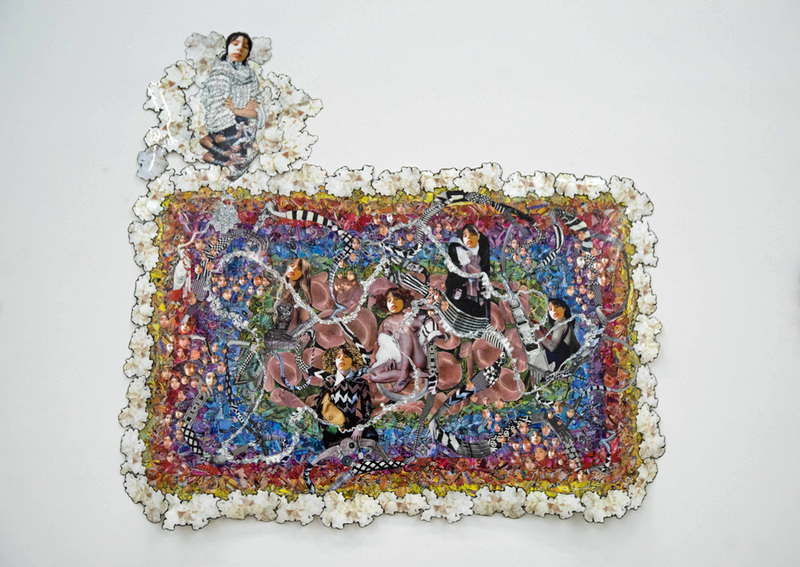 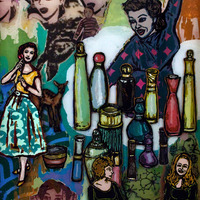 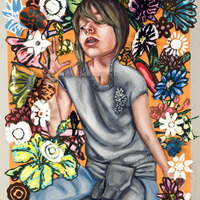 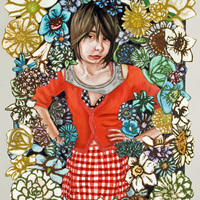 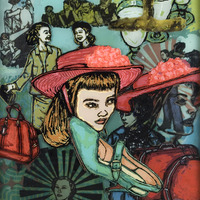 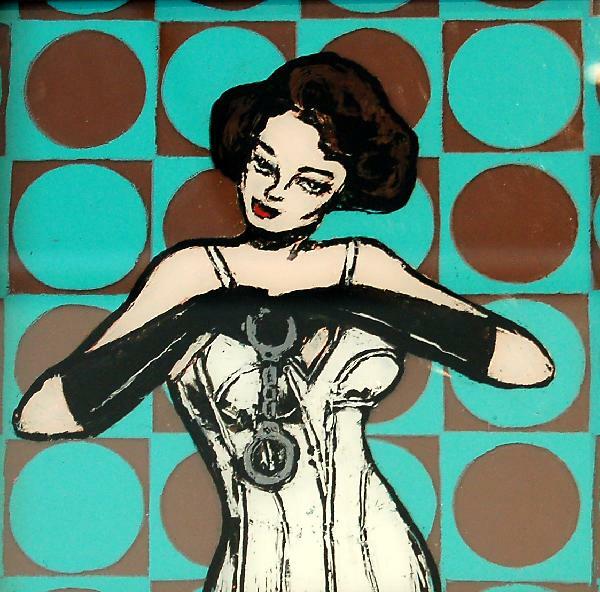 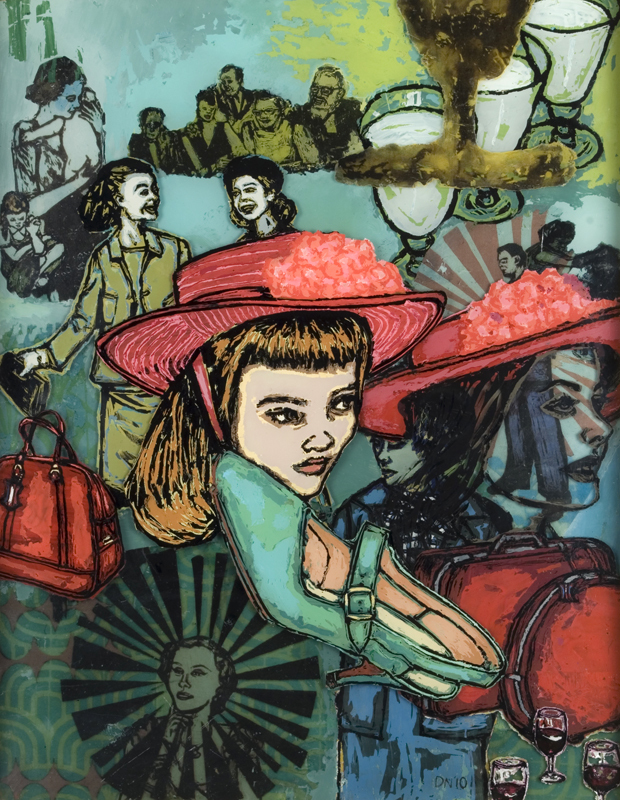 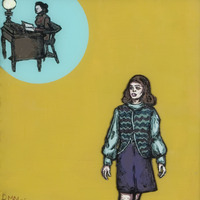 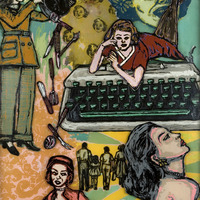 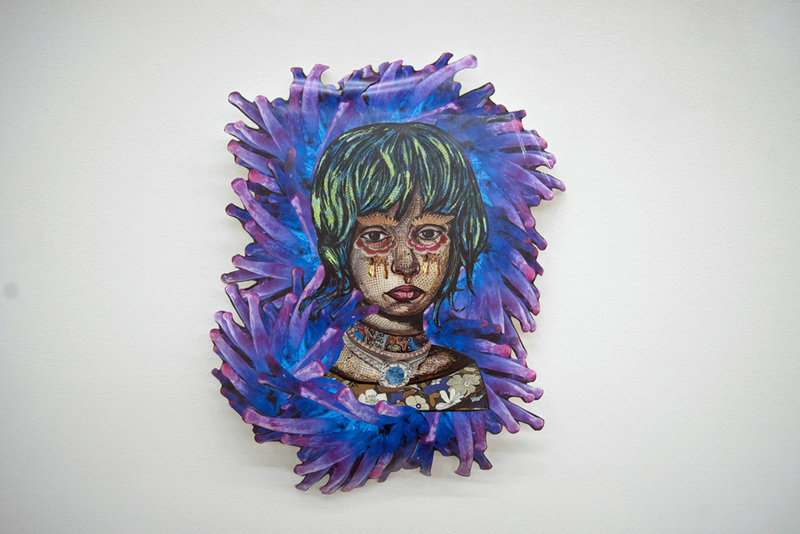 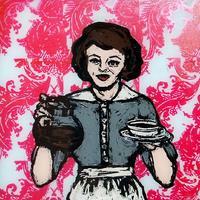 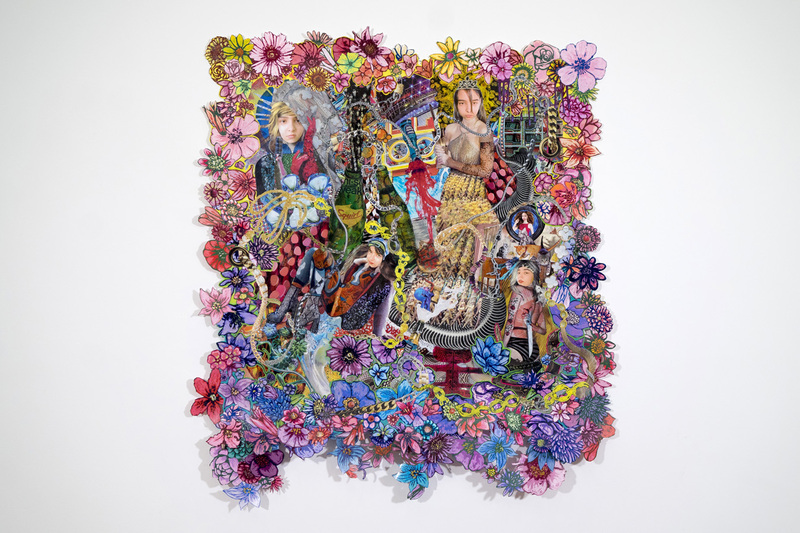 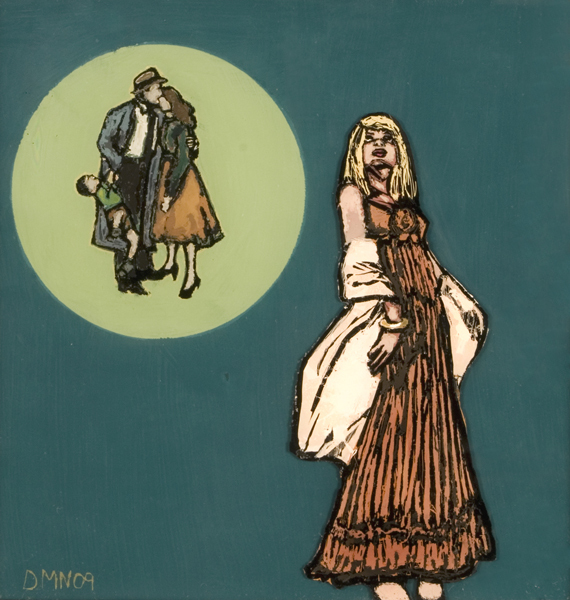 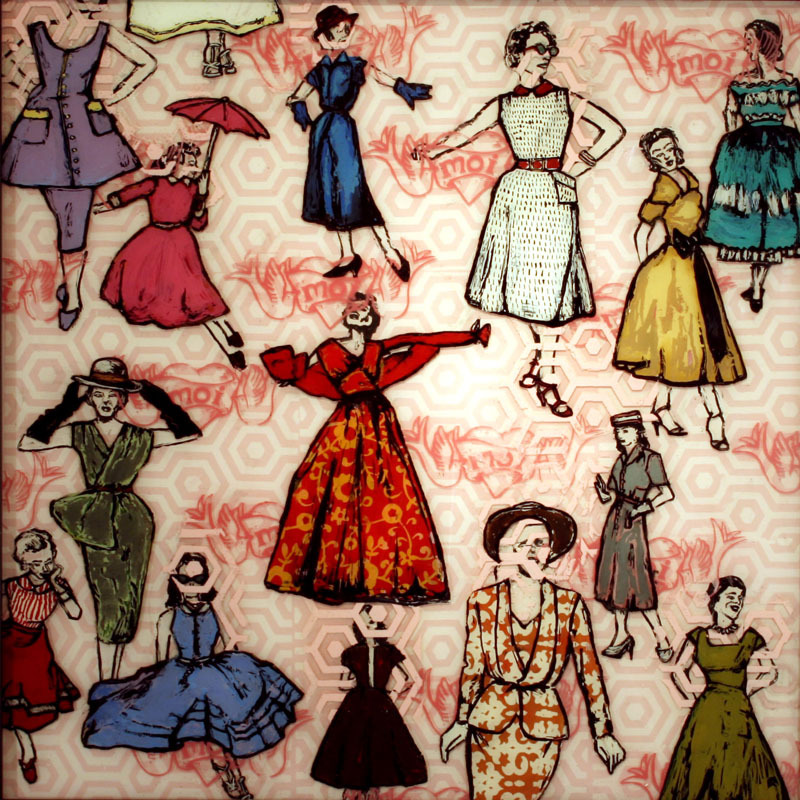 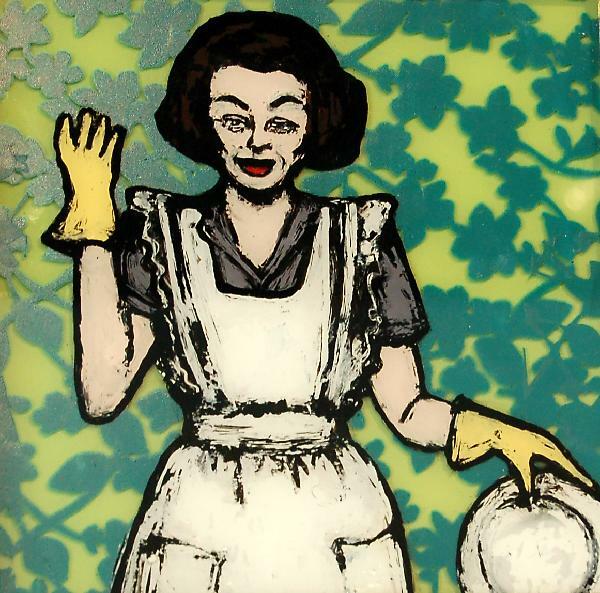 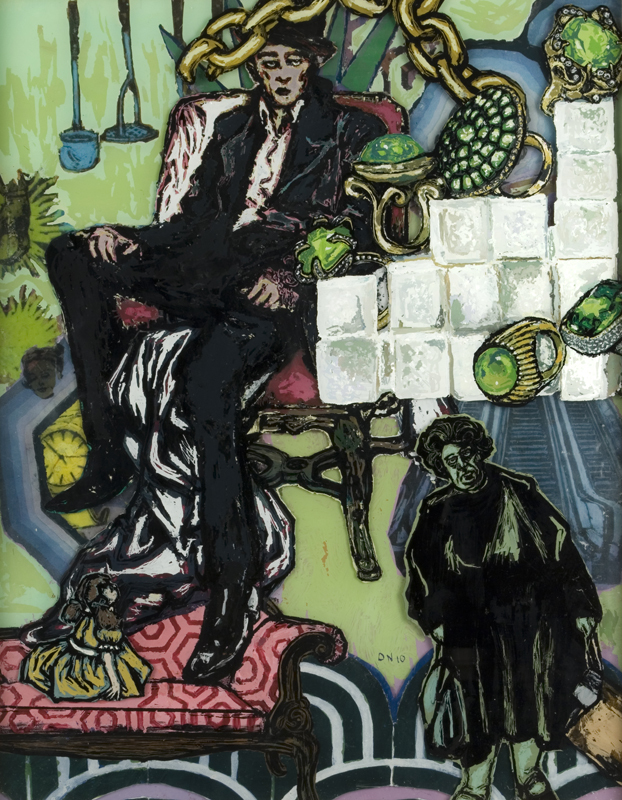 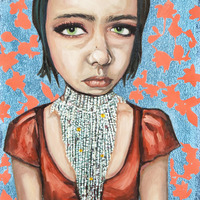 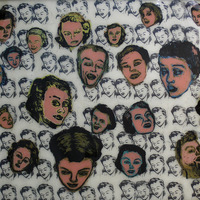 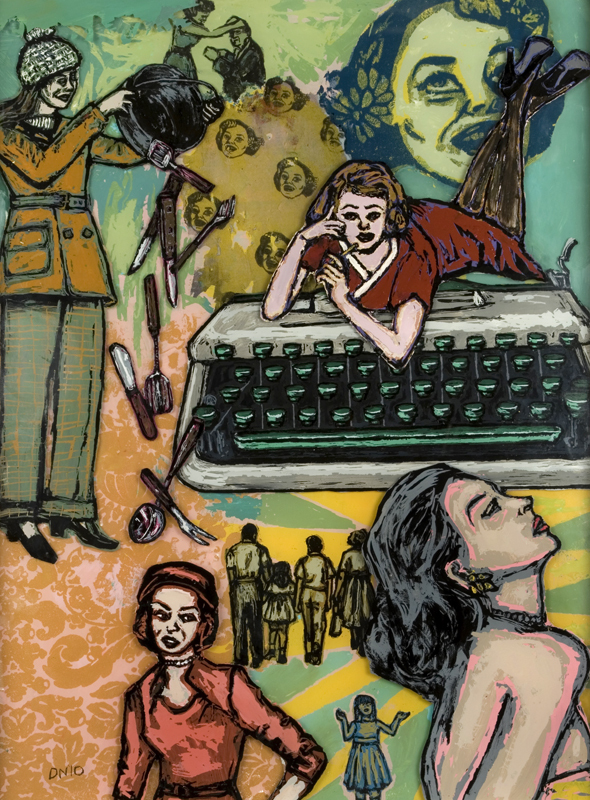 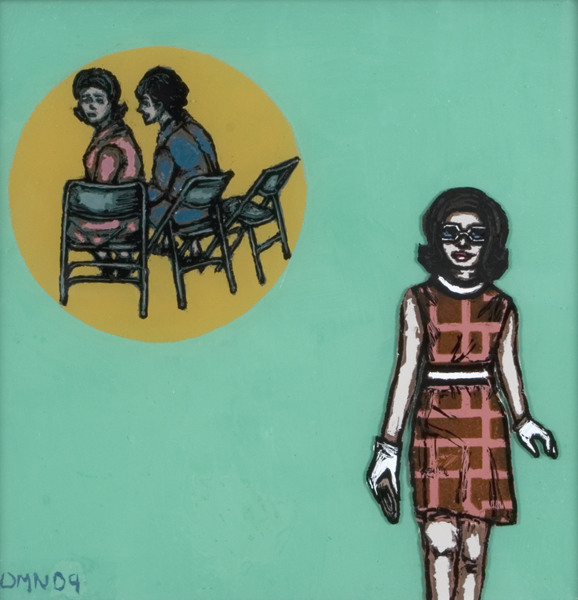 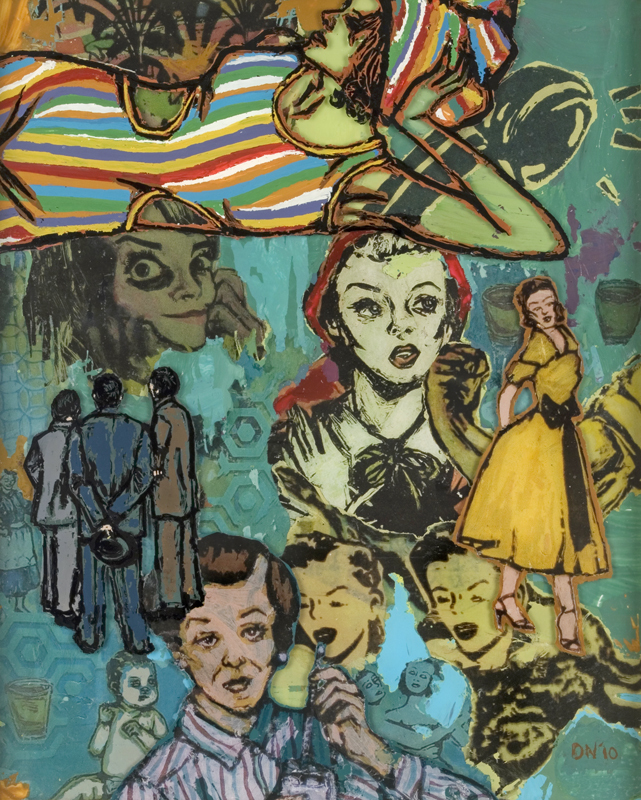 Paper Doll, 2010, 6"x6", Ink, acrylic, screenprint and ink transfer on three panes of glass. 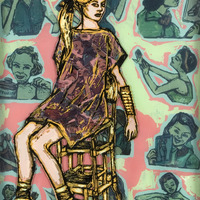 Poser 1, 2010, 12"x9", Ink, acrylic and ink transfer on two panes of glass. 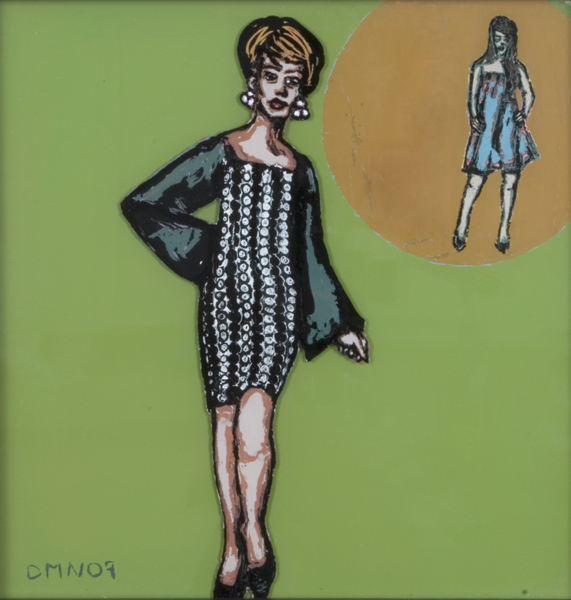 Poser 2, 2010, 12"x9", Ink, acrylic and ink transfer on two panes of glass. 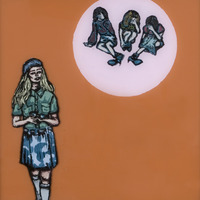 Camo, 2010, 16"x12", Ink, acrylic, screenprint and ink transfer on three panes of glass. 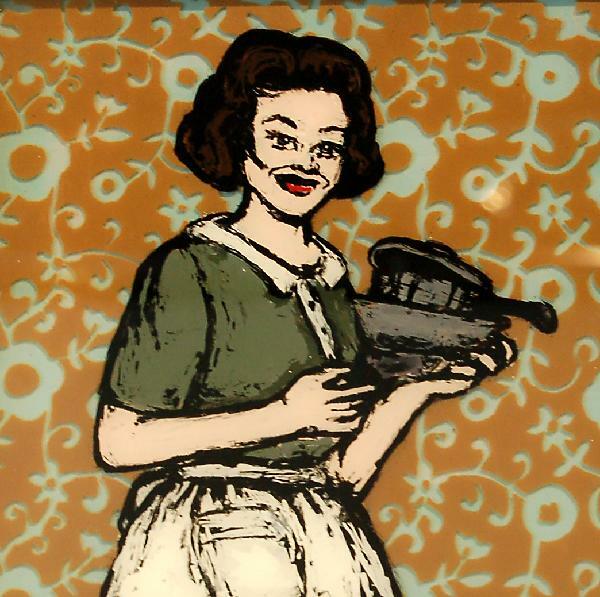 Pop Tart, 2010, 16"x12", Ink, acrylic, screenprint and ink transfer on three panes of glass. 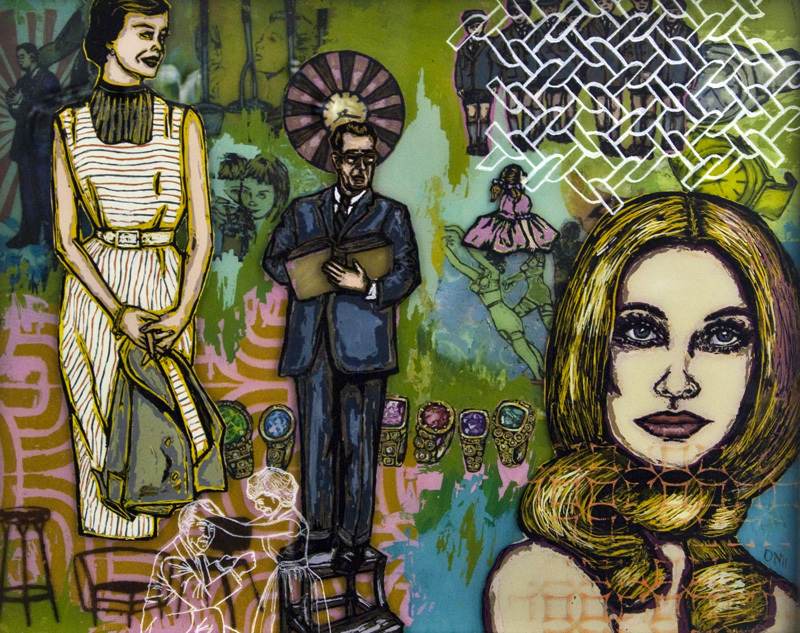 Full Disclosure, 2010, 16"x12", Ink, acrylic, screenprint and ink transfer on three panes of glass. A Failure to Communicate, 2010, 12"x12", Ink, acrylic, screenprint and ink transfer on three panes of glass. 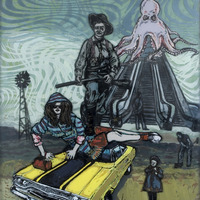 Big and Strong, 2010, 10"x8", Ink, acrylic, screenprint and ink transfer on three panes of glass. 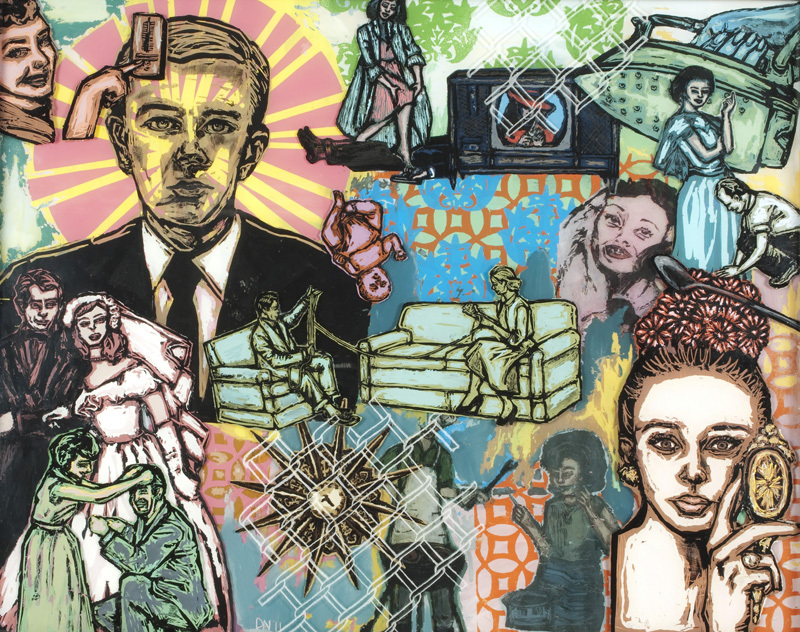 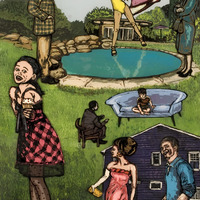 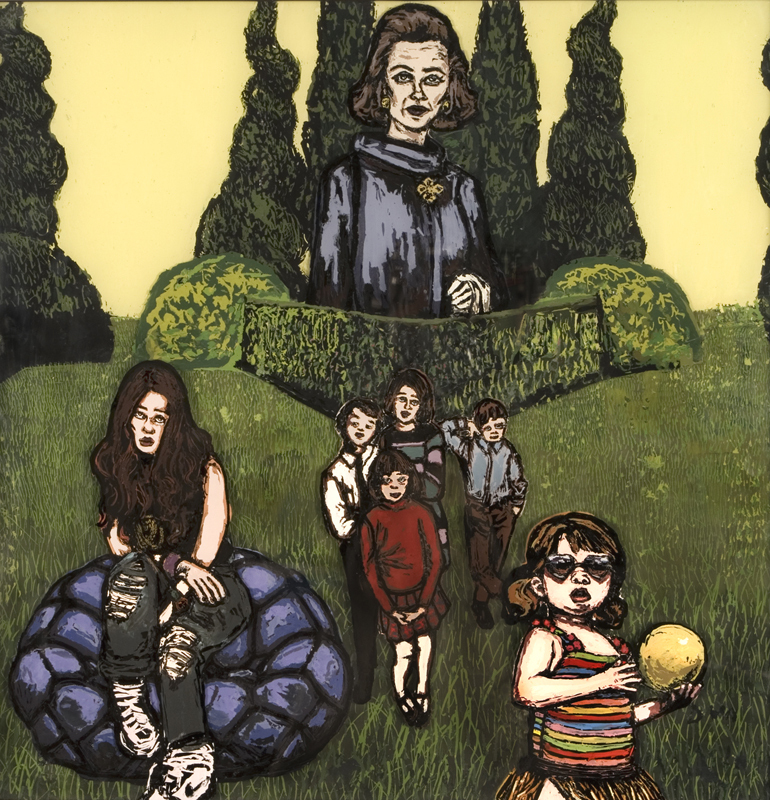 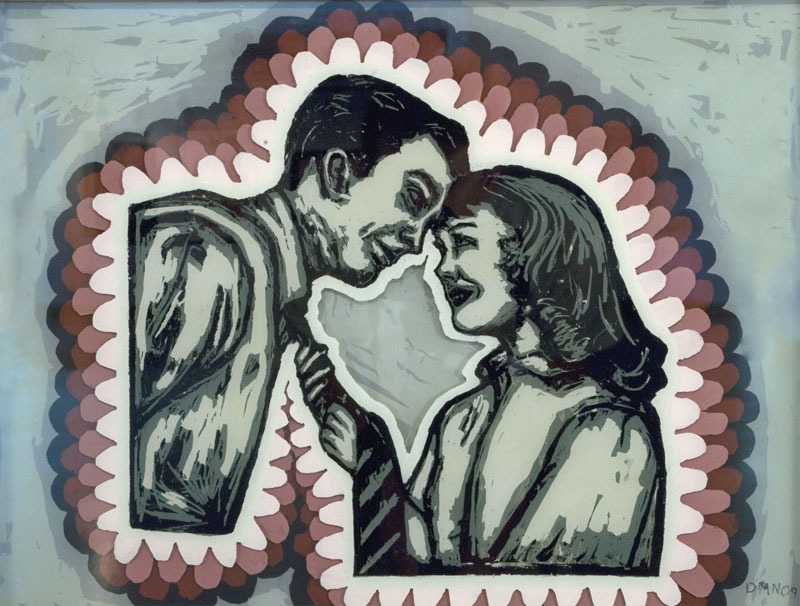 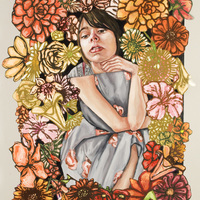 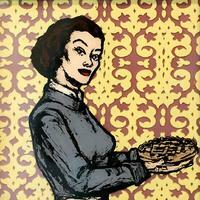 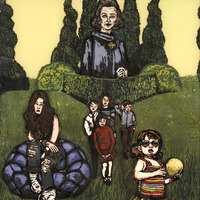 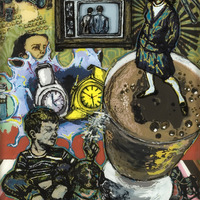 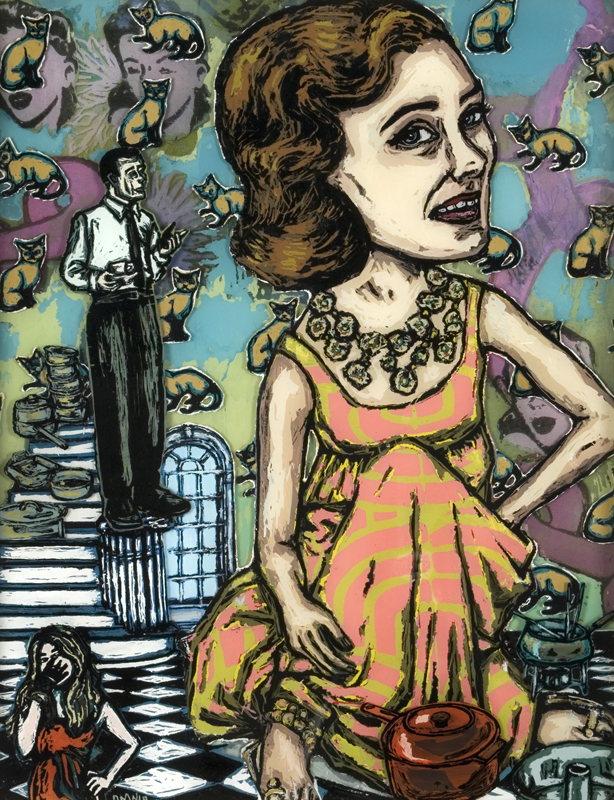 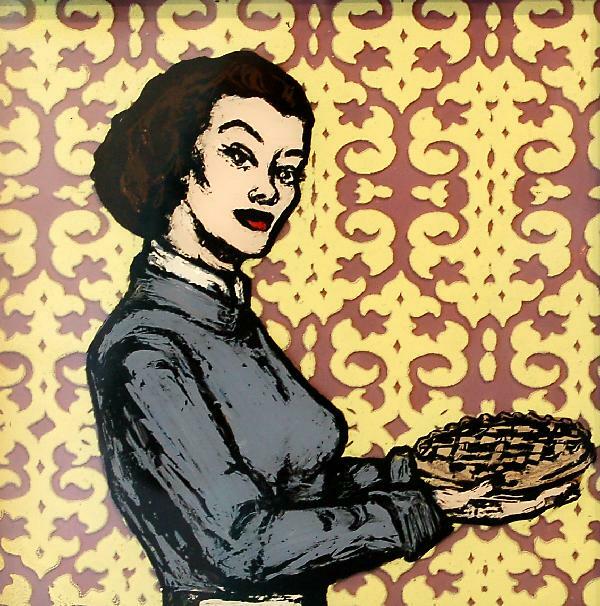 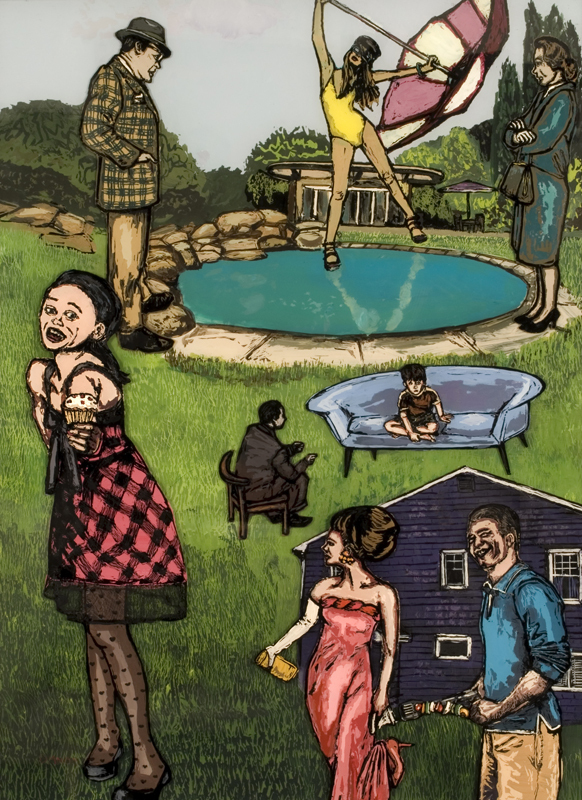 The Sweet Life, 2010, 14"x11", Ink, acrylic, screenprint and ink transfer on three panes of glass. 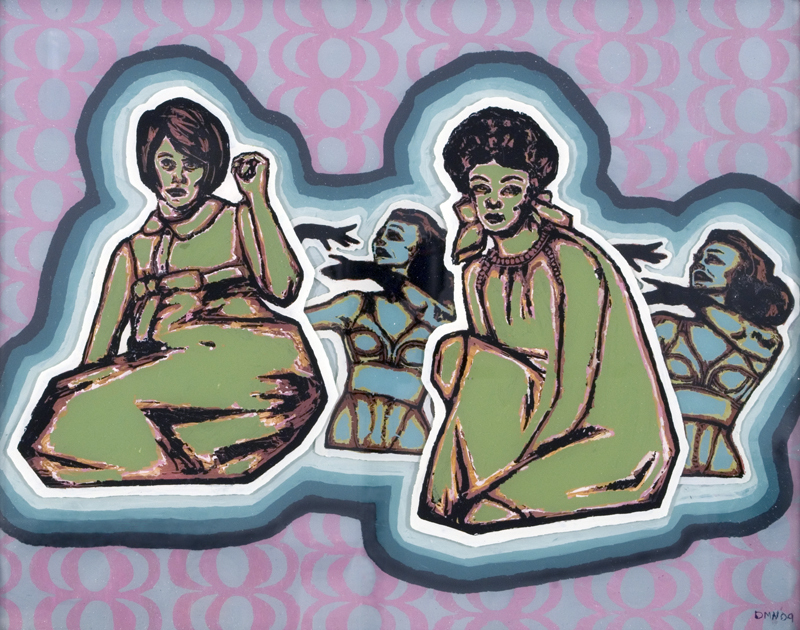 Twin Set, 2010, 14"x11", Ink, acrylic, screenprint and ink transfer on three panes of glass. 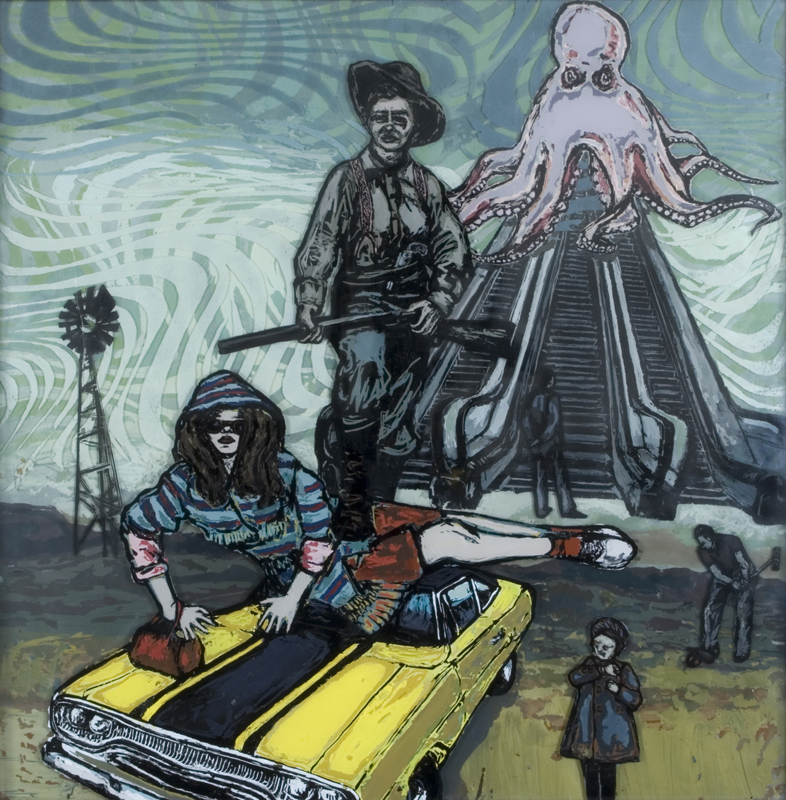 The Slick And The Dead, 2009, 14"x14", Ink, acrylic and screenprint on three panes of glass. 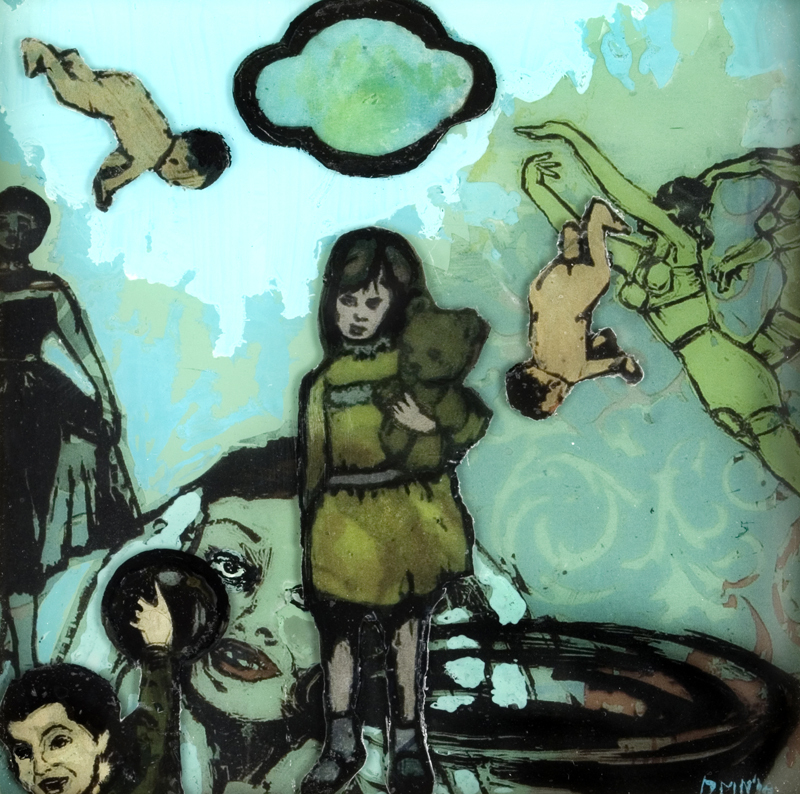 Oh, The Places You'll Go, 2009, 24"x18", Ink and acrylic on three panes of glass. 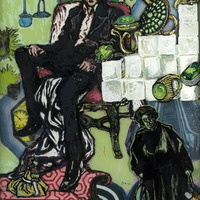 The Conversation, 2009, 24"x18", Ink and acrylic on three panes of glass. 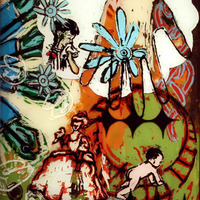 The Little Island, 2009, 24"x18", Ink, acrylic and screenprint on three panes of glass. 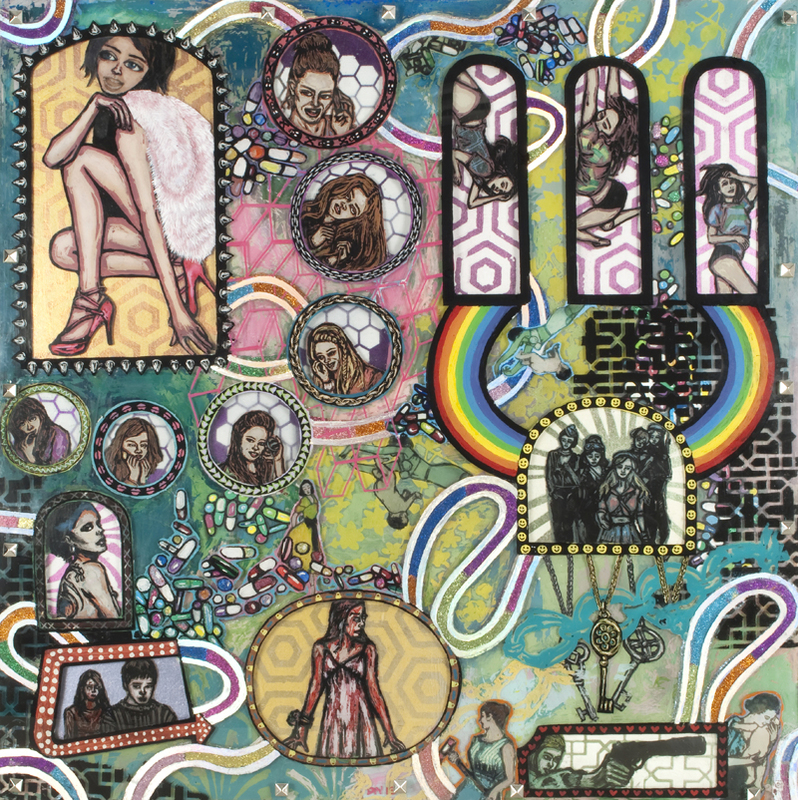 My Generation, 2009, 14"x14", Ink and acrylic on three panes of glass. 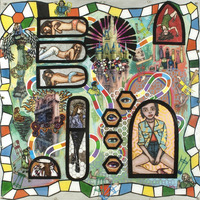 Dreamliners 1, 2009, 16"x20", Ink, acrylic and screenprint on three panes of glass. 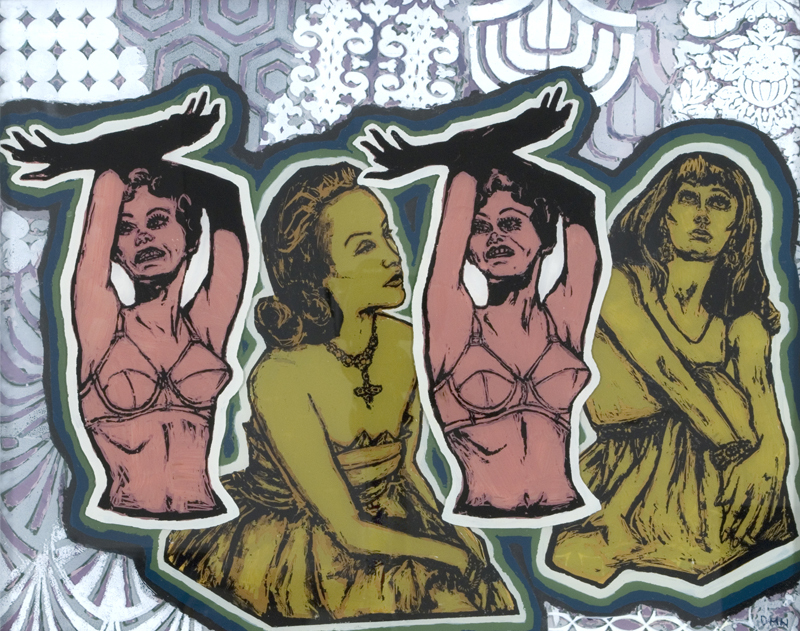 Dreamliners 2, Ink, acrylic and screenprint on three panes of glass. 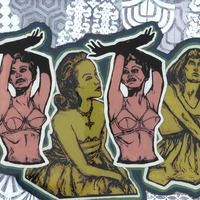 Freedom Dreamers 1, 2009, 16"x20", Ink, acrylic and screenprint on three panes of glass. 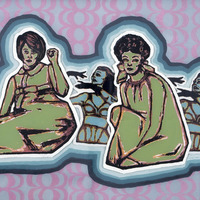 Freedom Dreamers 2, 2009, 16"x20", Ink, acrylic and screenprint on three panes of glass. 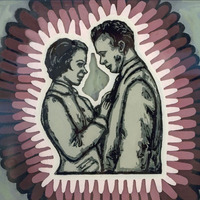 Unconditional Love 1, 2009, 14"x11", Ink, acrylic and screenprint on three panes of glass. 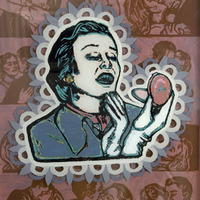 Unconditional Love 2, 2009, 14"x11", Ink, acrylic and screenprint on three panes of glass. 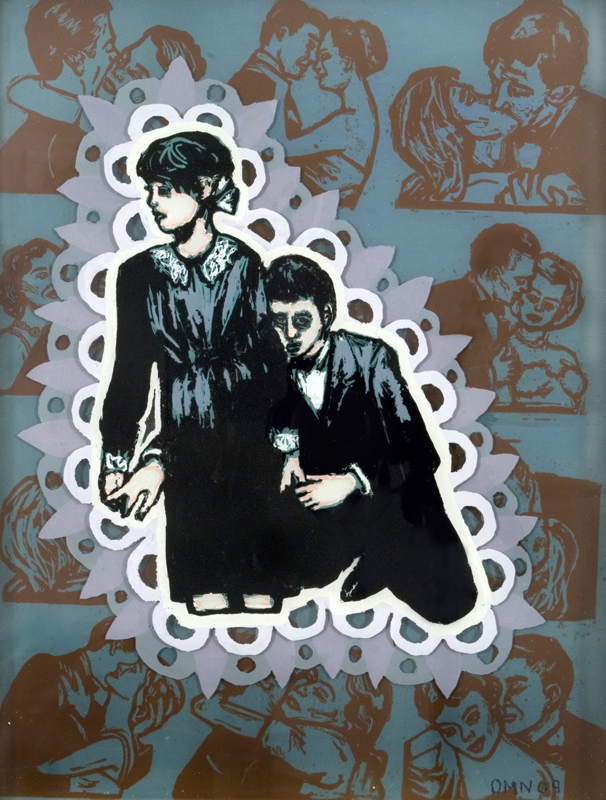 Alone With You 1, 2009, 14"x11", Ink, acrylic and screenprint on three panes of glass. 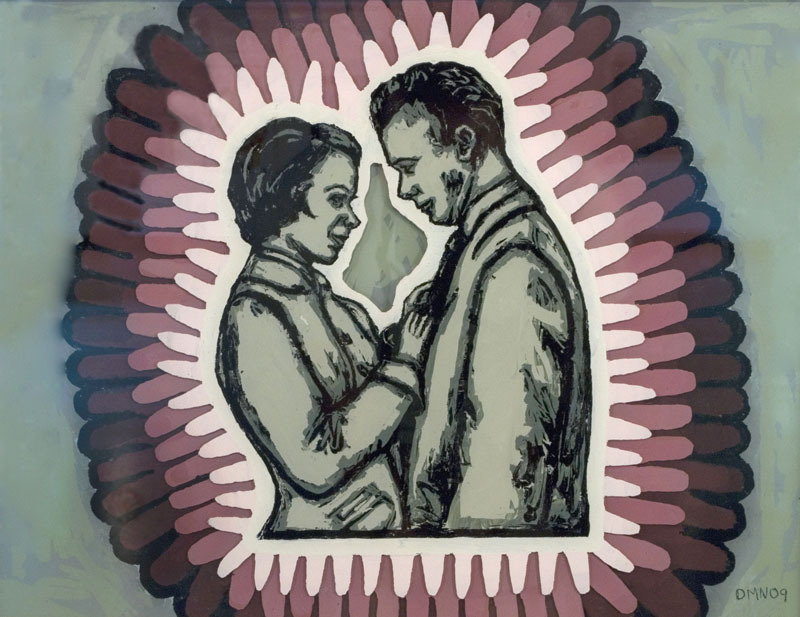 Alone With You 2, 2009, 14"x11", Ink, acrylic and screenprint on three panes of glass. 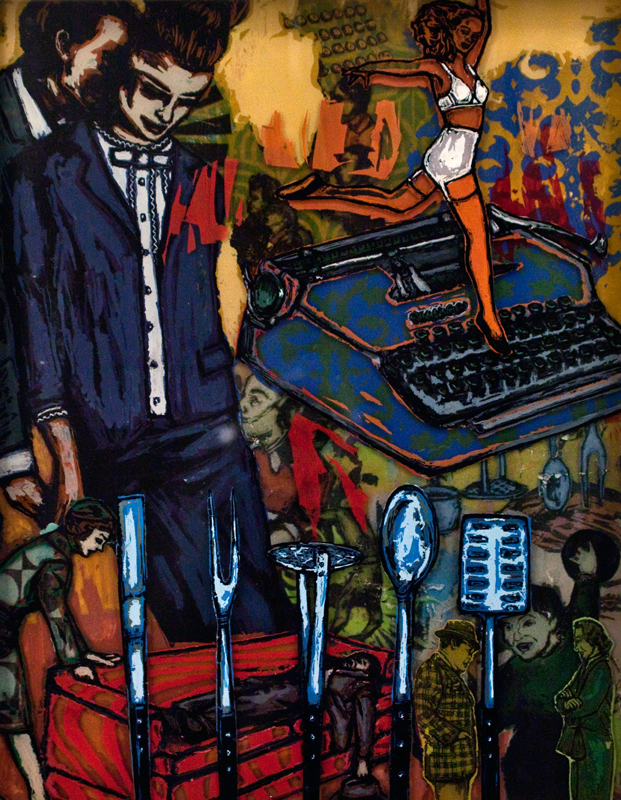 No, I Love You More 1, 2009, 12"x16", Ink and acrylic on three panes of glass. 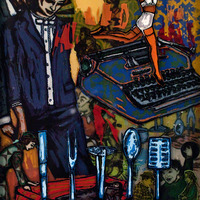 No, I Love You More 2, 2009, 12"x16", Ink and acrylic on three panes of glass. 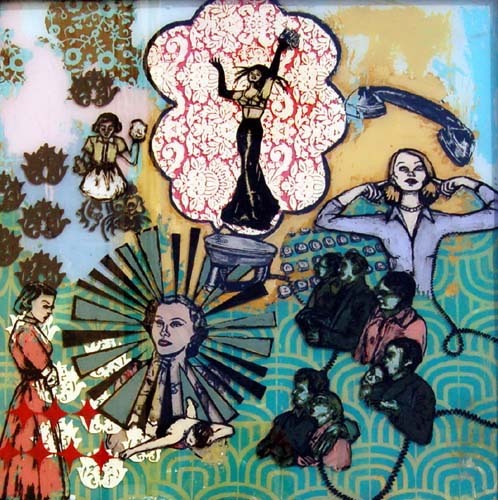 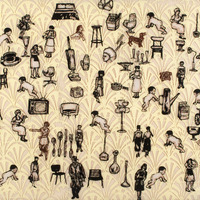 For Example 1 (phone wires), 2009, 24"x24", Ink, acrylic and screenprint on three panes of glass. 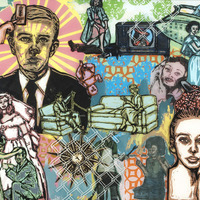 For Example 2 (pearls), 2009, 24"x24", Ink, acrylic and screenprint on three panes of glass. 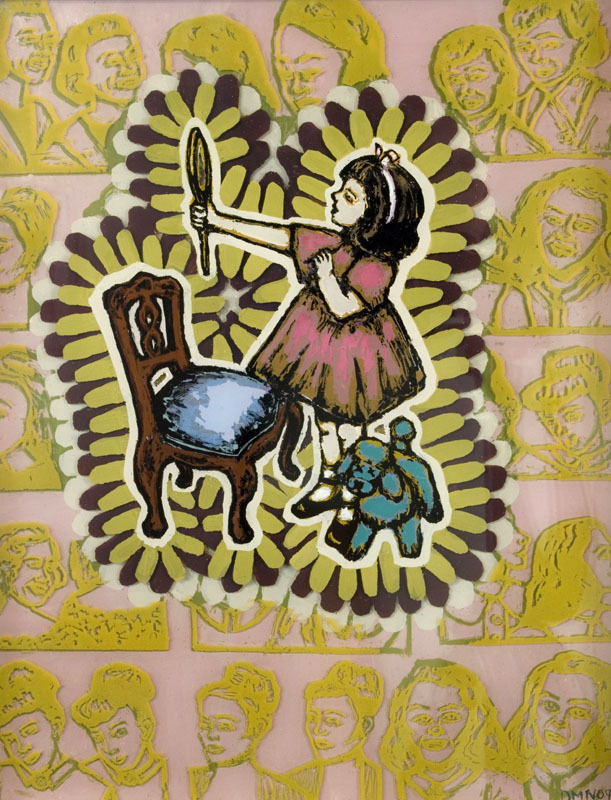 When You Were A Little Girl 1, 2009, 15"x15", Ink, acrylic and screenprint on three panes of glass. 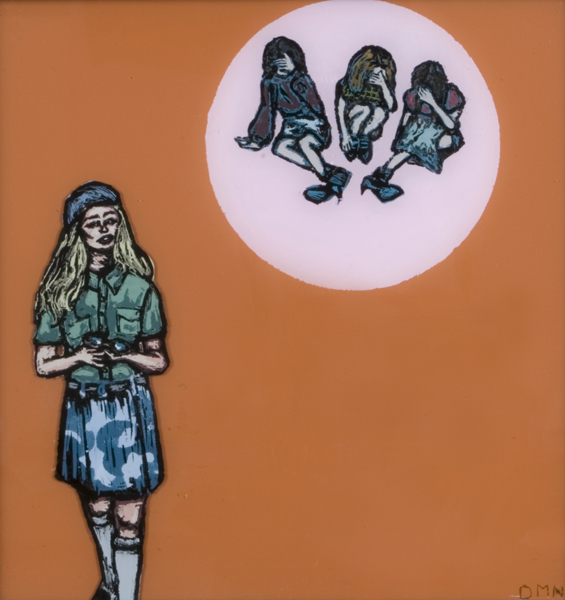 When You Were A Little Girl 2, 2009, 15"x15", Ink, acrylic and screenprint on three panes of glass. 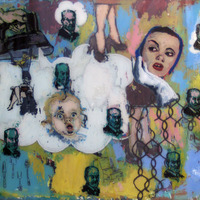 Blissful Oblivion 1, 2009, 14"x11", Ink and acrylic on two panes of glass. 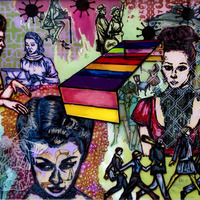 Blissful Oblivion 2, 2009, 14"x11", Ink and acrylic on two panes of glass. 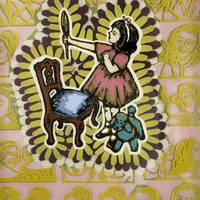 She Made It After All 1, 2009, 8"x8", Ink, acrylic and screenprint on two panes of glass. 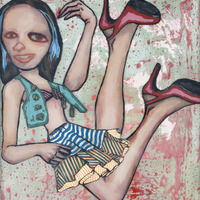 She Made It After All 2, 2009, 8"x8", Ink and acrylic on two panes of glass. 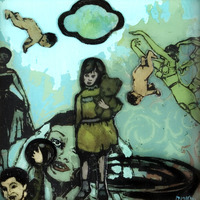 She Made It After All 3, 2009, 8"x8", Ink and acrylic on two panes of glass. 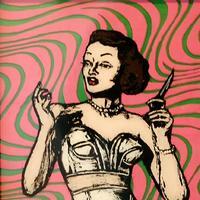 She Made It After All 4, 2009, 8"x8", Ink, acrylic and screenprint on two panes of glass. 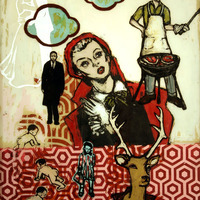 She Made It After All 5, 2009, 8"x8", Ink, acrylic and screenprint on two panes of glass. 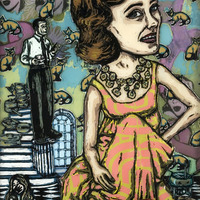 She Made It After All 6, 2009, 8"x8", Ink, acrylic and screenprint on two panes of glass. 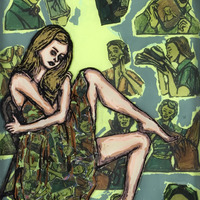 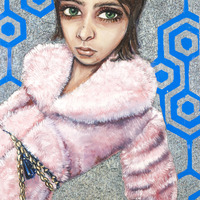 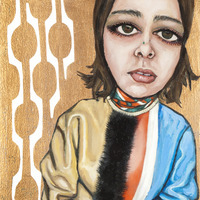 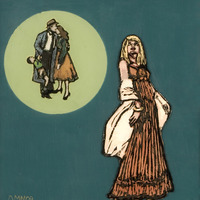 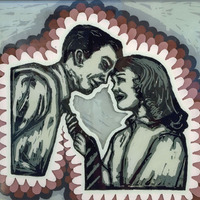 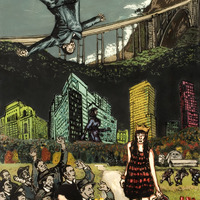 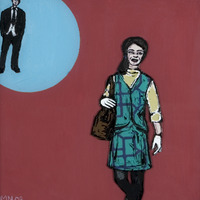 She Made It After All 7, 2009, 8"x8", Ink and acrylic on two panes of glass. 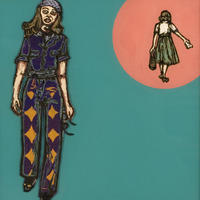 She Made It After All 8, 2009, 8"x8", Ink, acrylic and screenprint on two panes of glass. 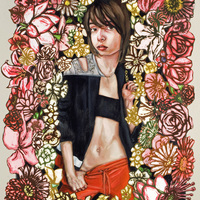 The Hours 1, 2009, 9"diam. 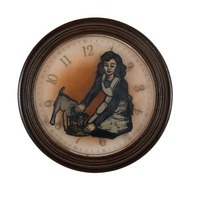 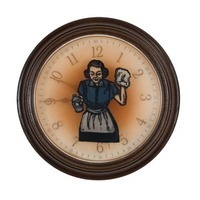 Ink, acrylic and polyurethane in clock. 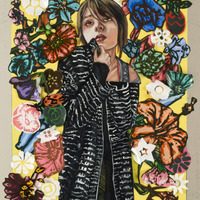 The Hours 3, 2009, 9"diam. 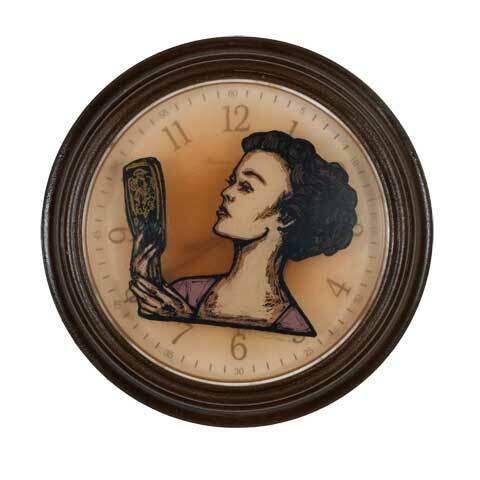 Ink, acrylic and polyurethane in clock. 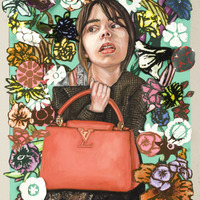 The Hours 2, 2009, 9"diam. 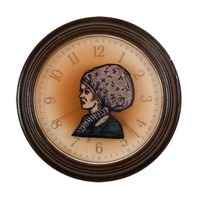 Ink, acrylic and polyurethane in clock. The Hours 4, 2009, 9"diam. 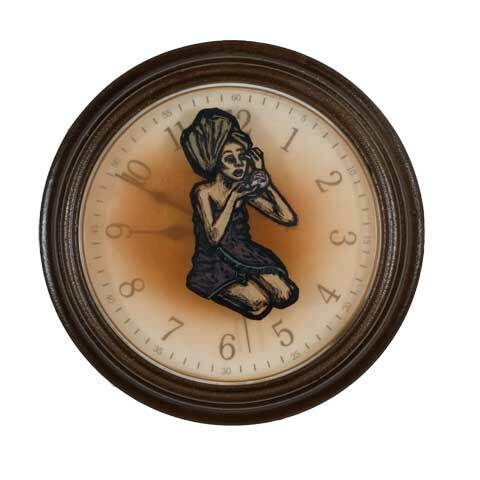 Ink, acrylic and polyurethan in clock. 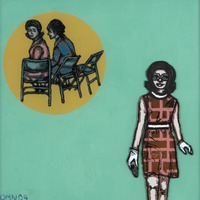 The Hours 5, 2009, 9"diam. 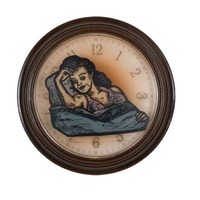 Ink, acrylic and polyurethane in clock. The Hours 6, 2009, 9"diam. 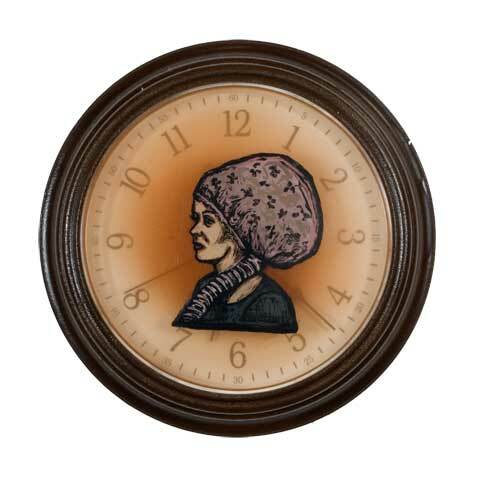 Ink, acrylic and polyurethane in clock. 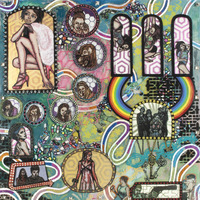 The Hours 7, 2009, 9"diam. 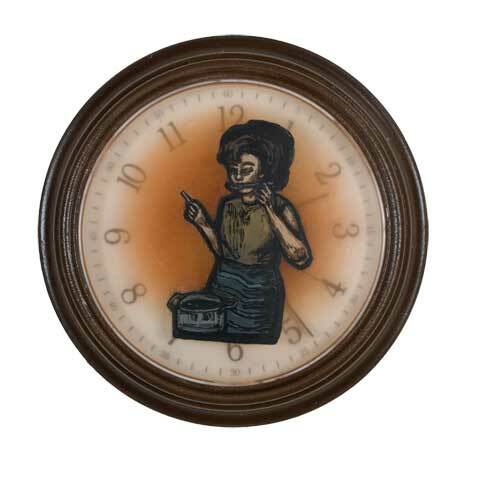 Ink, acrylic and polyurethane in clock. 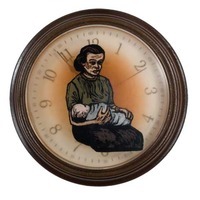 The Hours 11, 2009, 9"diam. 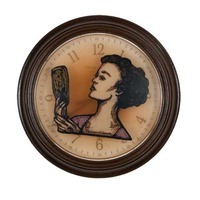 Ink, acrylic and polyurethane in clock. 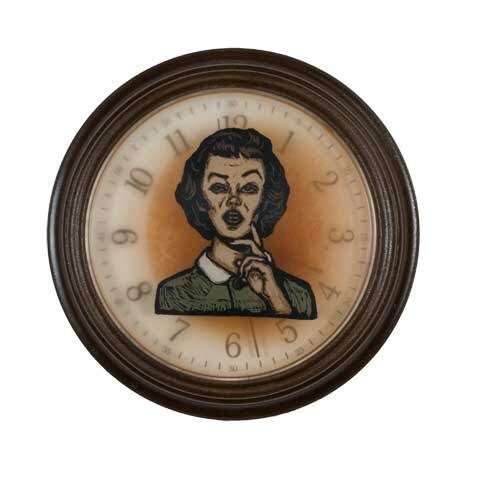 The Hours 8, 2009, 9"diam. 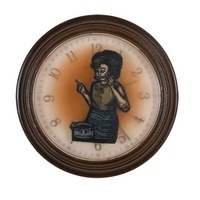 Ink, acrylic and polyurethane in clock. 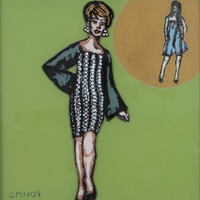 The Hours 9, 2009, 9"diam. 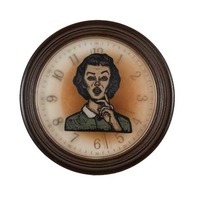 Ink, acrylic and polyurethane in clock. The Hours 10, 2009, 9"diam. 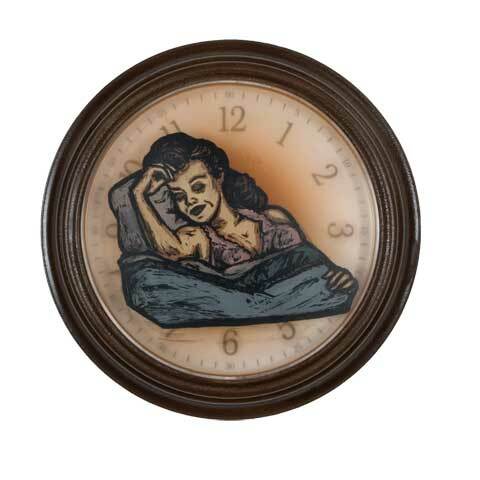 Ink, acrylic and polyurethane in clock. 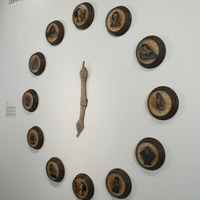 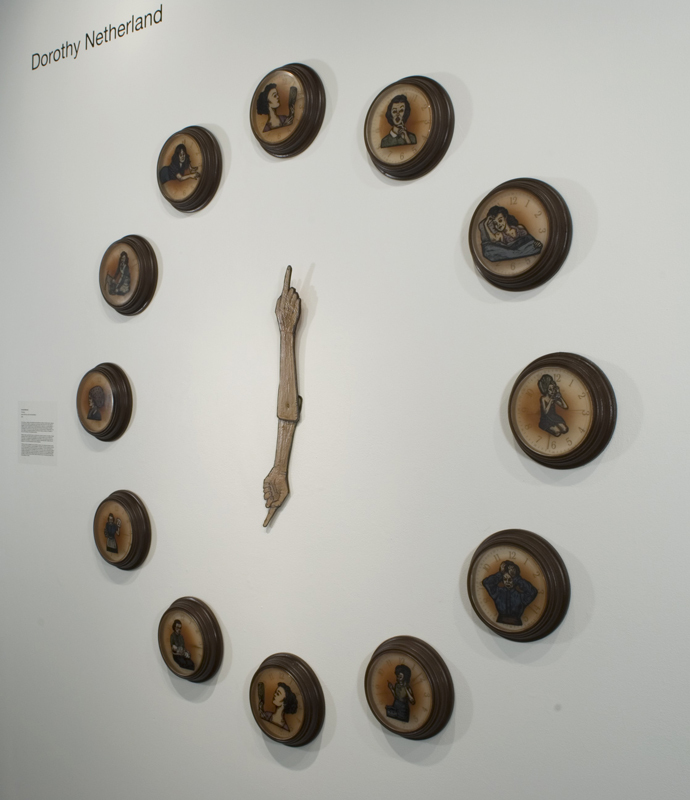 Installation view of The Hours 1-12 at Redux Contemporary Art Center in Charleston SC for the show Past Presence. 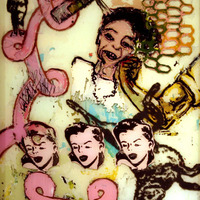 If It Were A Snake, 2008, 20"x16", Ink, acrylic and screenprint on two panes of glass. 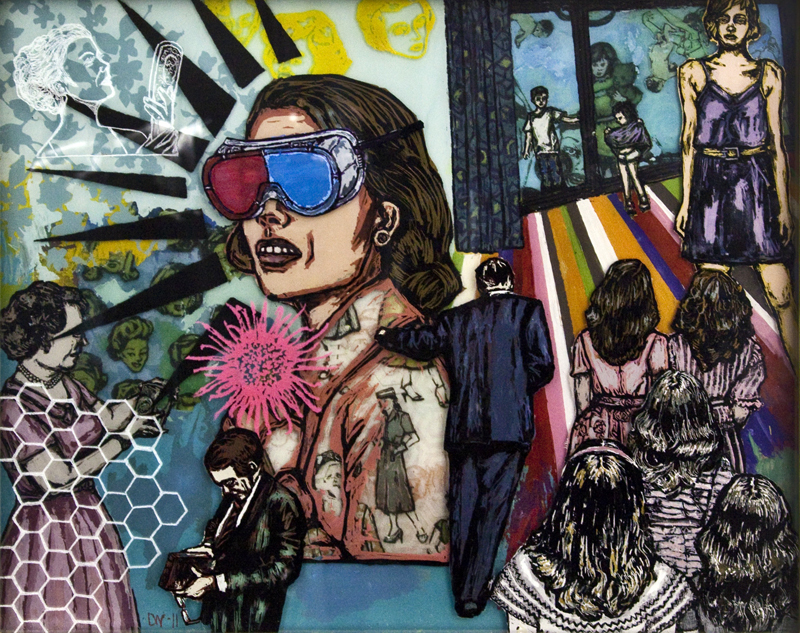 Lost In Space, 2008, 20"x16", Ink, acrylic and screenprint on two panes of glass. 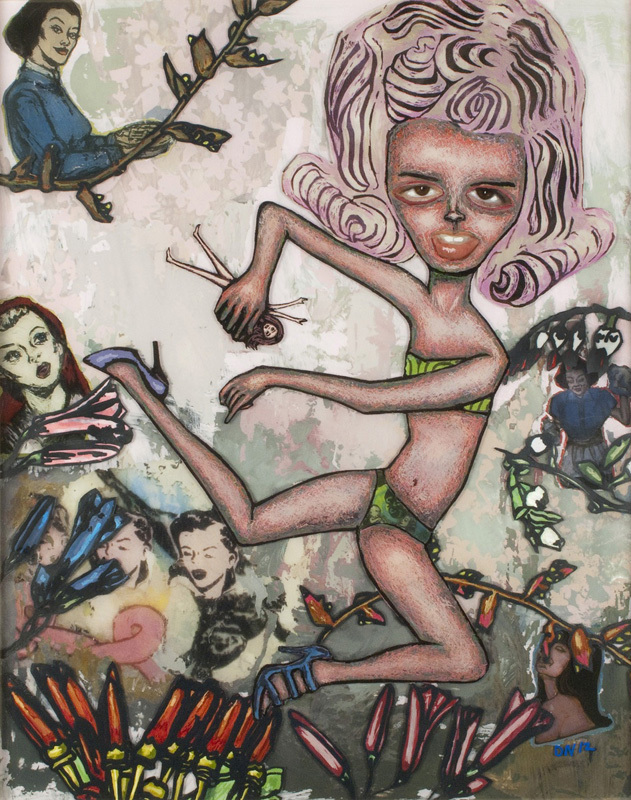 The Pink Stuff Cures All, 2008, 24"x32", Ink, acrylic and screenprint on two panes of glass. 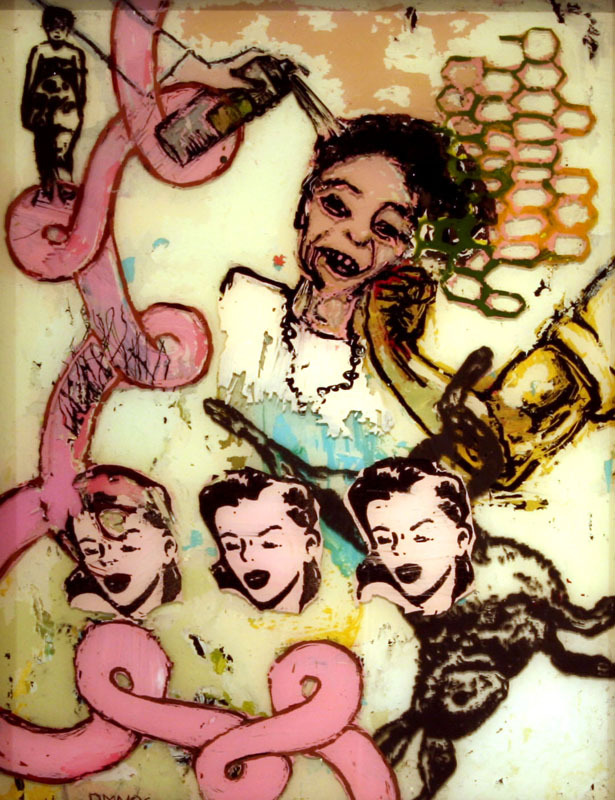 BFF, 2007, 24"x18", Ink, acrylic and screenprint on two panes of glass. 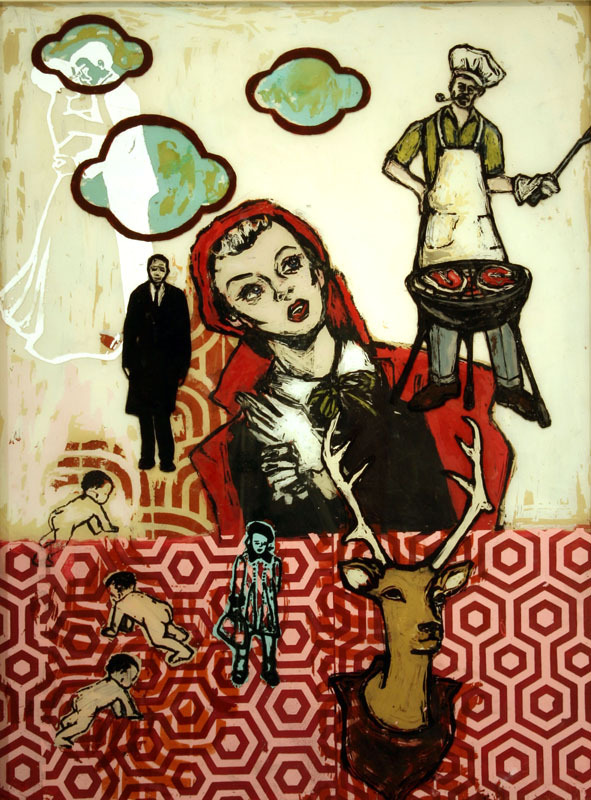 What Red Eyes, 2007, 24"x18", Ink, acrylic and screenprint on two panes of glass. 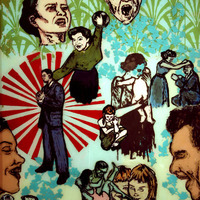 The Chief of Belief, 2007, 18"x24", Ink, acrylic and screenprint on two panes of glass. 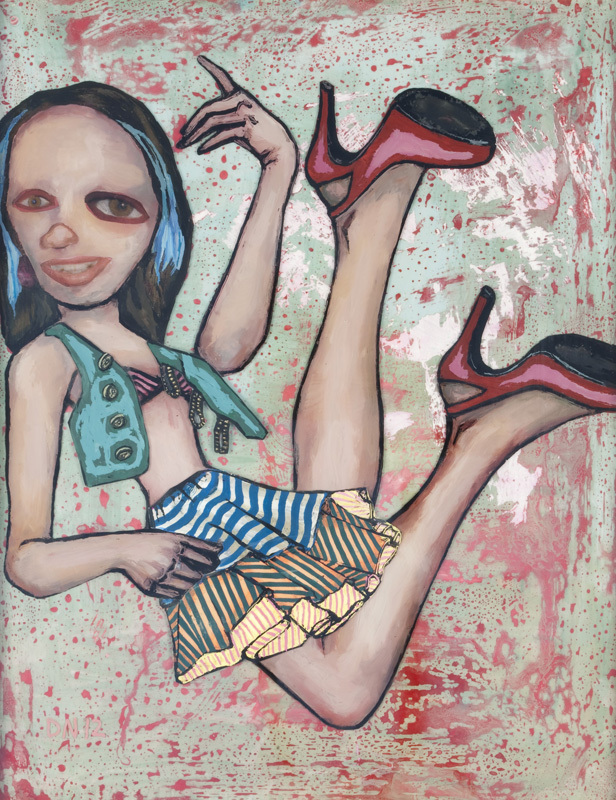 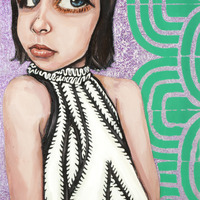 1 2 3, Eyes on Me, 2007, 18"x24", Ink, acrylic and screenprint on two panes of glass. 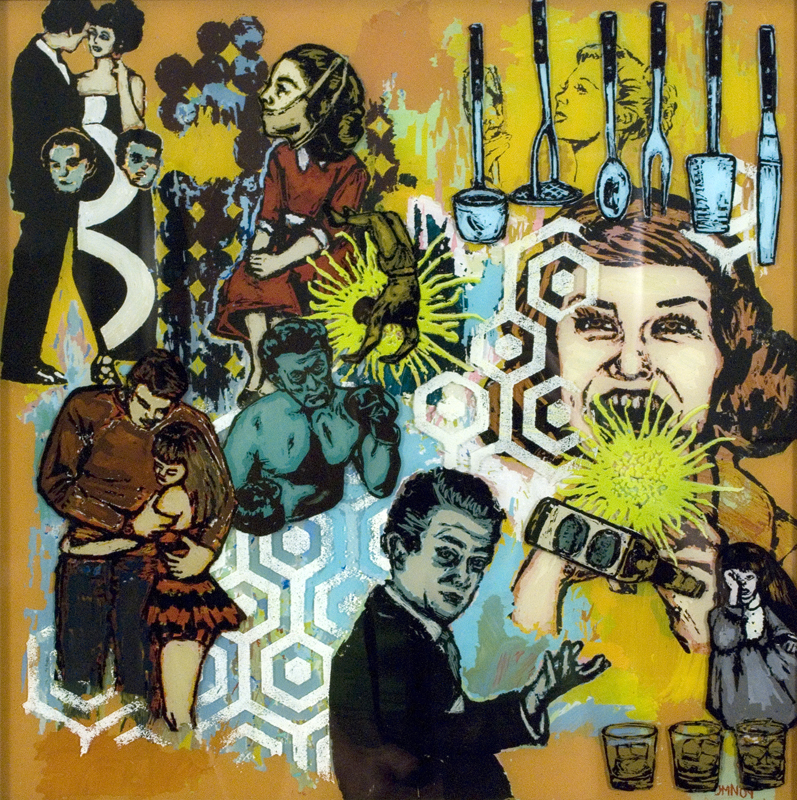 Who Are You, 2007, 24"x24", Ink, acrylic and screenprint on two panes of glass. 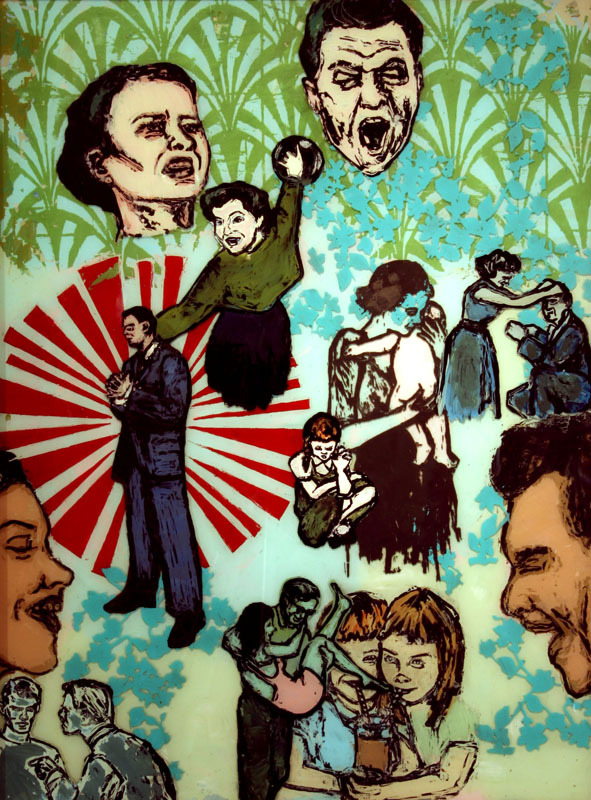 Wish You Were Here 1, 2007, 24"x24", Ink, acrylic and screenprint on two panes of glass. Wish You Were Here 2, 2007, 24"x24", Ink, acrylic and screenprint on two panes of glass. 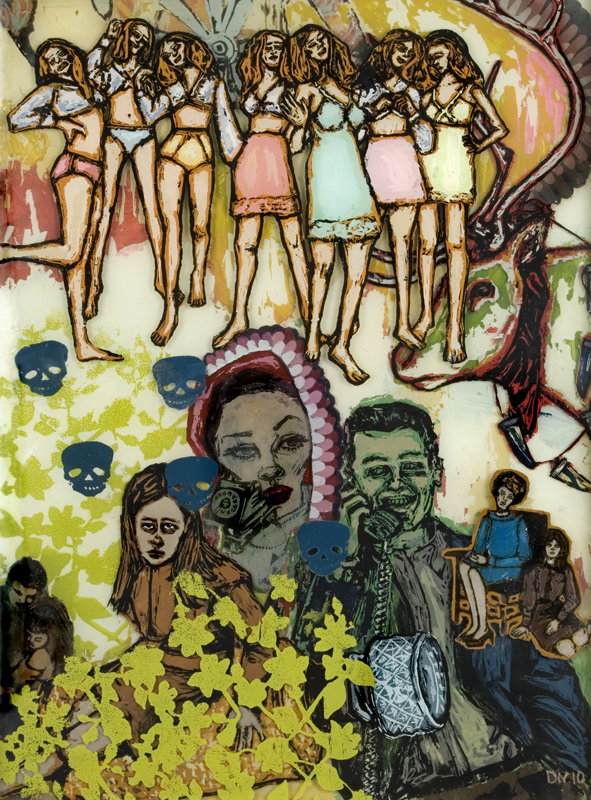 Hoes and Hausfraus 1, 2006, 8"x8", Ink, acrylic and screenprint on two panes of glass. 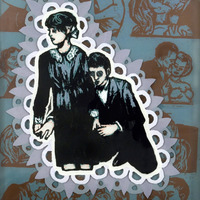 Hoes and hausfraus 2, 2006, 8"x8", Ink, acrylic and screenprint on two panes of glass. 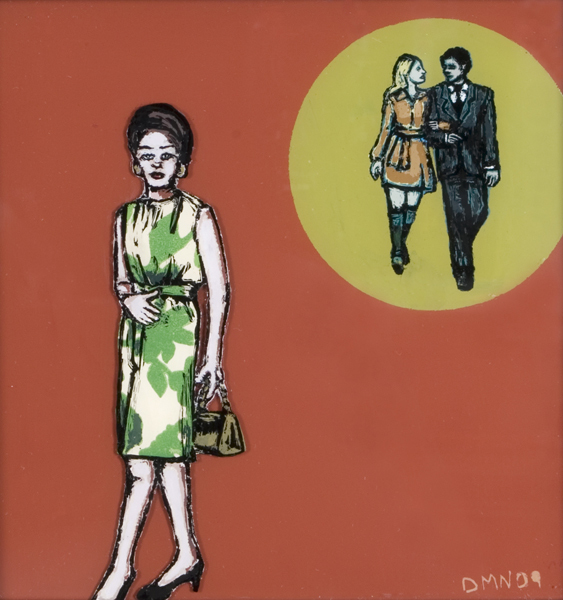 Hoes and Hausfraus 3, 2006, 8"x8", Ink, acrylic and screenprint on two panes of glass. 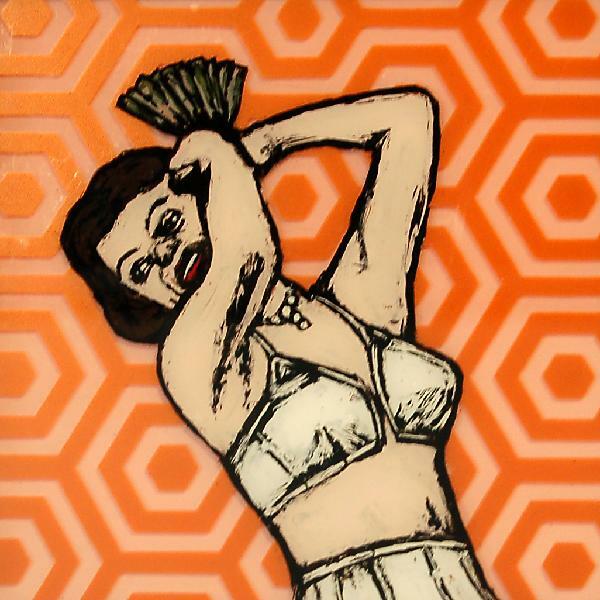 Hoes and Hausfraus 4, 2006, 8"x8", Ink, acrylic and screenprint on two panes of glass. 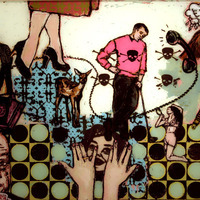 Hoes and Hausfraus 5, 2006, 8"x8", Ink, acrylic and screenprint on two panes of glass. 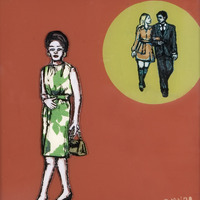 Hoes and Hausfraus 6, 2006, 8"x8", Ink, acrylic and screenprint on two panes of glass. 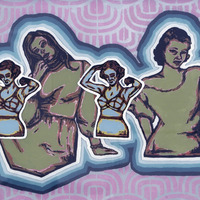 Hoes and Hausfraus 7, 2006, 8"x8", Ink, acrylic and screenprint on two panes of glass. 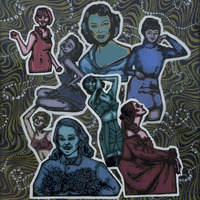 Hoes and Hausfraus 8, 2006, 8"x8", Ink, acrylic and screenprint on two panes of glass. 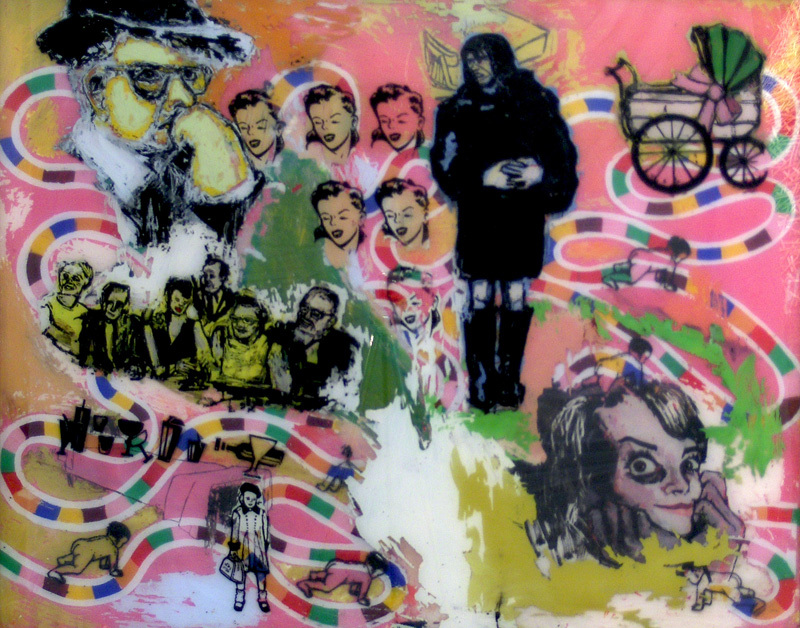 The Way Back Home, 2006, 24"x30", Ink, acrylic and screenprint on two panes of glass. 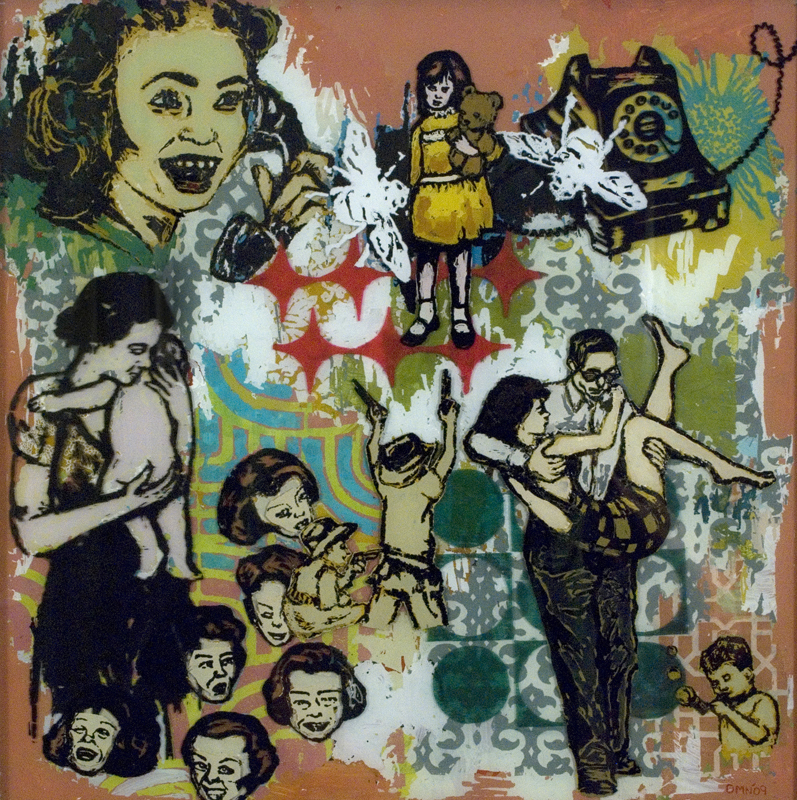 Lucky, 2006, 24"x30", Ink, acrylic and screenprint on two panes of glass. 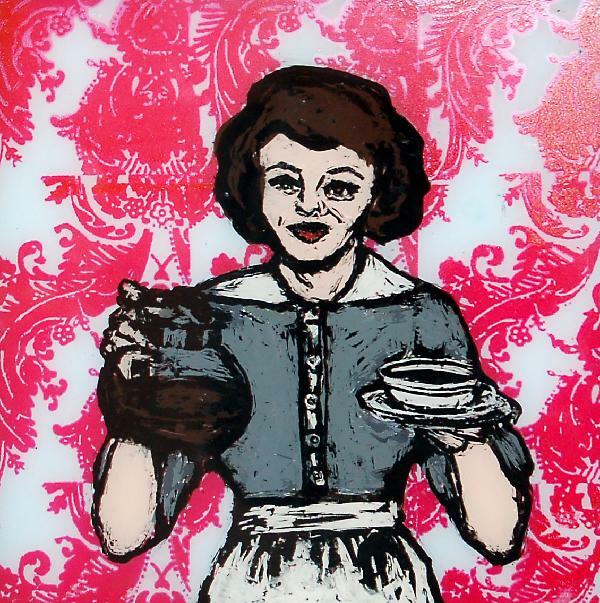 Domestic Shorthairs 2, 2006, 24"x24", Ink, acrylic and screenprint on two panes of glass. 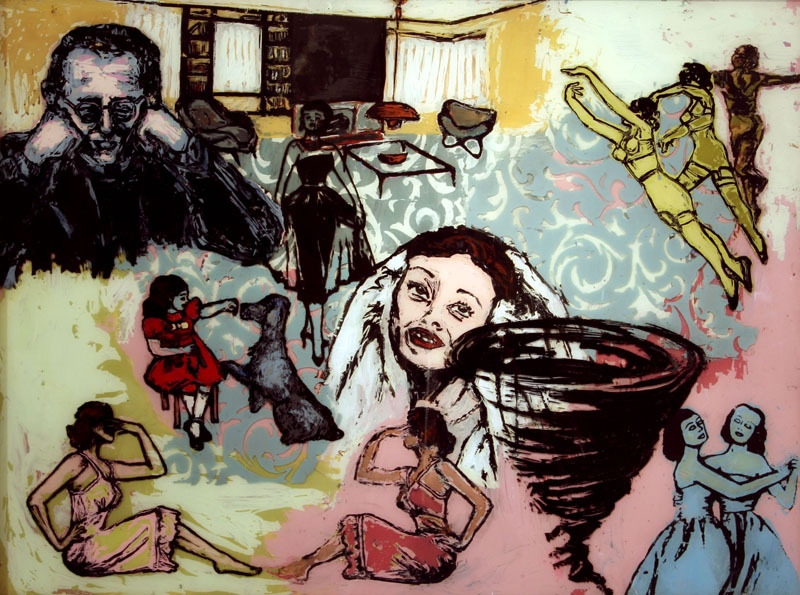 Domestic Shorthairs 1, 2005, 26"x32", Ink, acrylic and screenprint on two panes of glass. 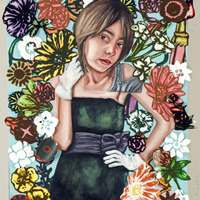 Pristine, 2005, 14"x11", Ink and acrylic on two panes of glass. 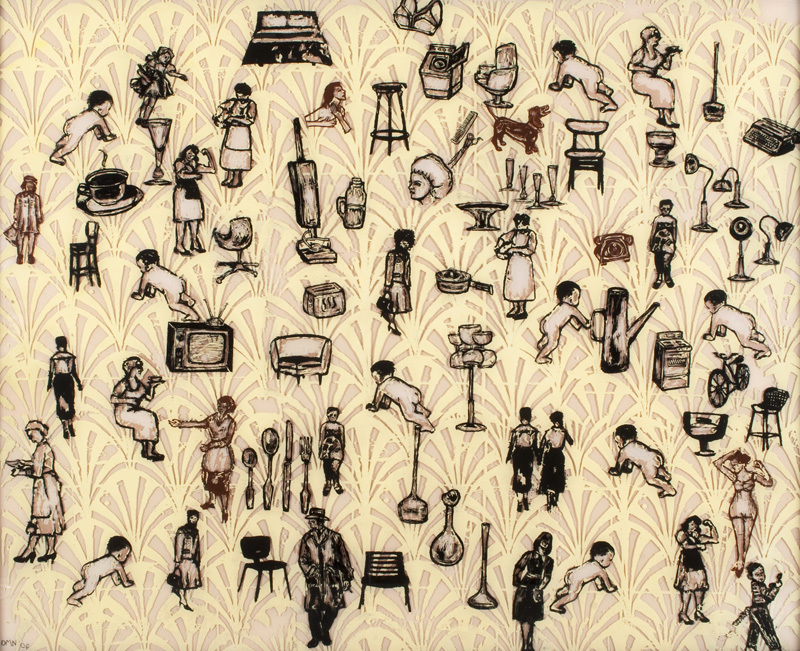 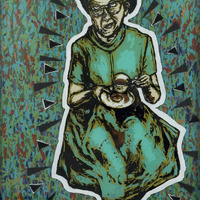 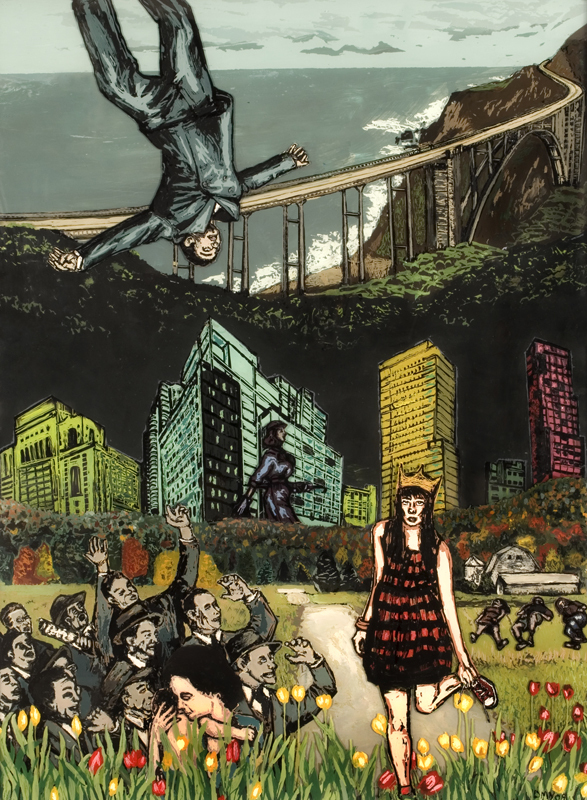 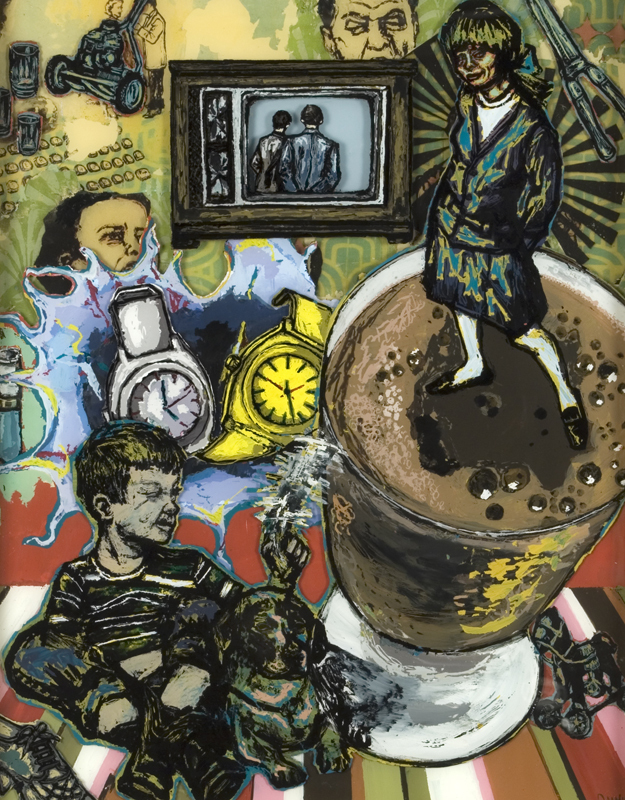 If It's Not One Thing, It's Your Mother, 2005, 26"x32", Ink and acrylic on two panes of glass. 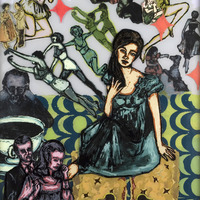 A Classical Sound, 2004, 14"x11", Ink and acrylic on two panes of glass.